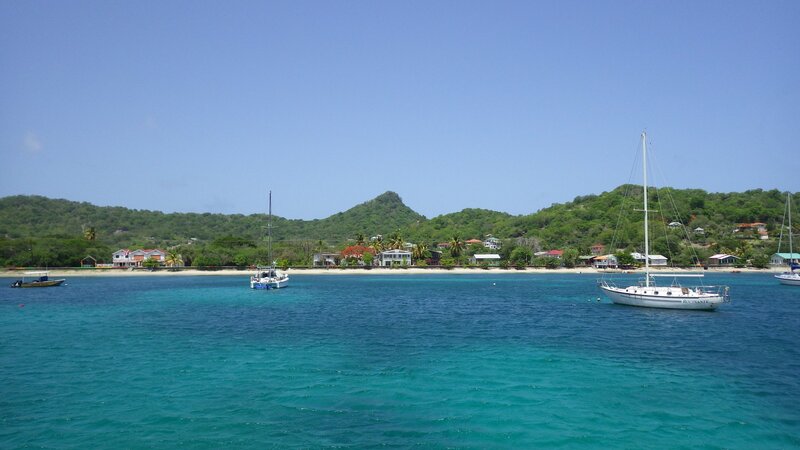 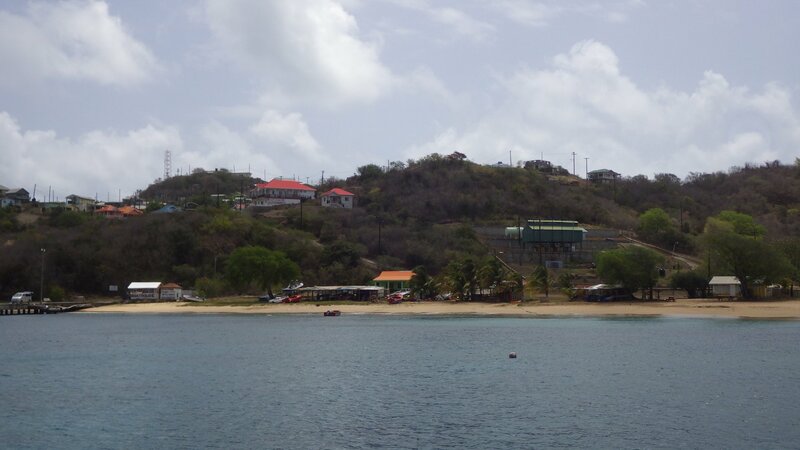 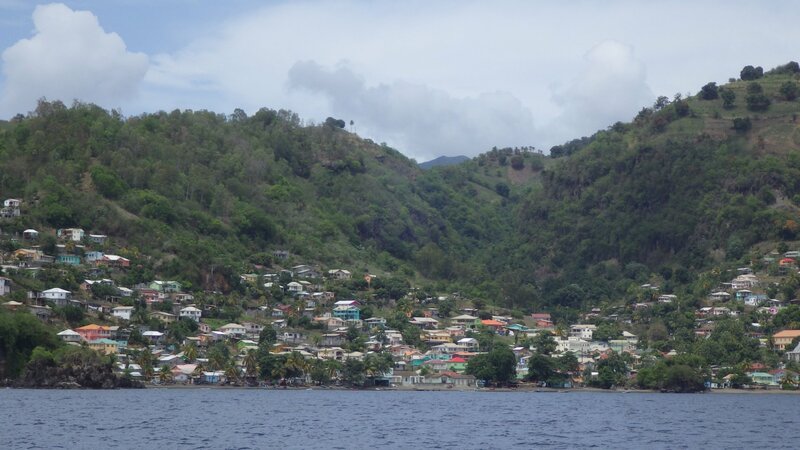 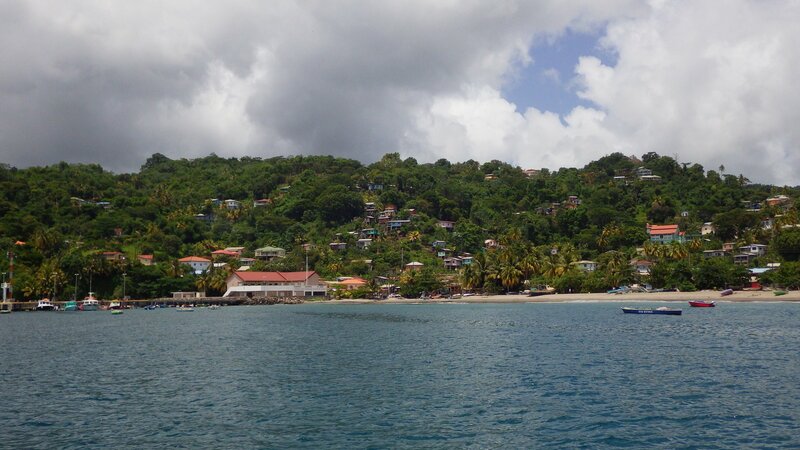 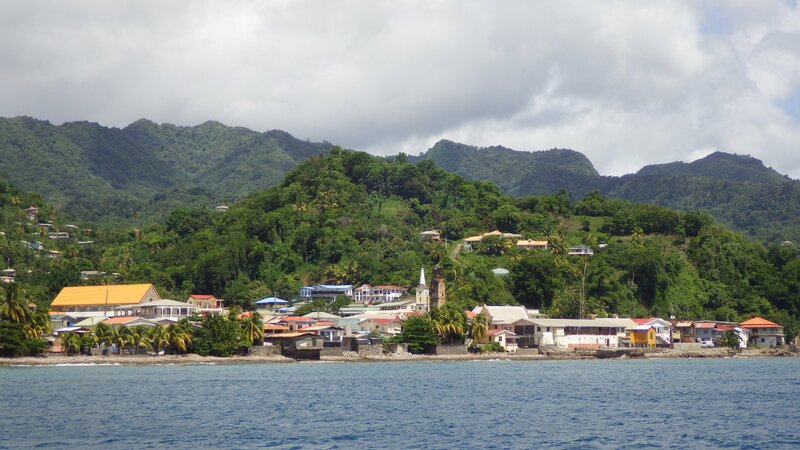 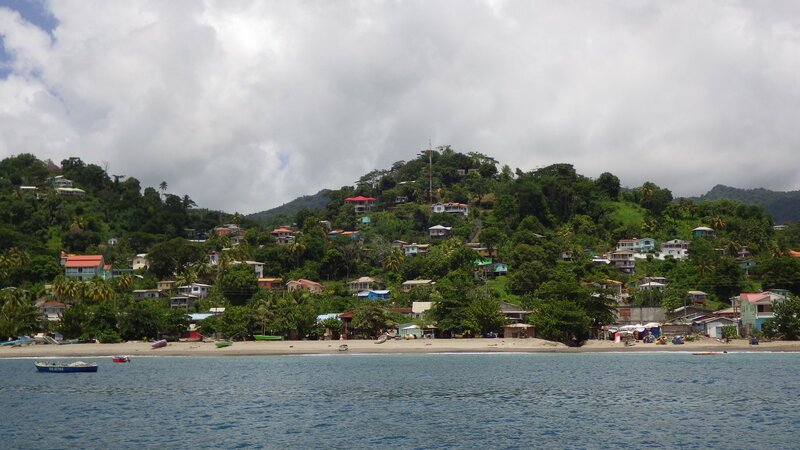 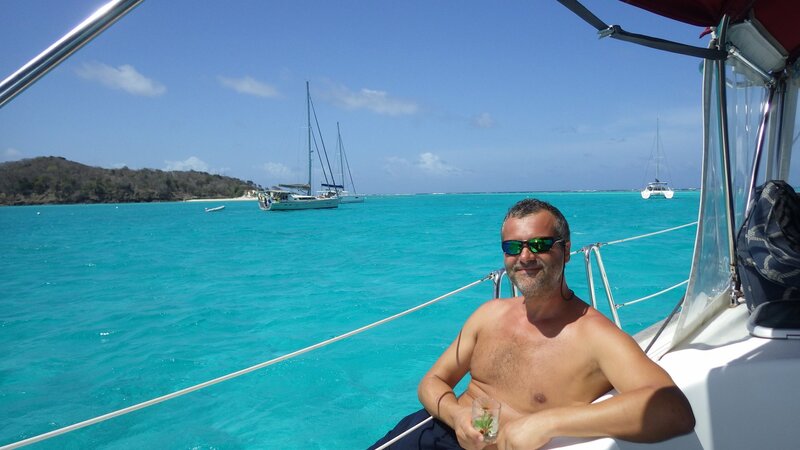 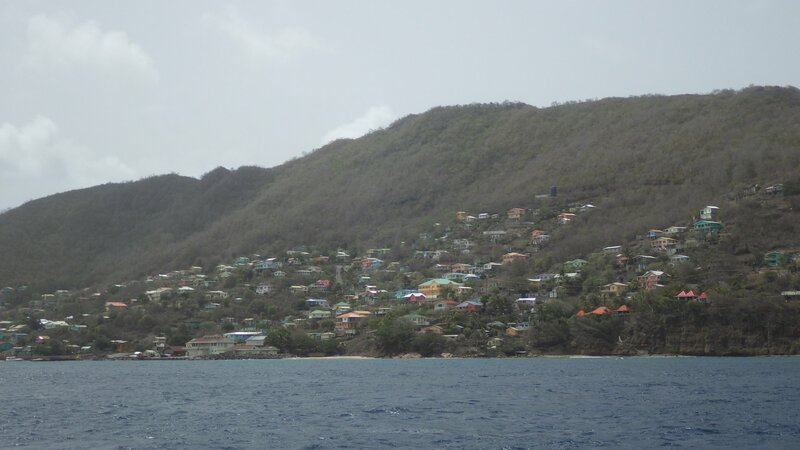 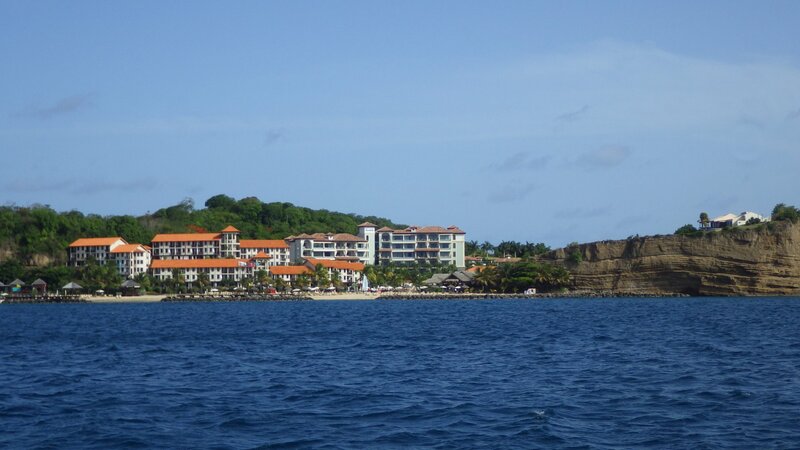 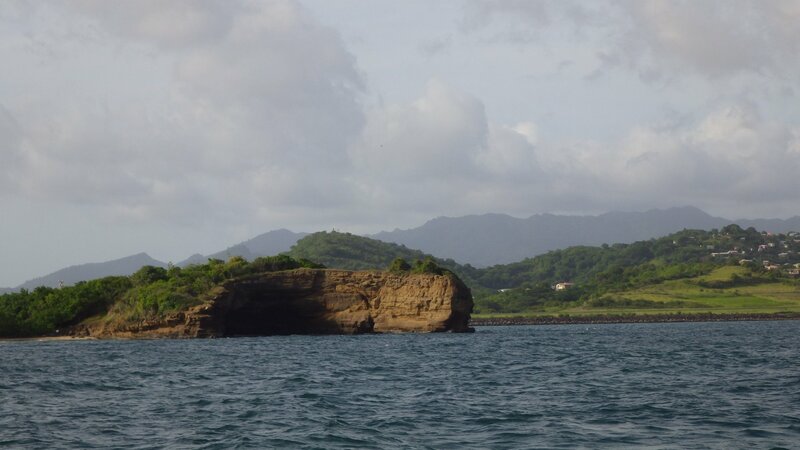 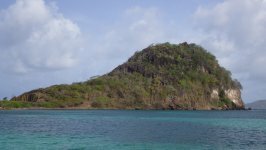 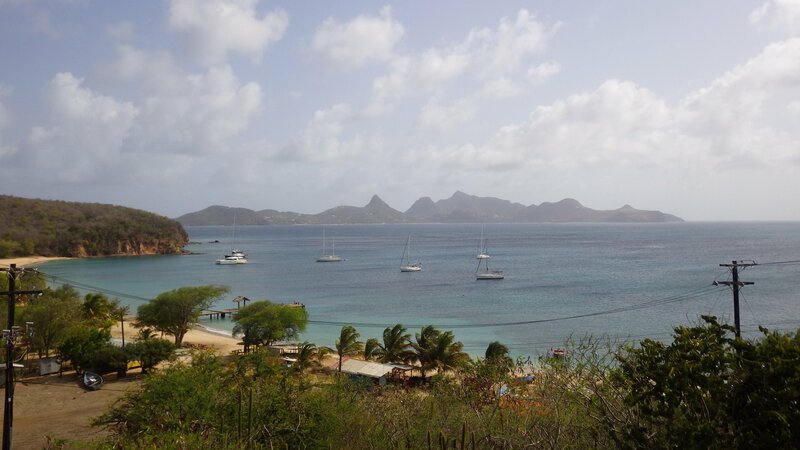 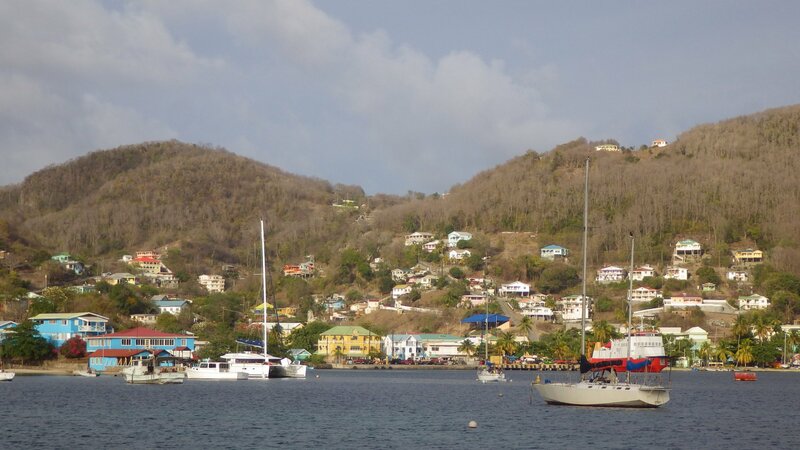 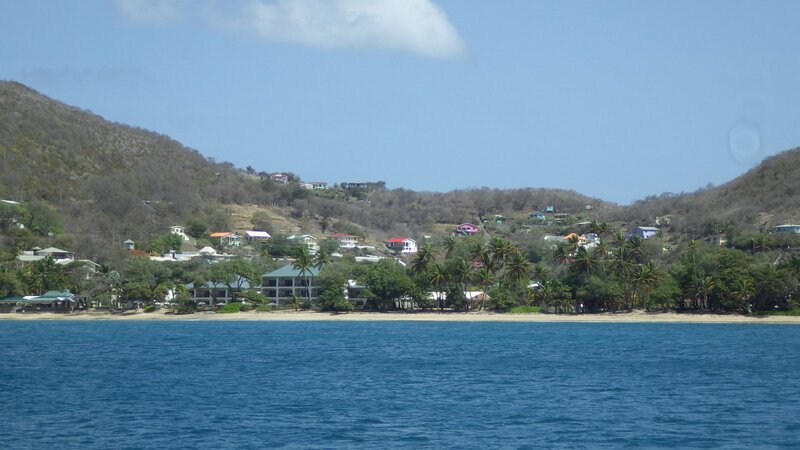 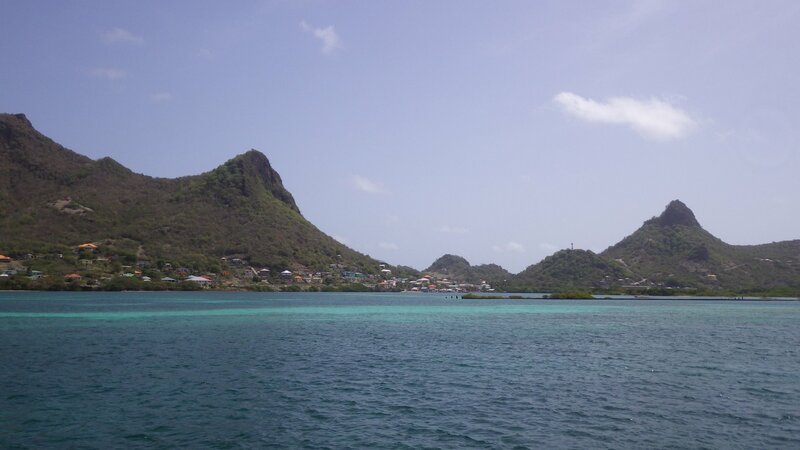 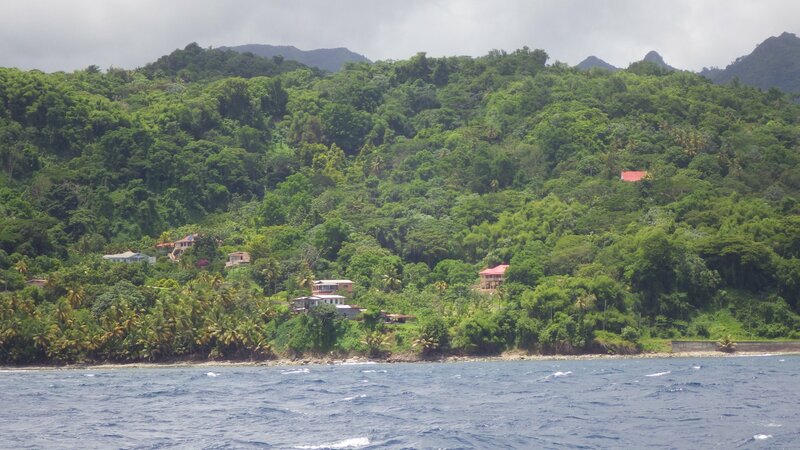 Sailing from St. Lucia to Bequia, we passed by St. Vincent island � after doing some research I have decided not to stop there. 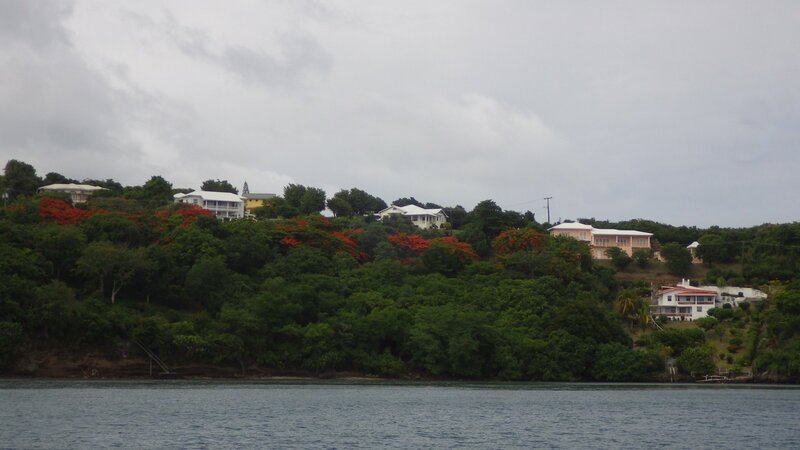 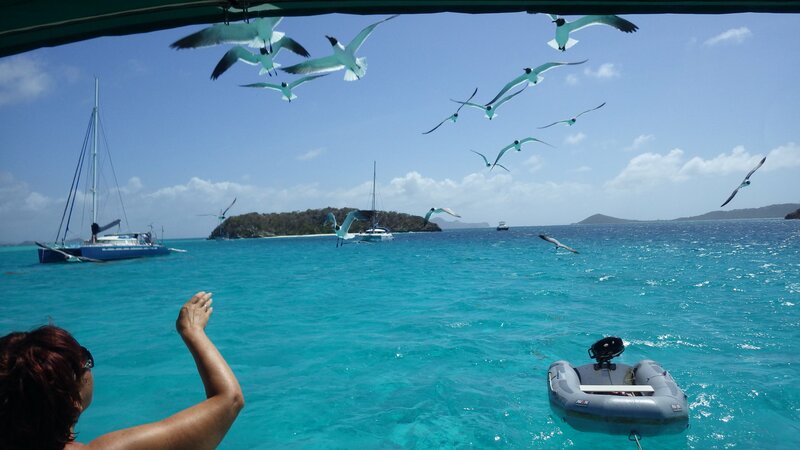 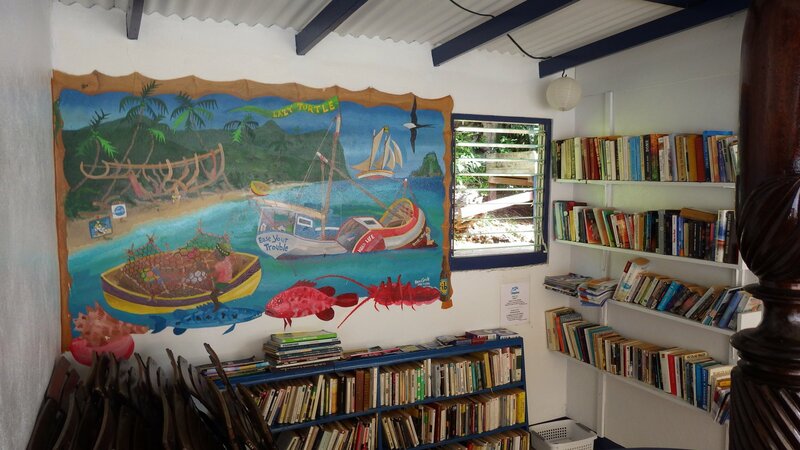 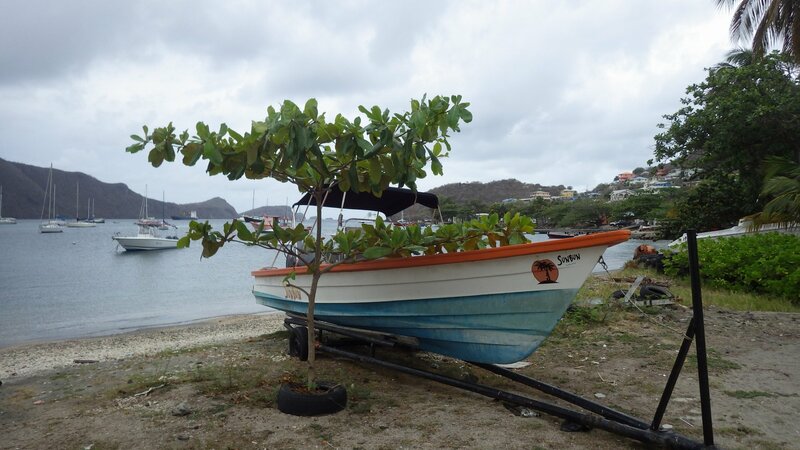 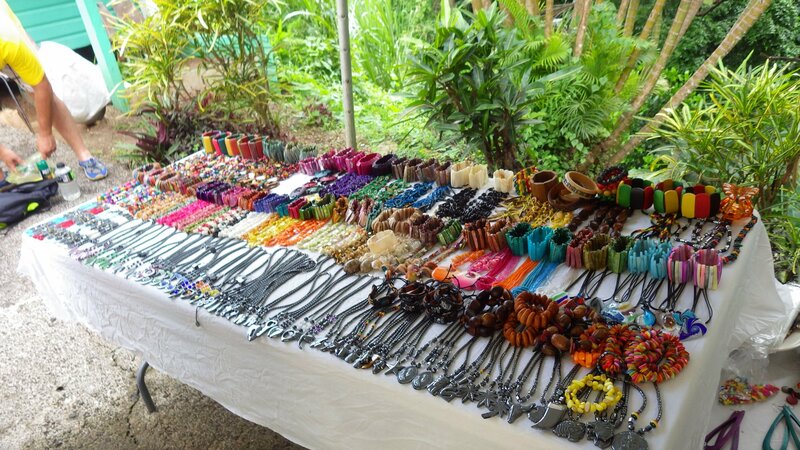 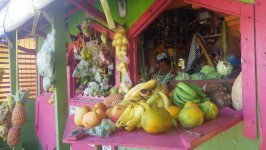 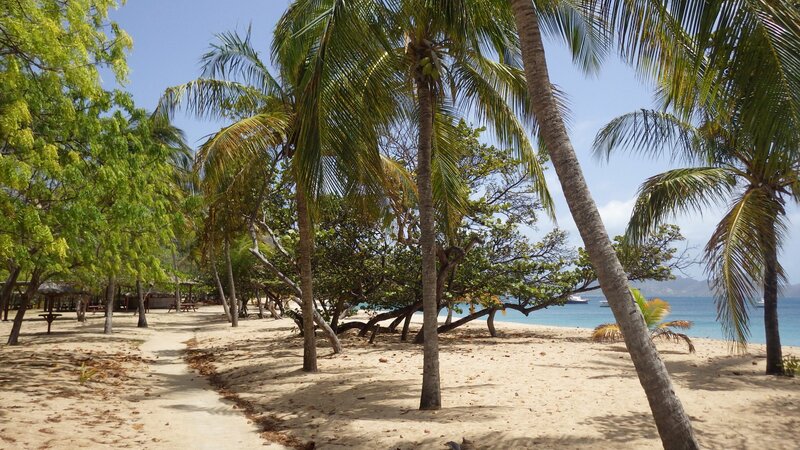 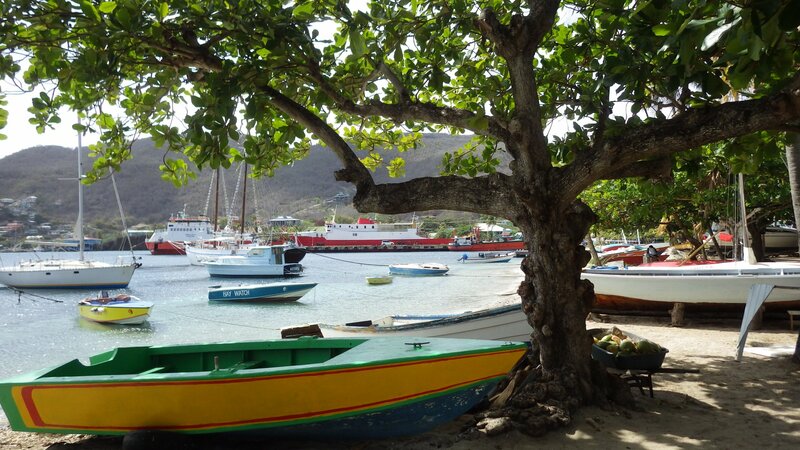 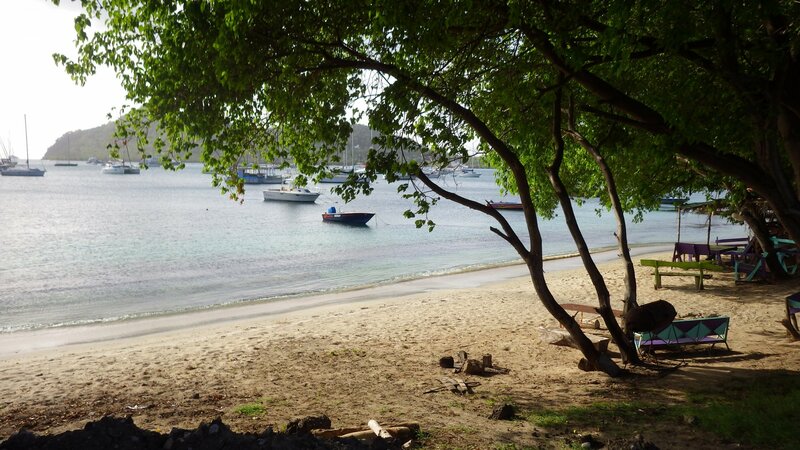 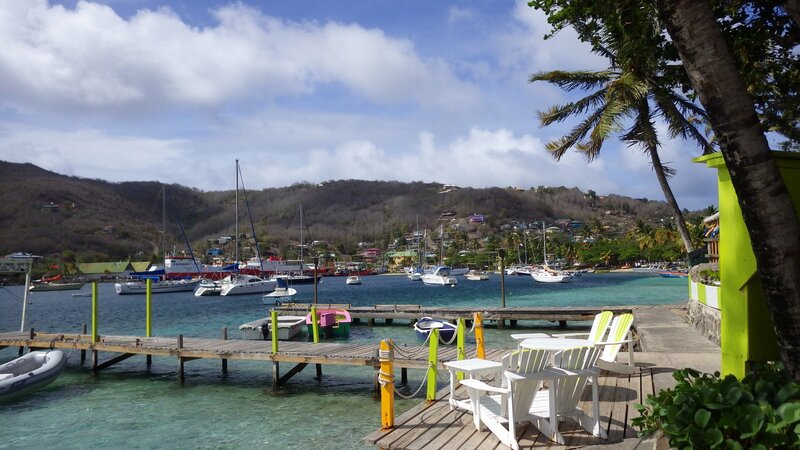 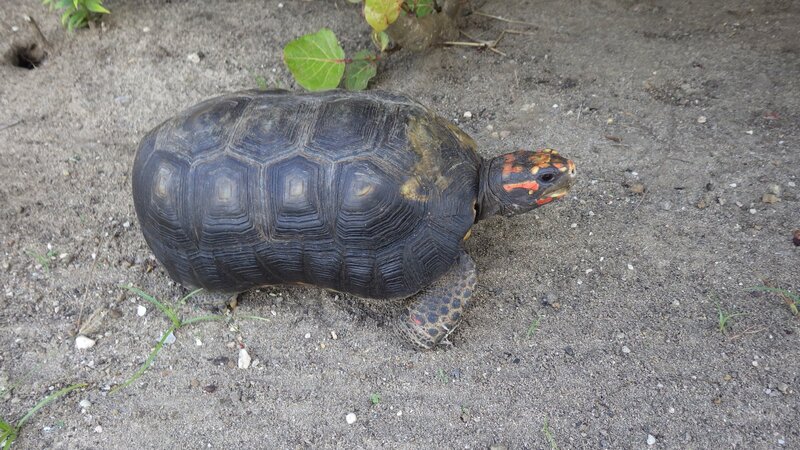 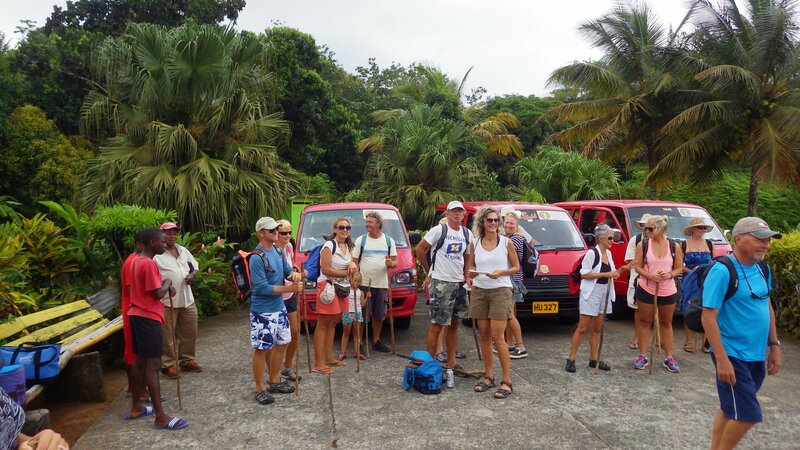 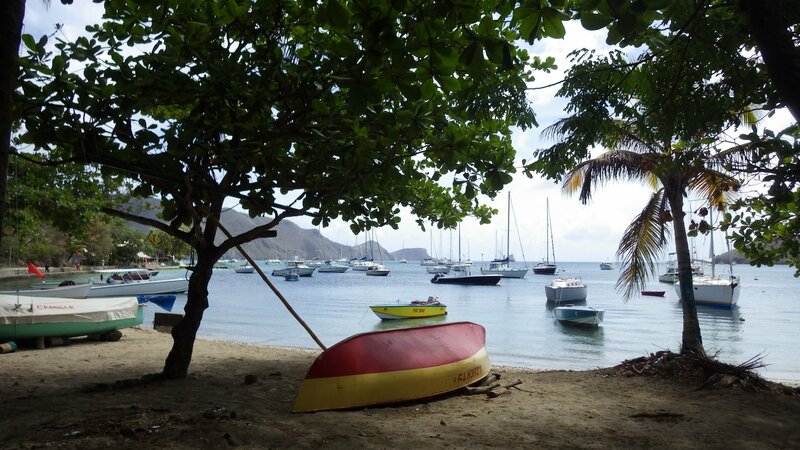 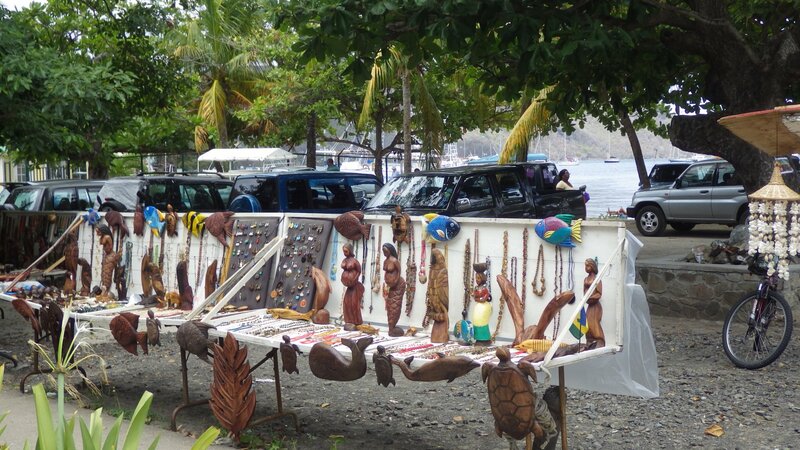 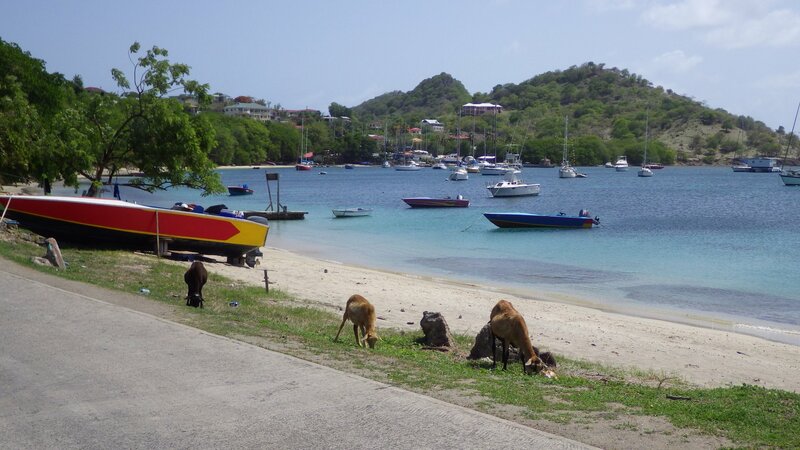 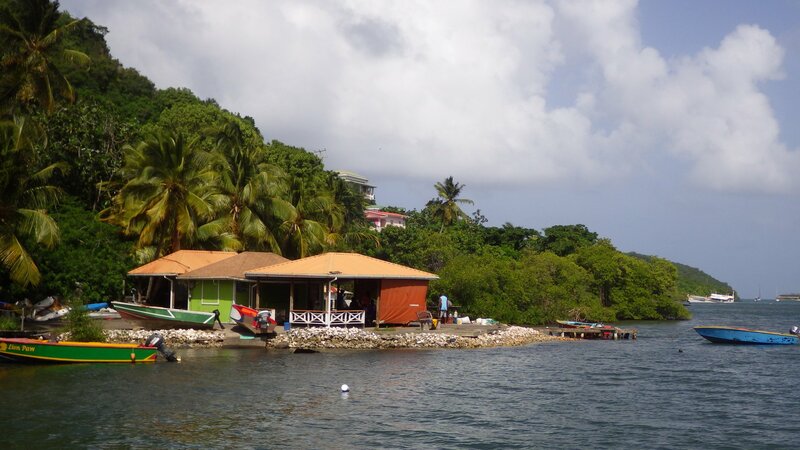 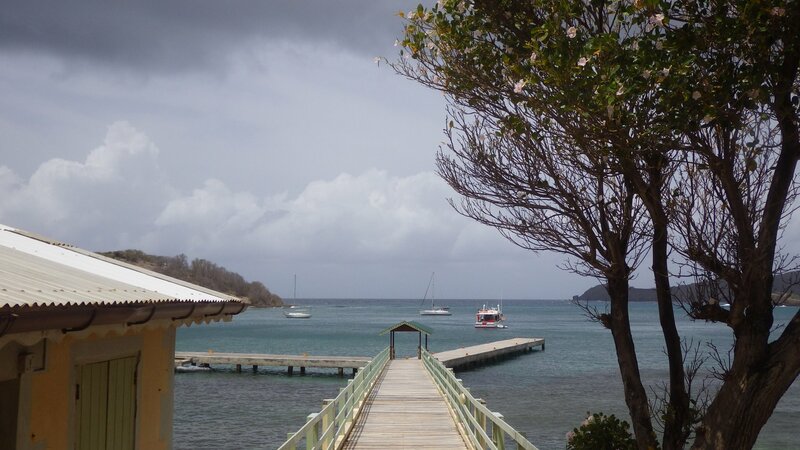 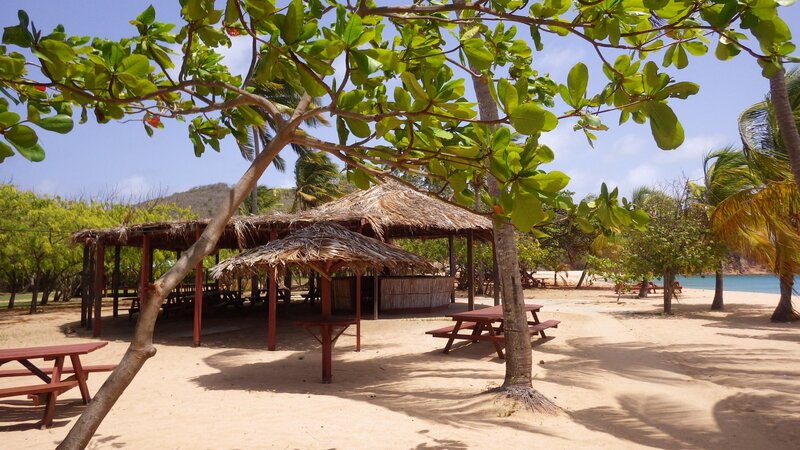 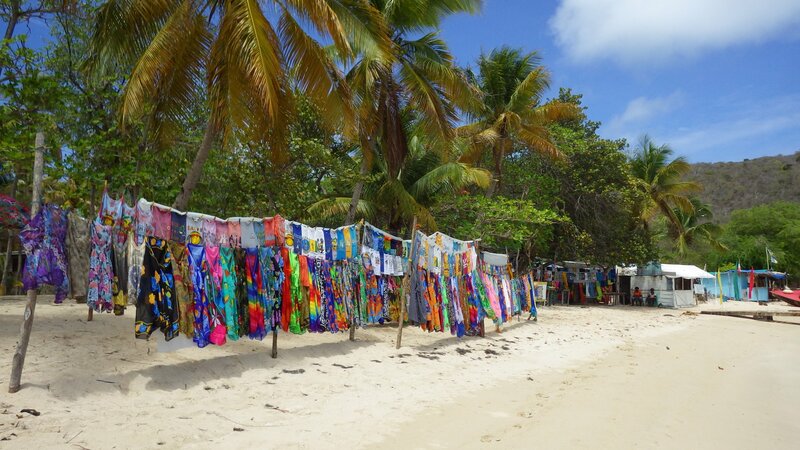 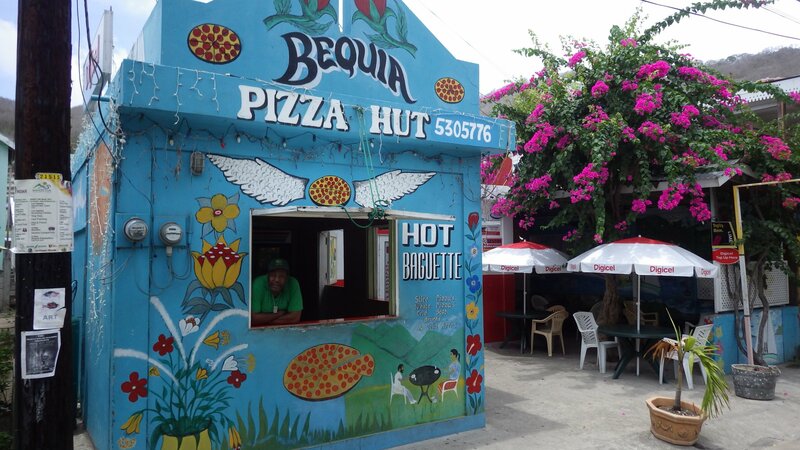 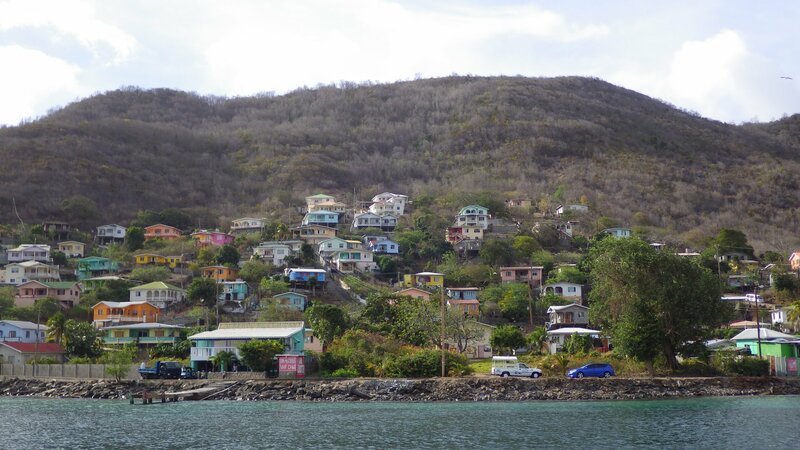 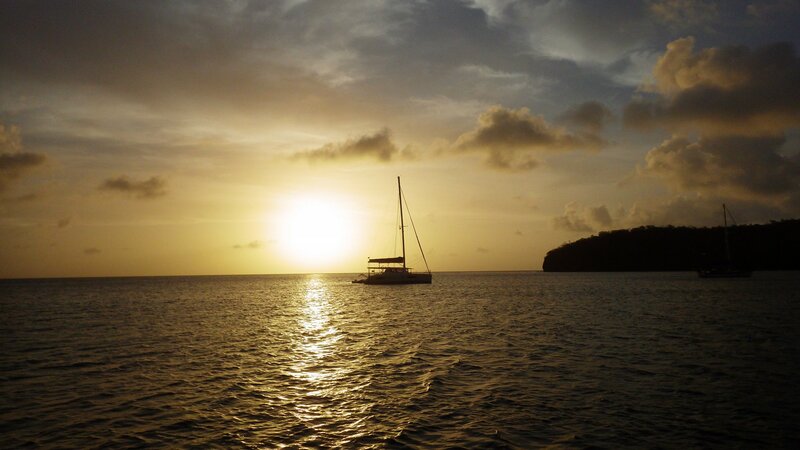 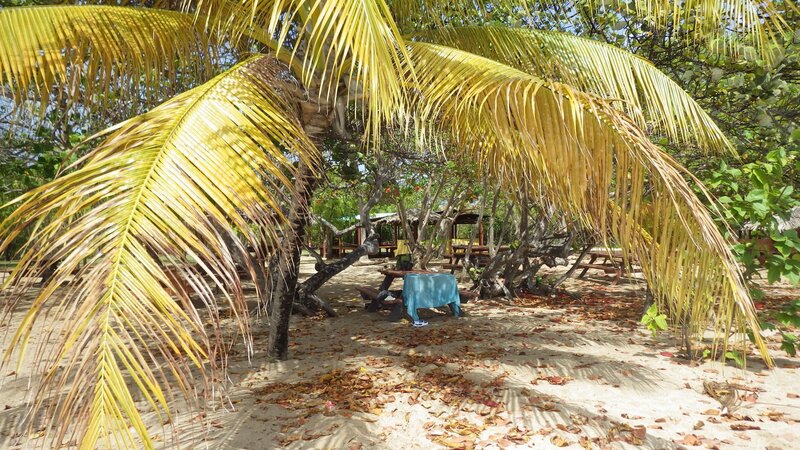 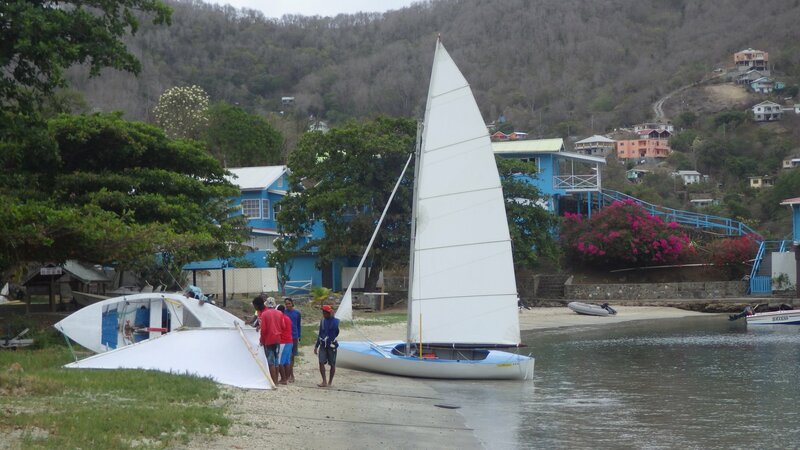 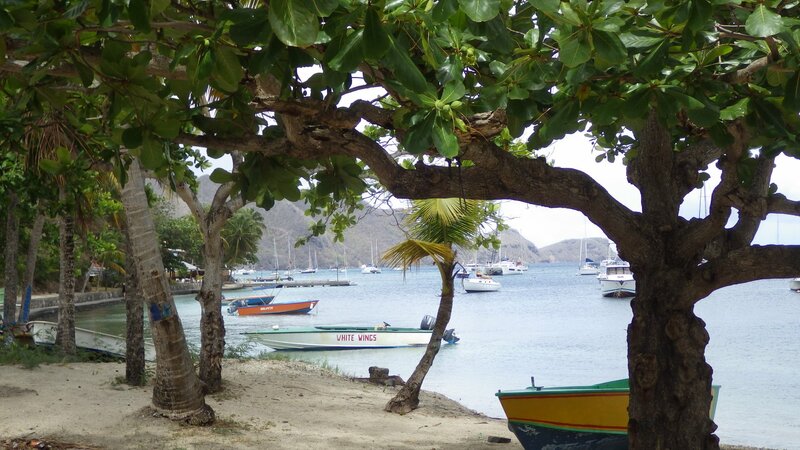 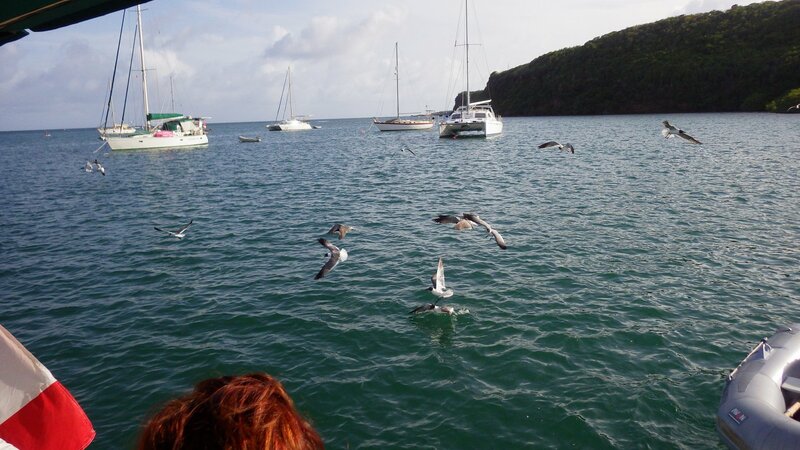 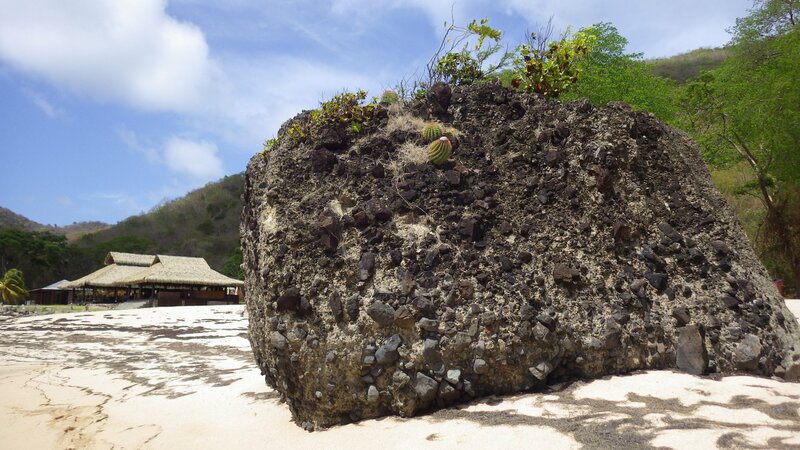 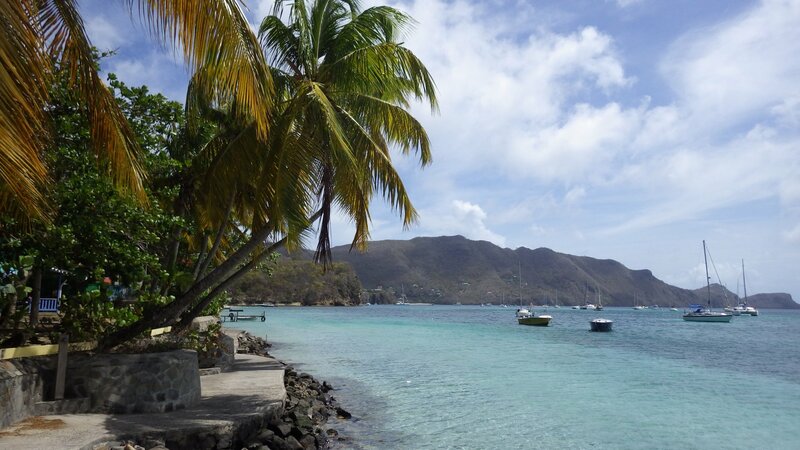 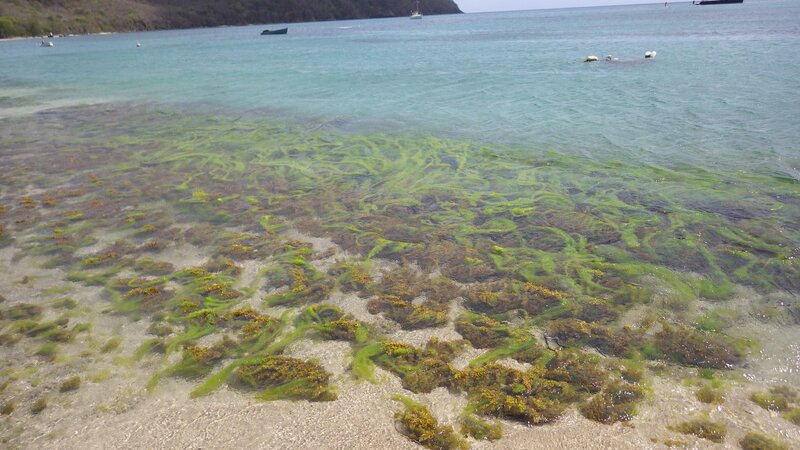 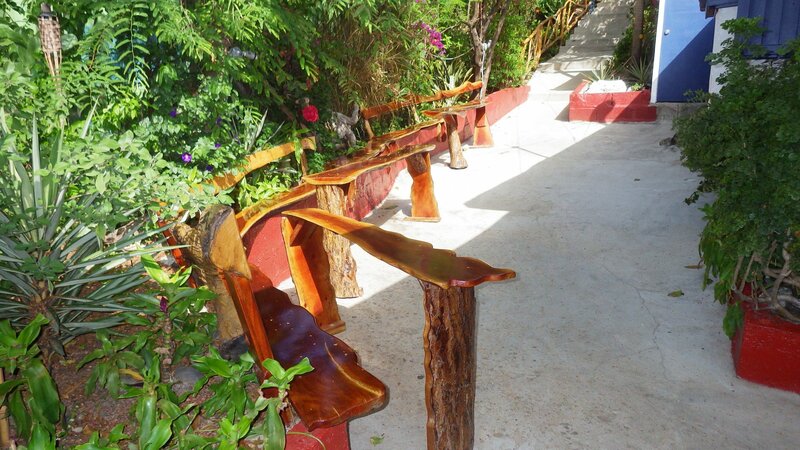 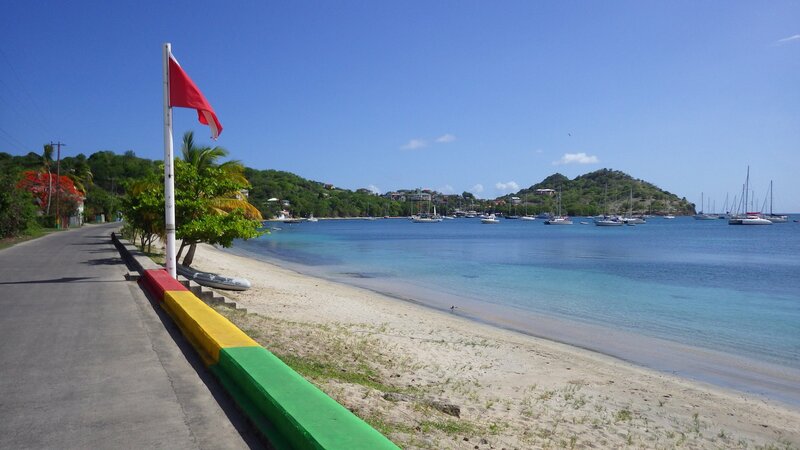 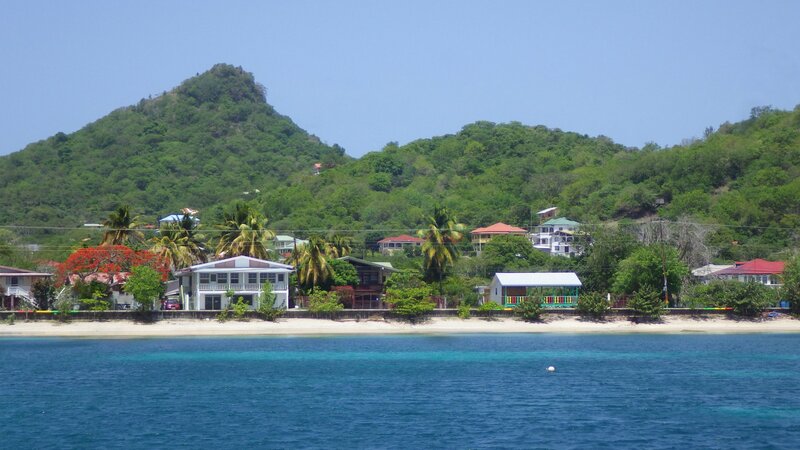 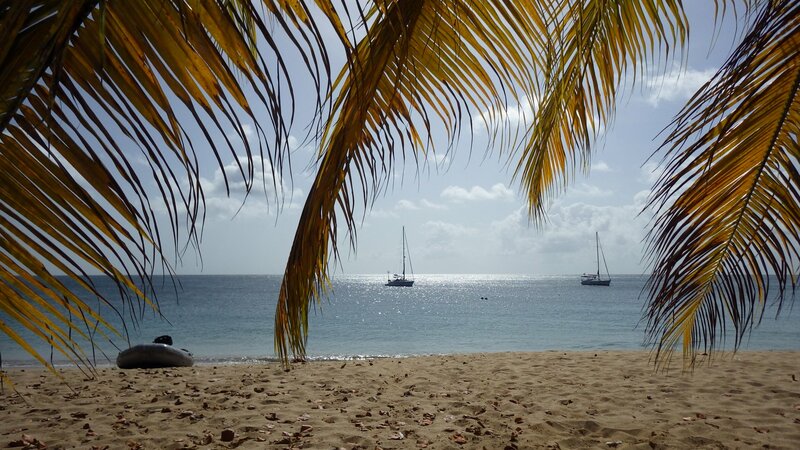 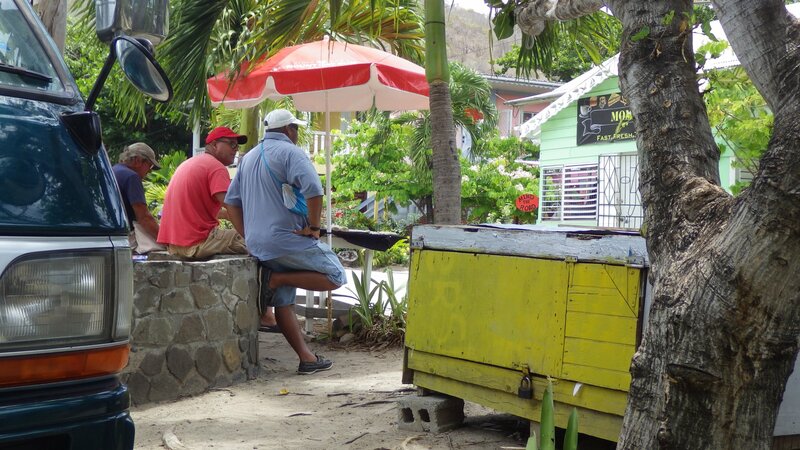 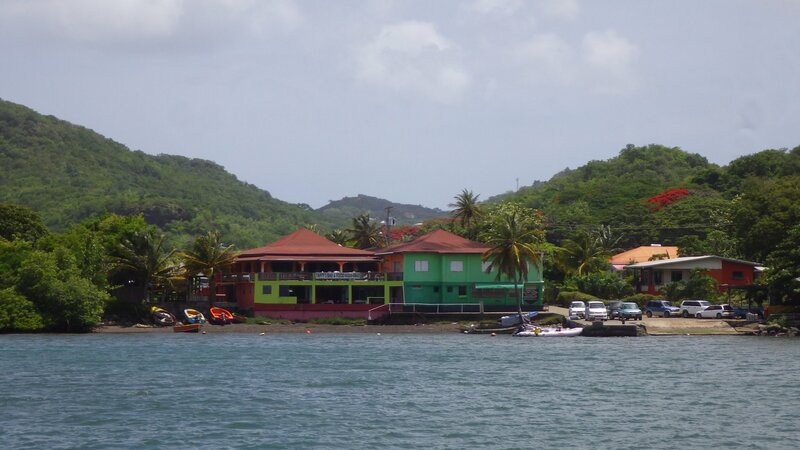 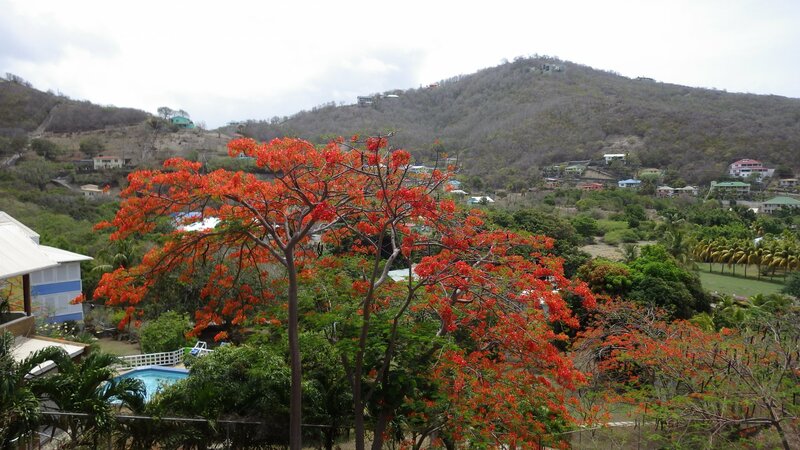 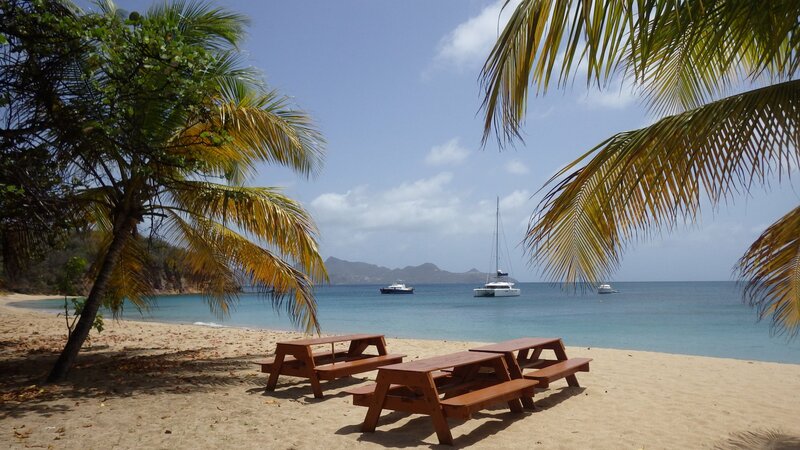 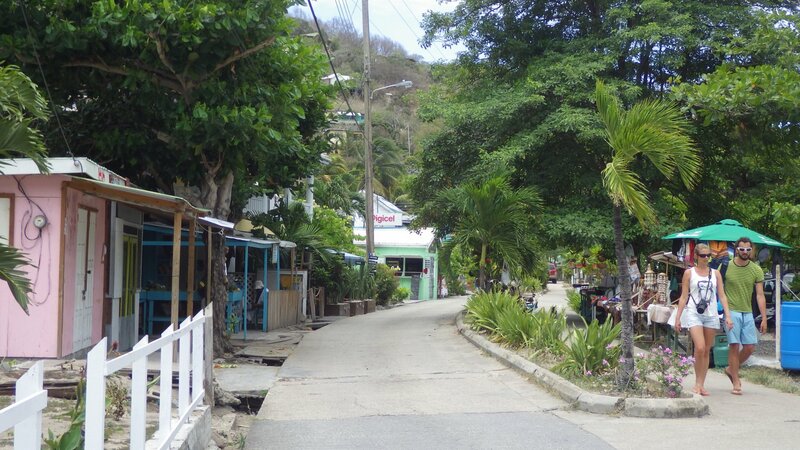 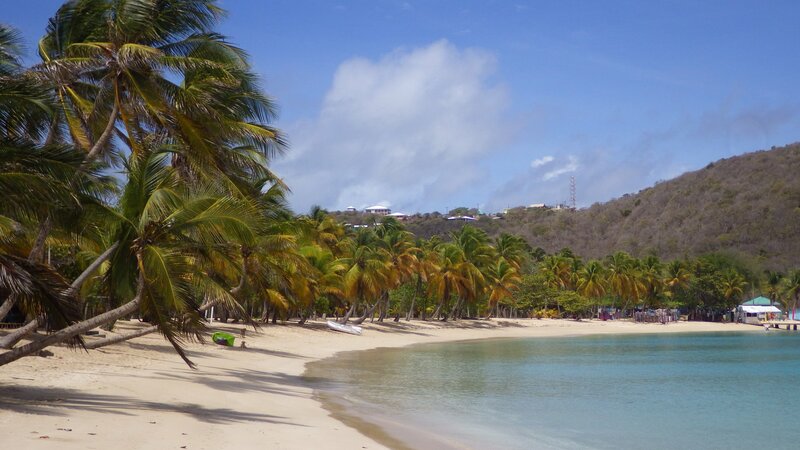 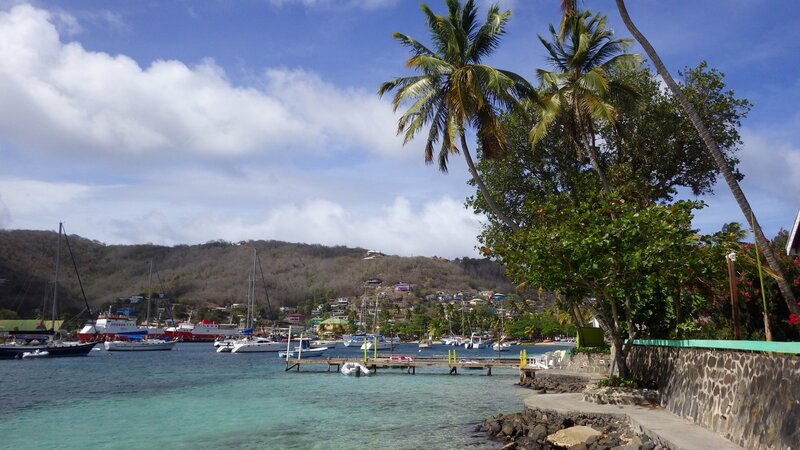 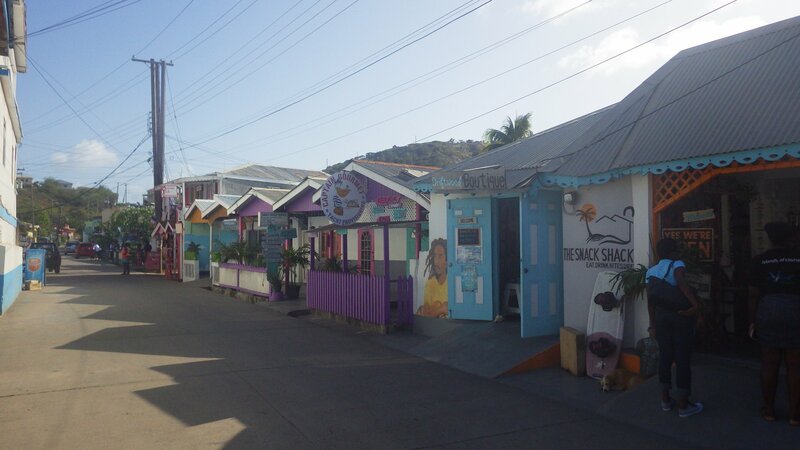 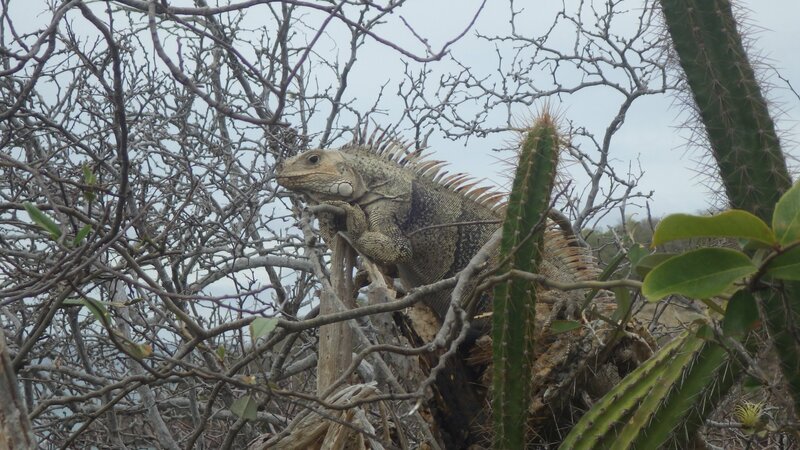 The Bequia Island is liked by many. 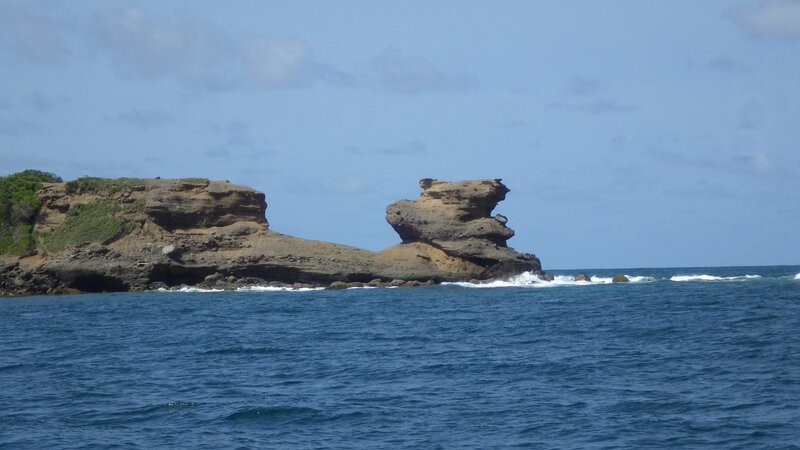 The Admiralty Bay is fairly protected, and the Port Elizabeth town is small but active. 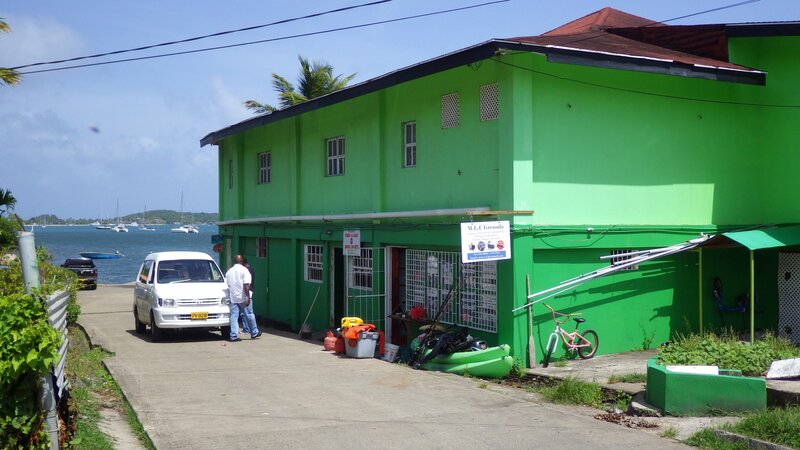 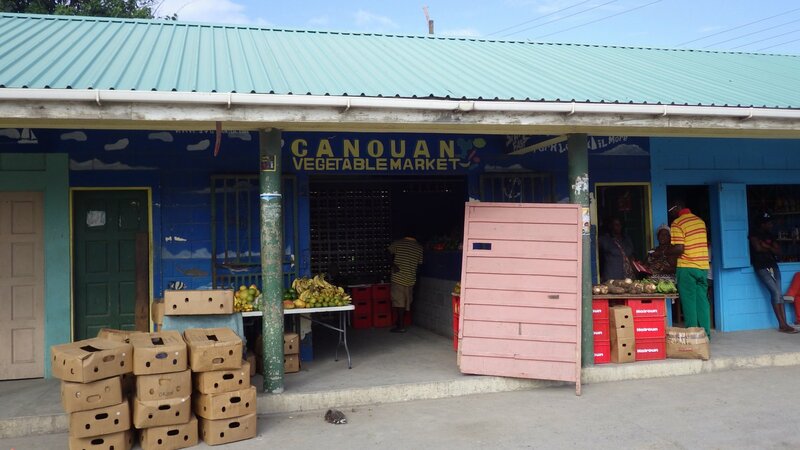 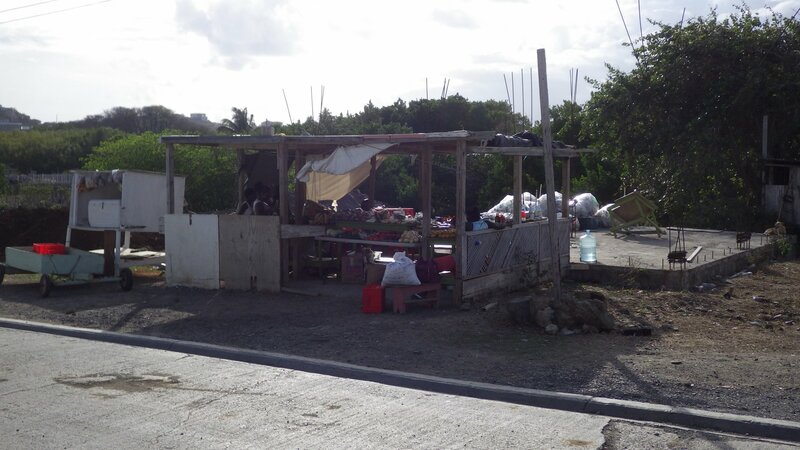 There are several stores, fresh produce market, marine services, etc. 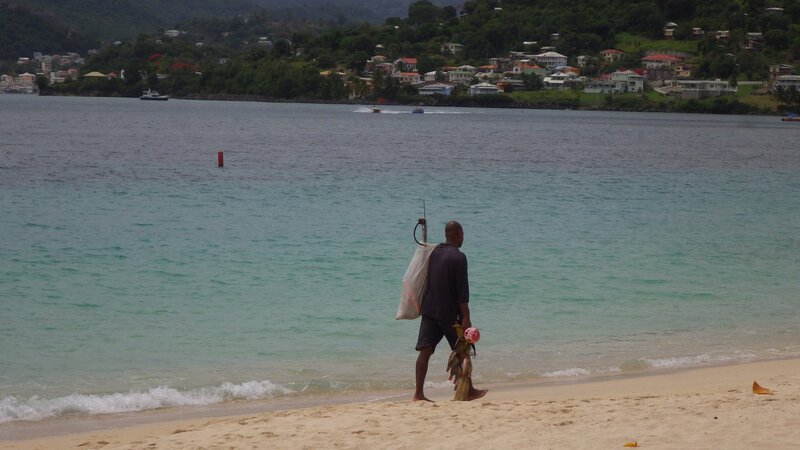 When fishermen come ashore with their catch, they blow a conch horn. 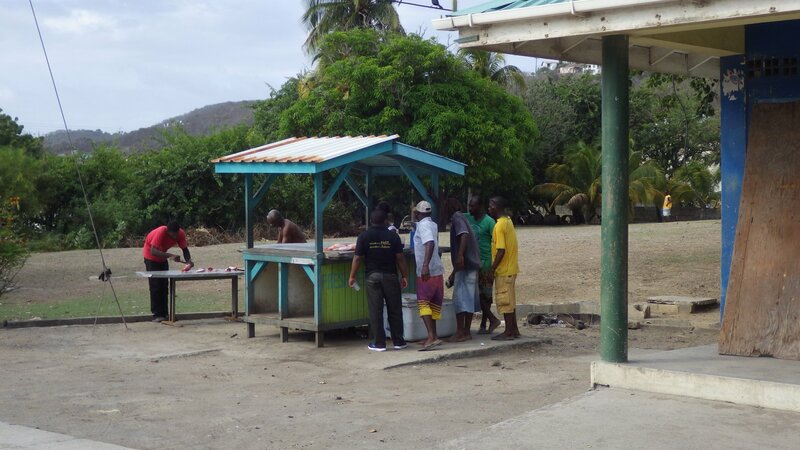 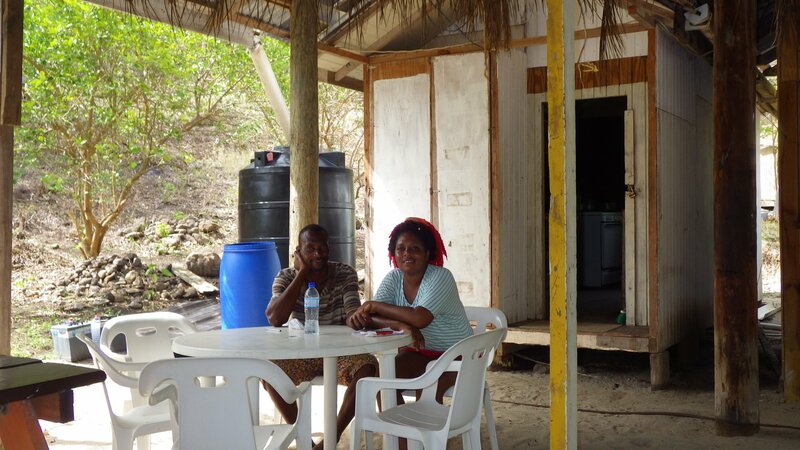 We bought fresh red snapper from them couple times. 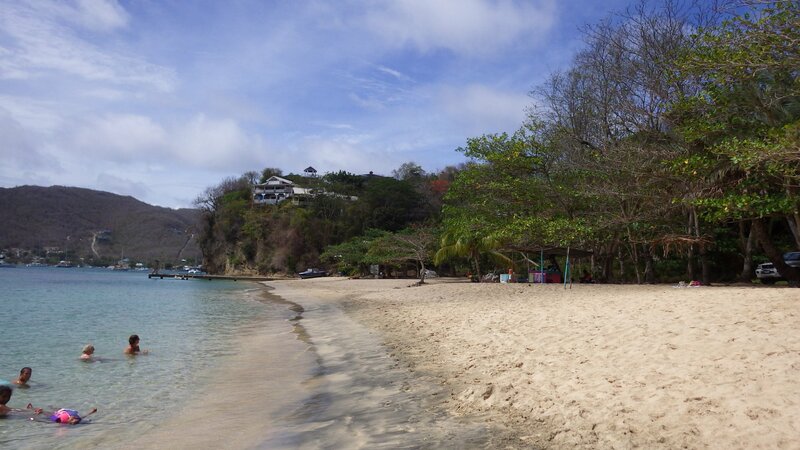 The Princess Margaret beach on the south shore of the bay is very nice, with soft bright sand. 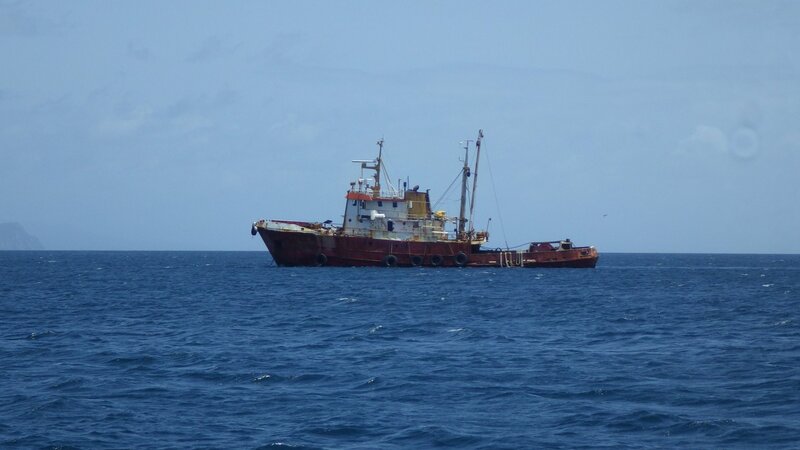 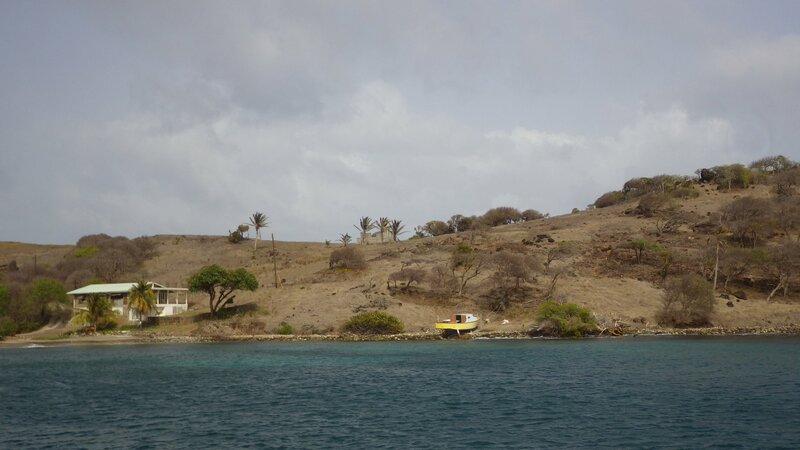 We stayed for several days in Admiralty Bay, and after filling up our water tanks from the floating water supply boat, we sailed to our next destination. 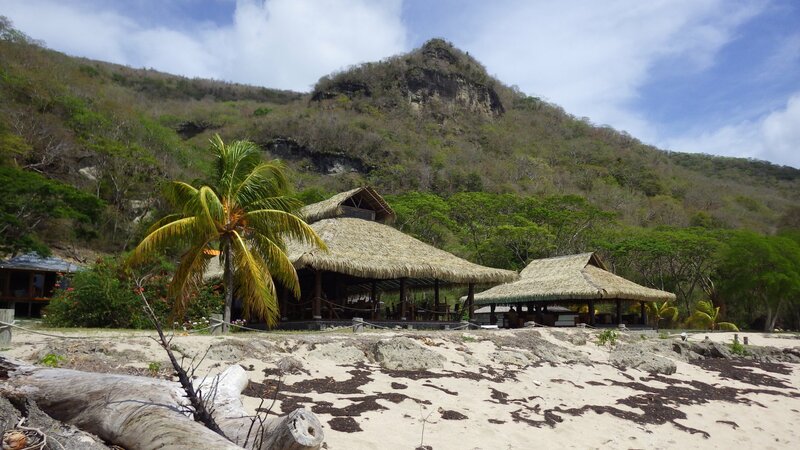 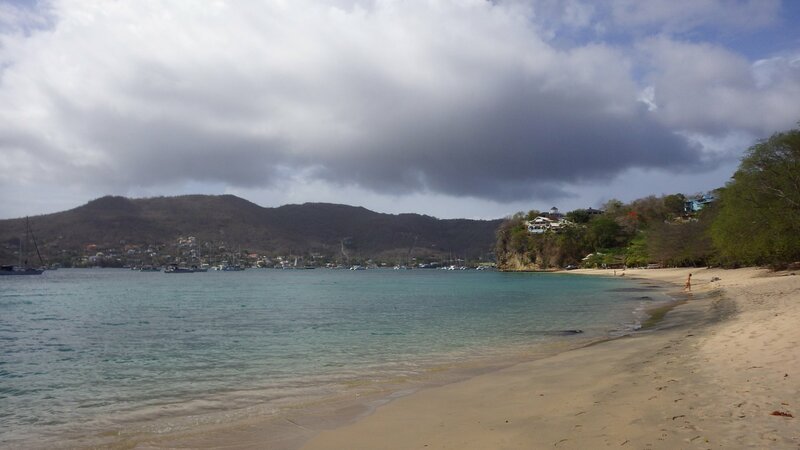 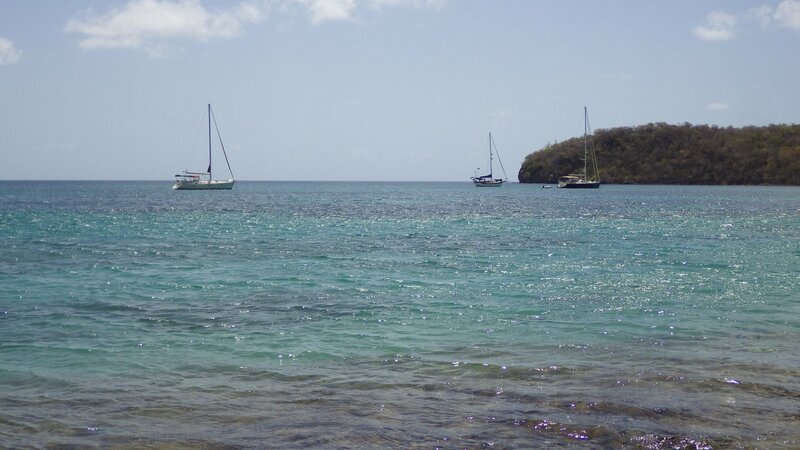 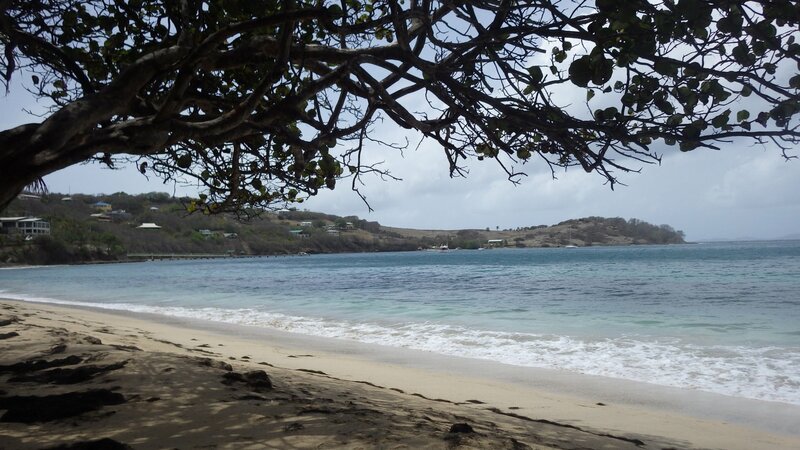 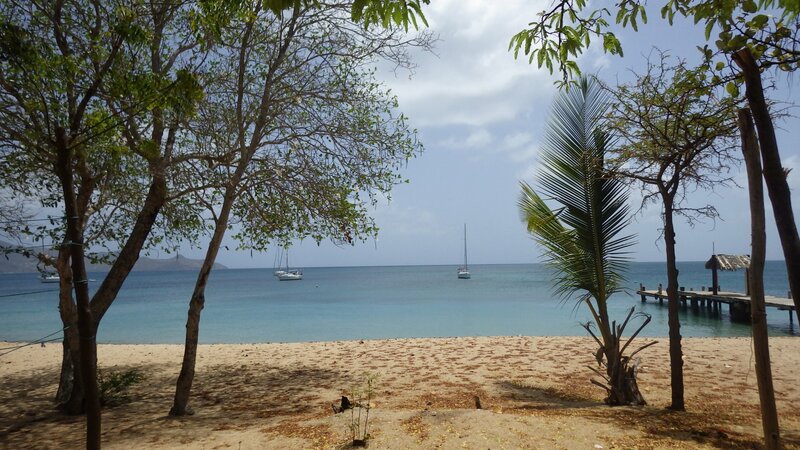 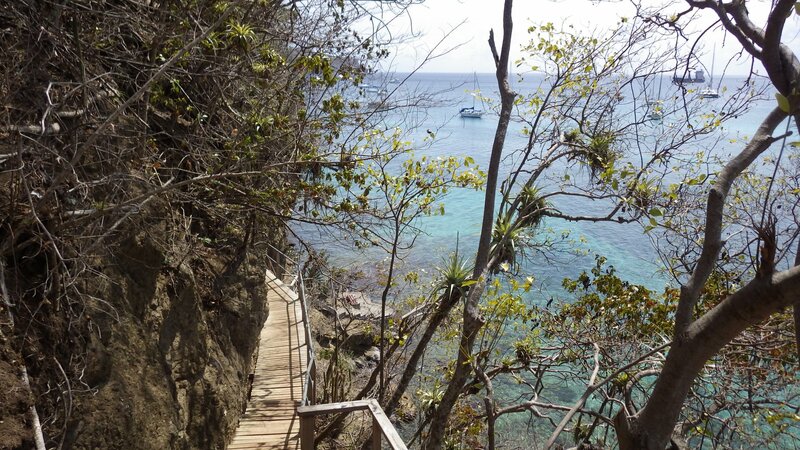 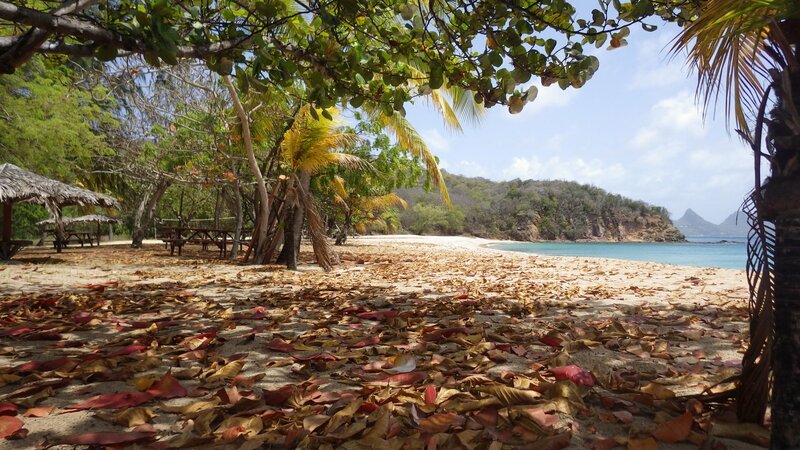 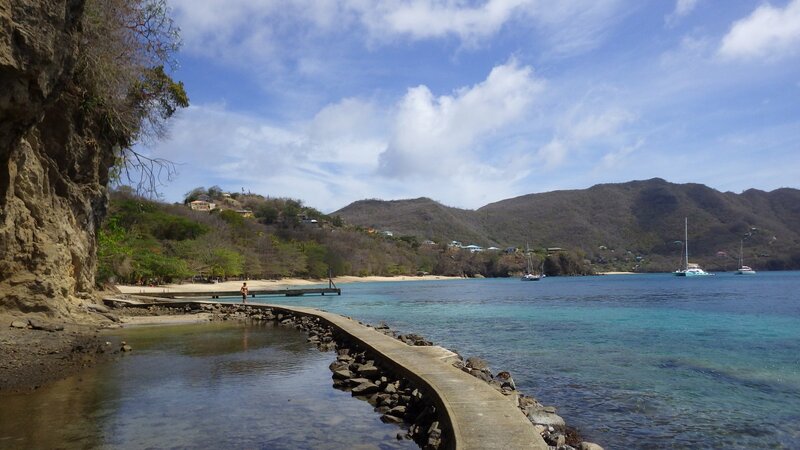 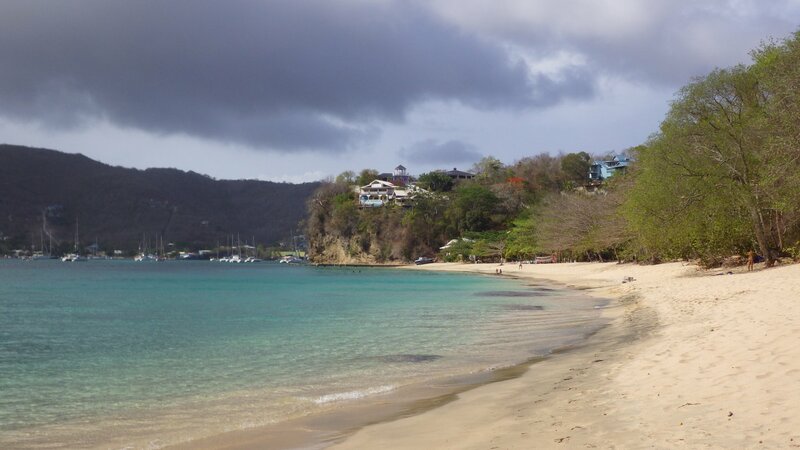 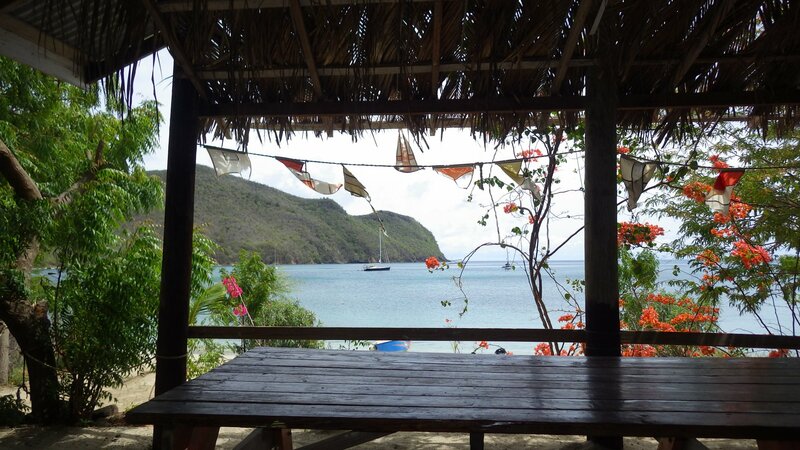 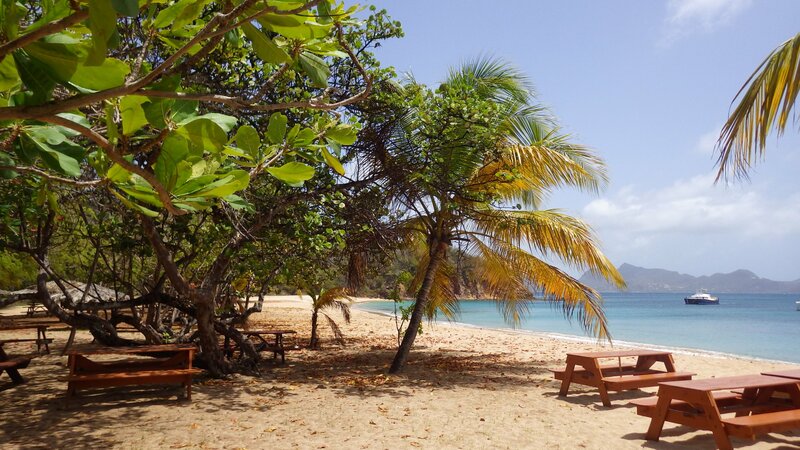 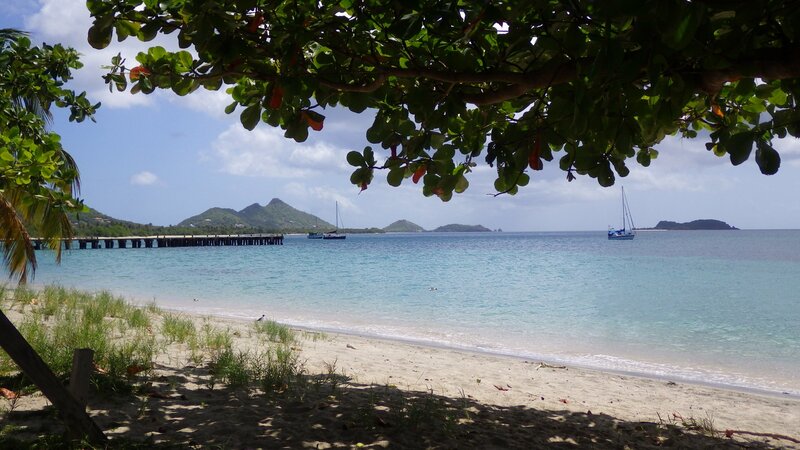 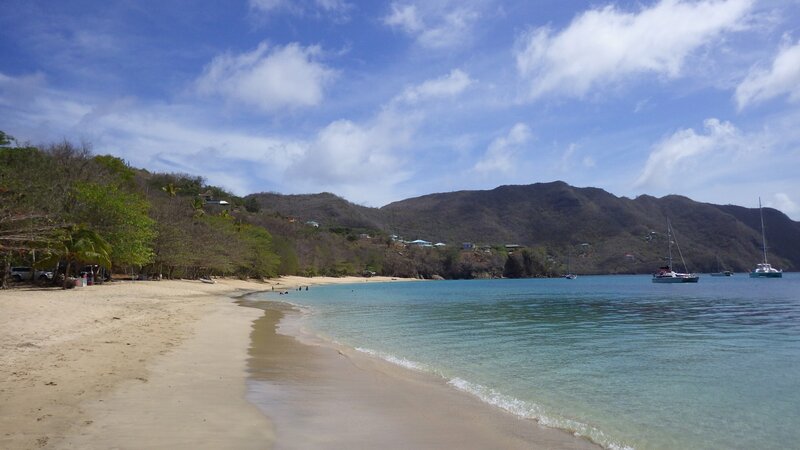 We had a couple days stop at Friendship Bay on the southeast side of Bequia Island. 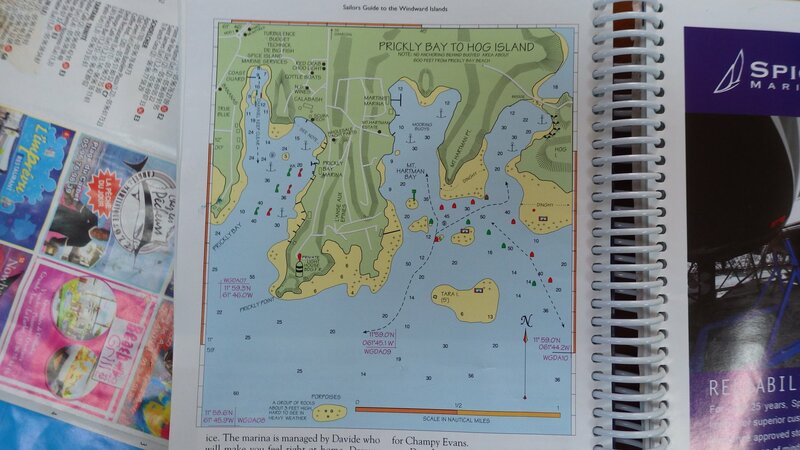 As it turns out, the swell comes from southeast and wraps around the cape, making it a rolly anchorage. 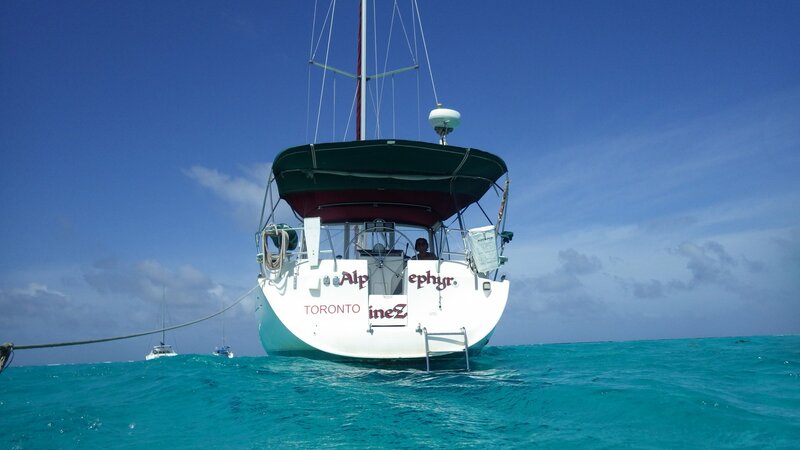 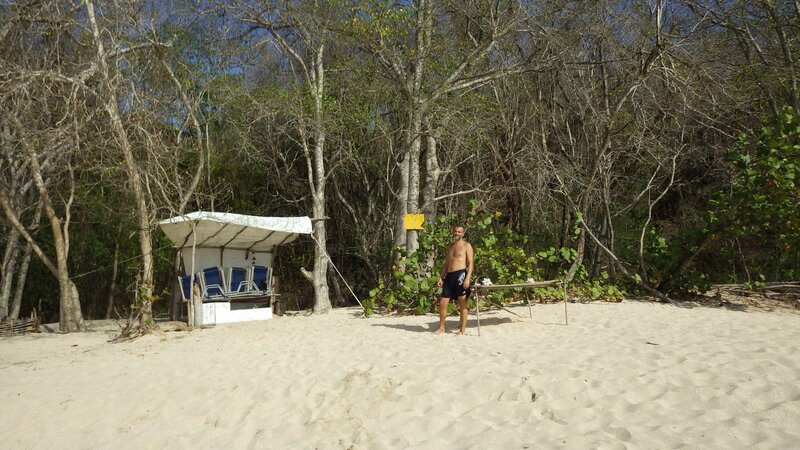 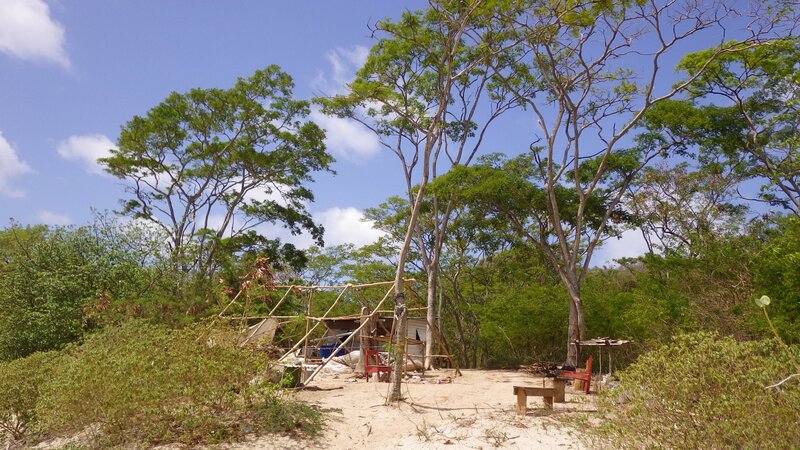 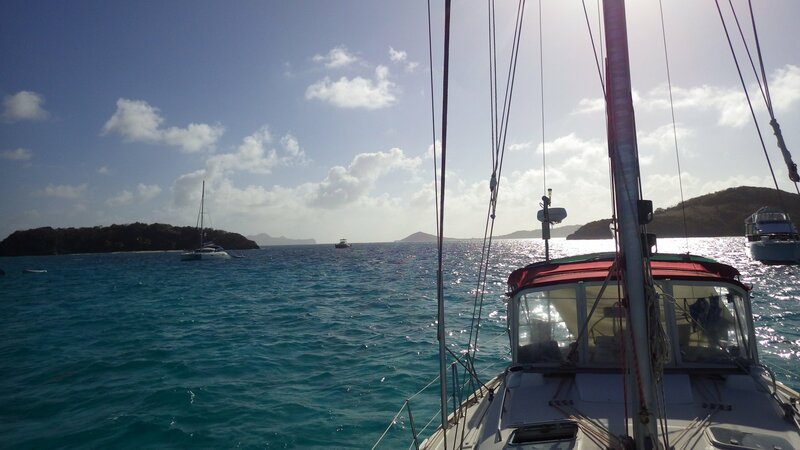 So I put an anchor bridle to point bow to the waves � it made our stay much more comfortable. 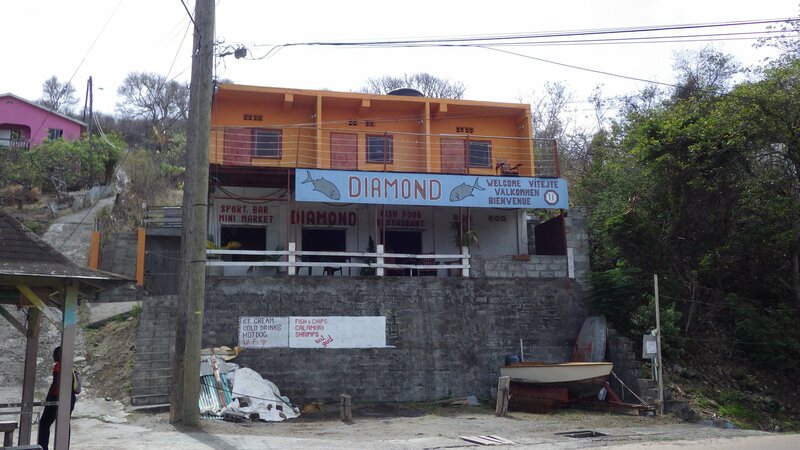 On the shore, we hiked up the hill to visit a small and quiet local restaurant Diamond Seafood. 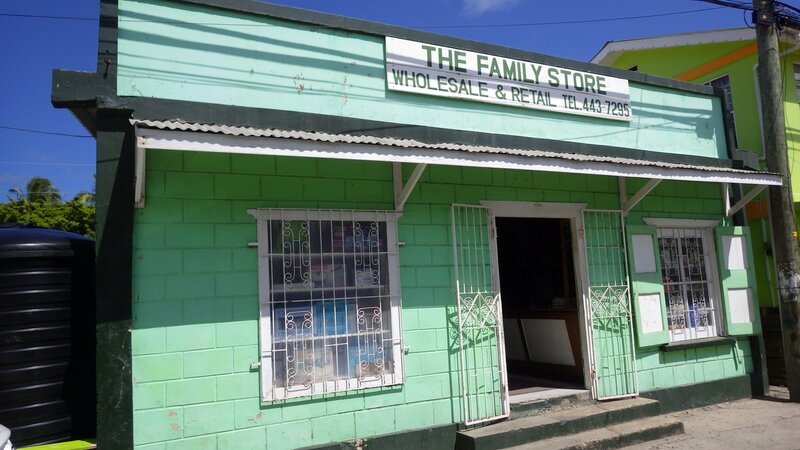 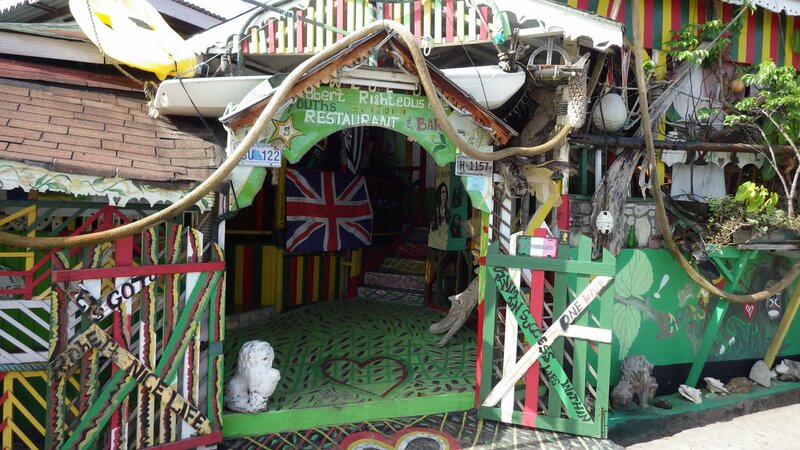 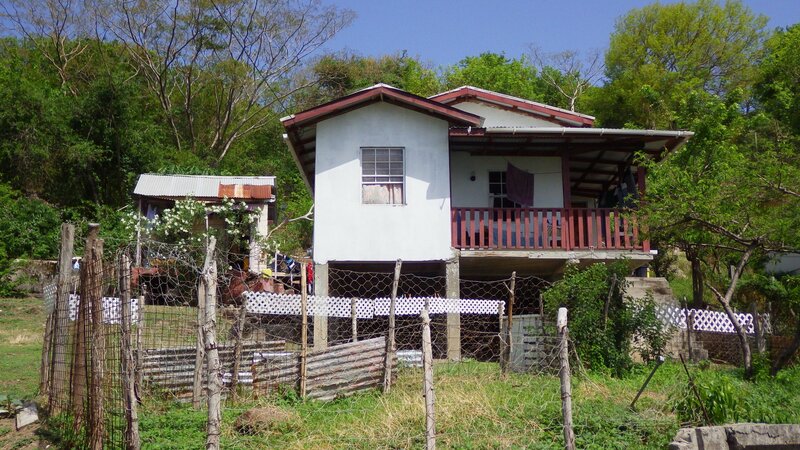 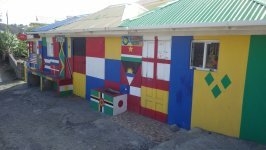 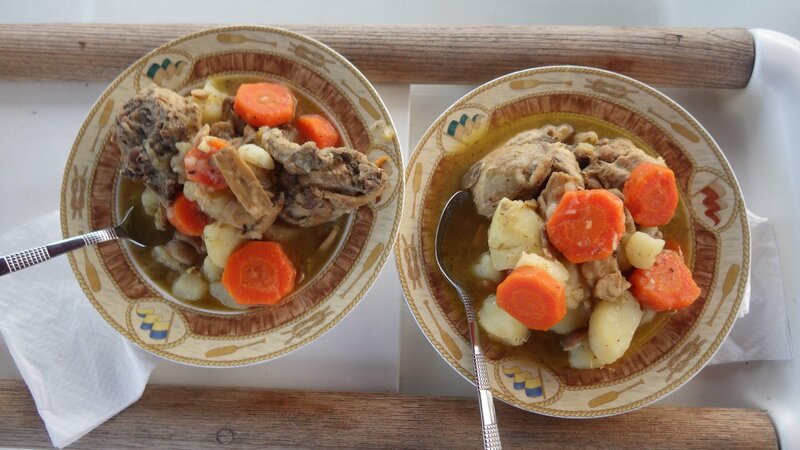 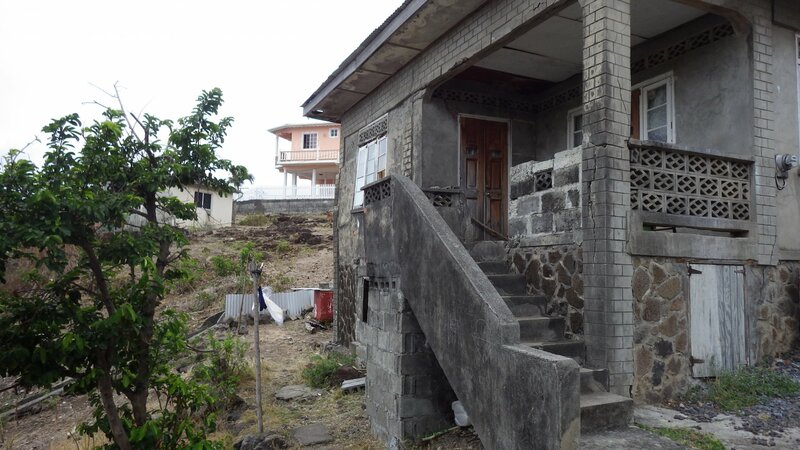 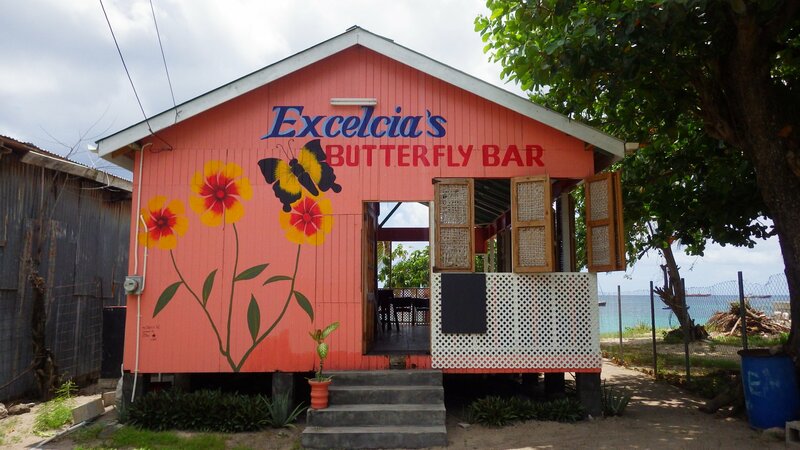 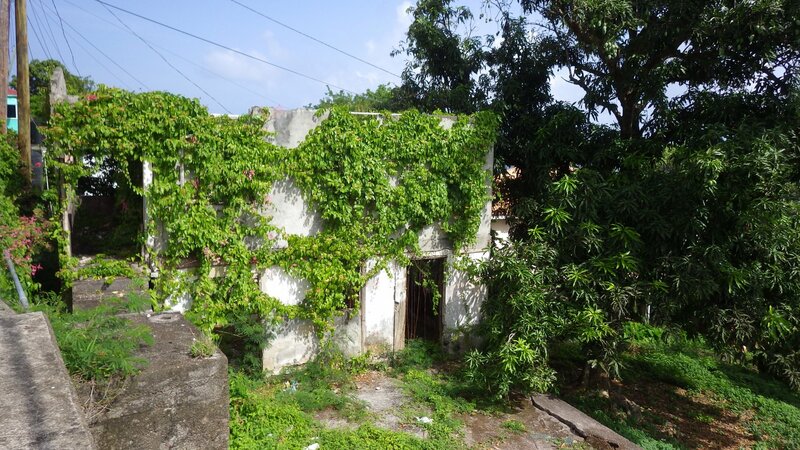 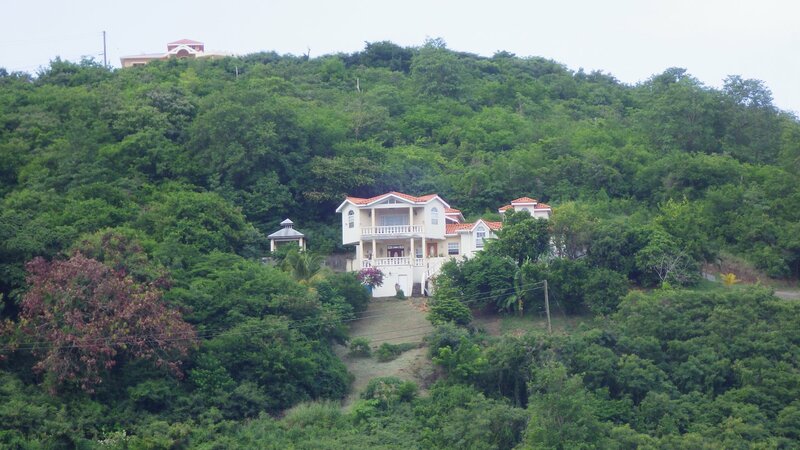 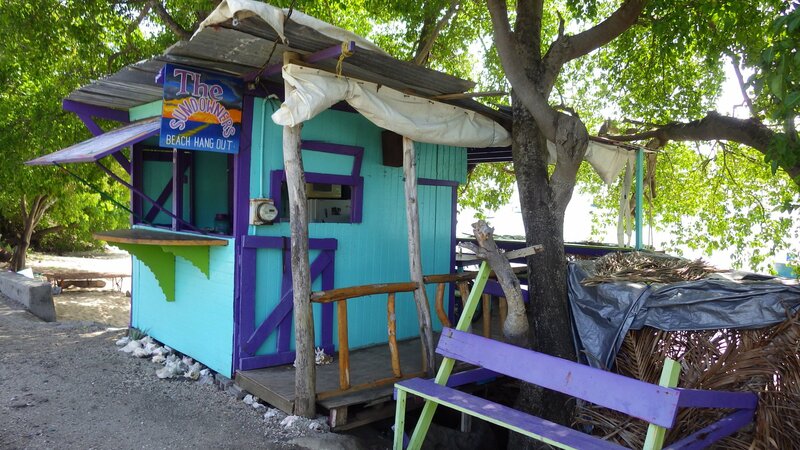 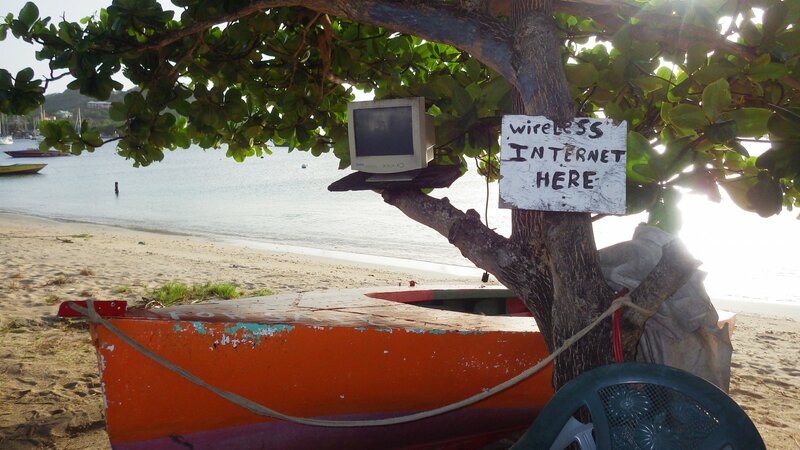 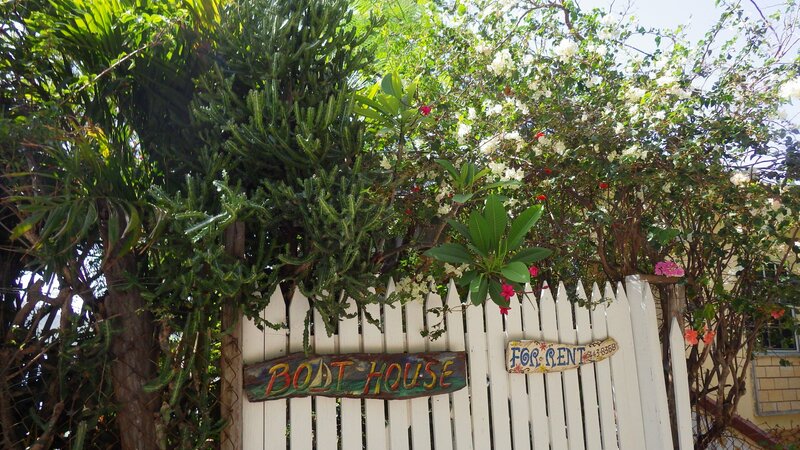 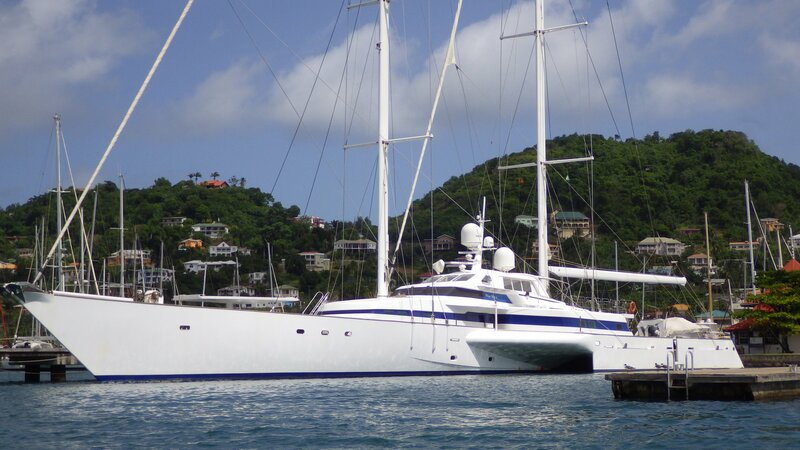 It is owned by a Bequia transplant from Check Republic. 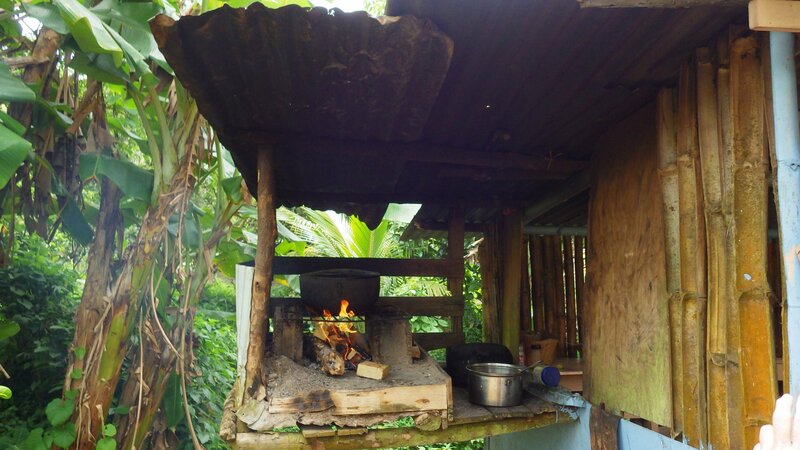 While he was cooking a meal for us, he told us an interesting story about his life adventures. 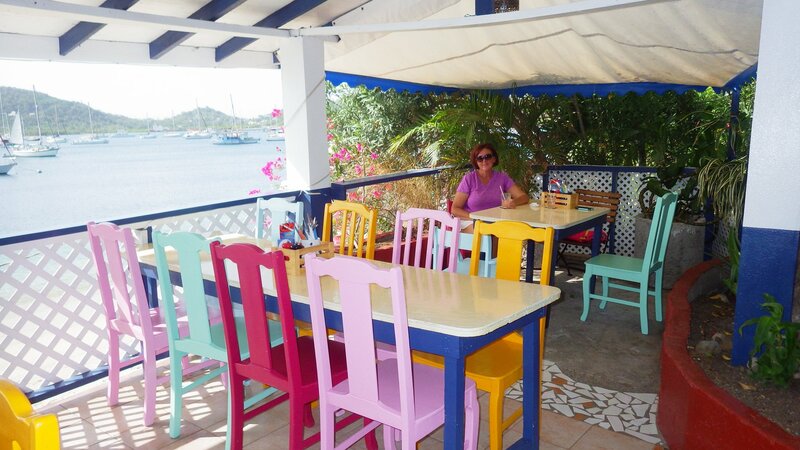 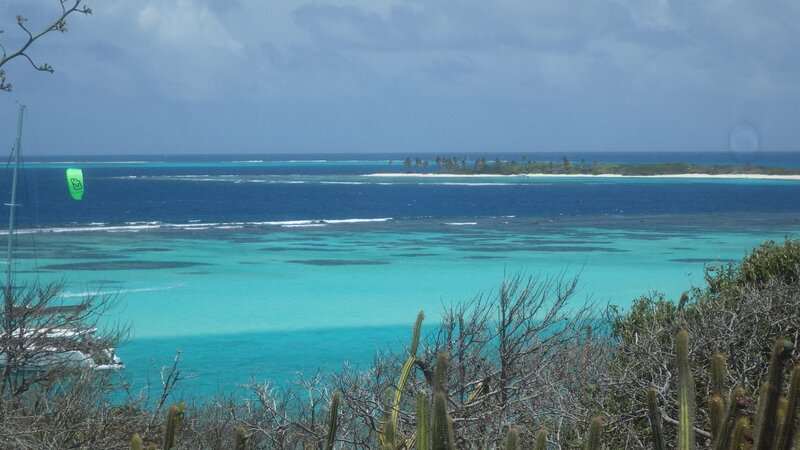 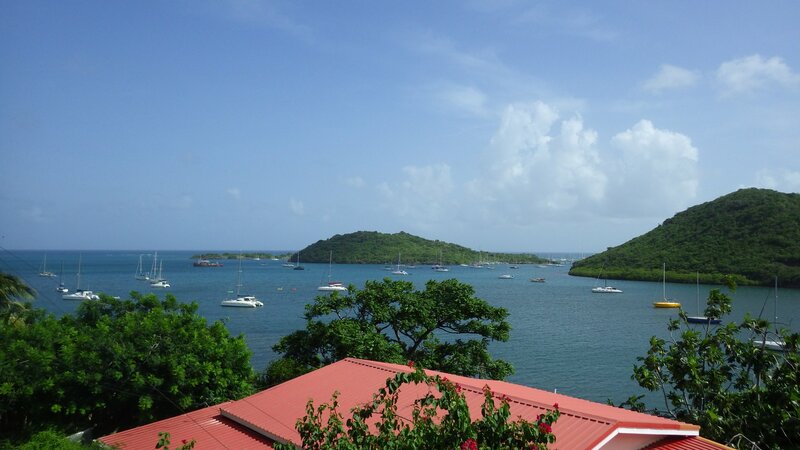 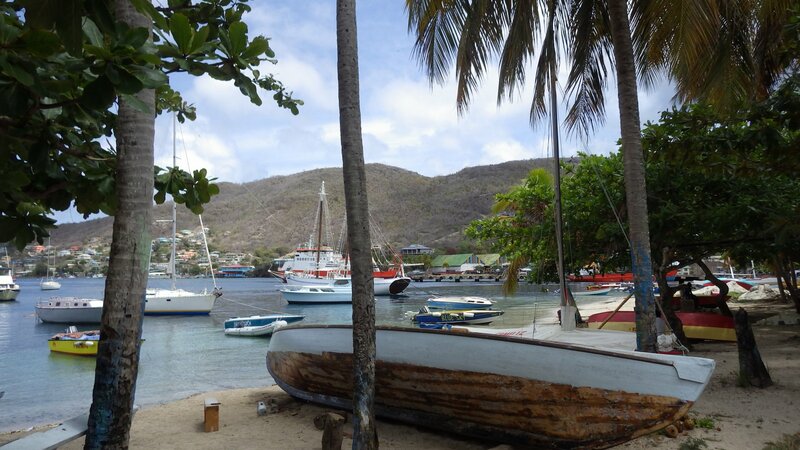 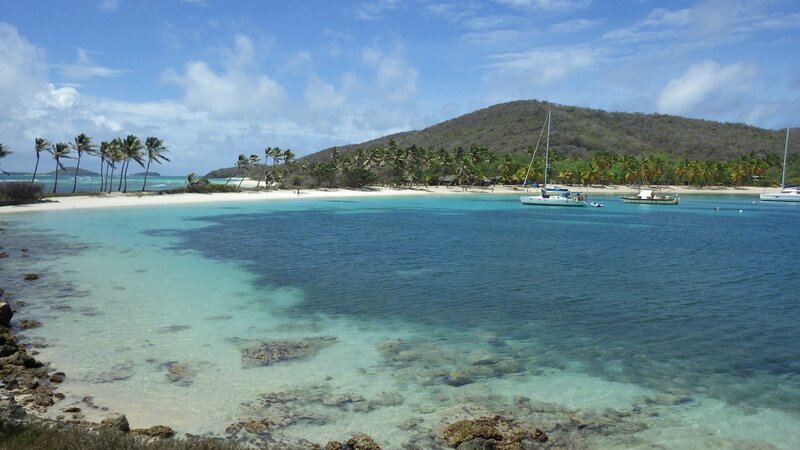 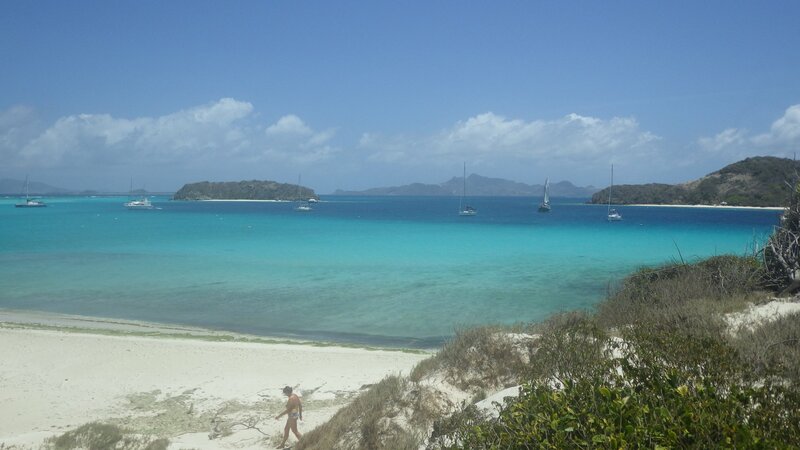 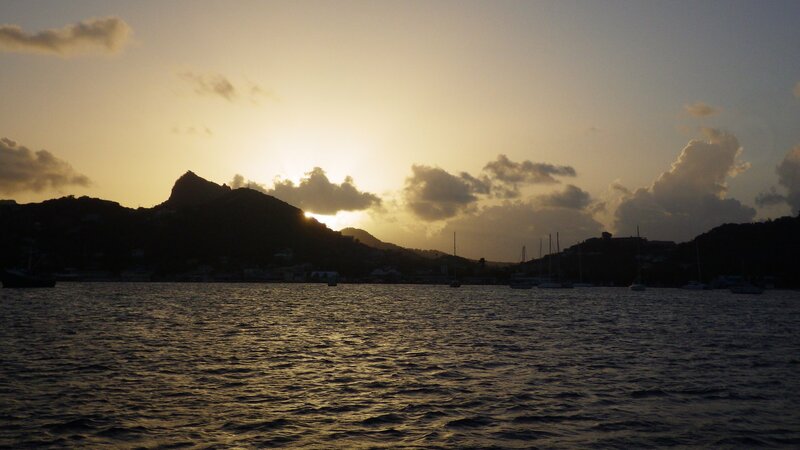 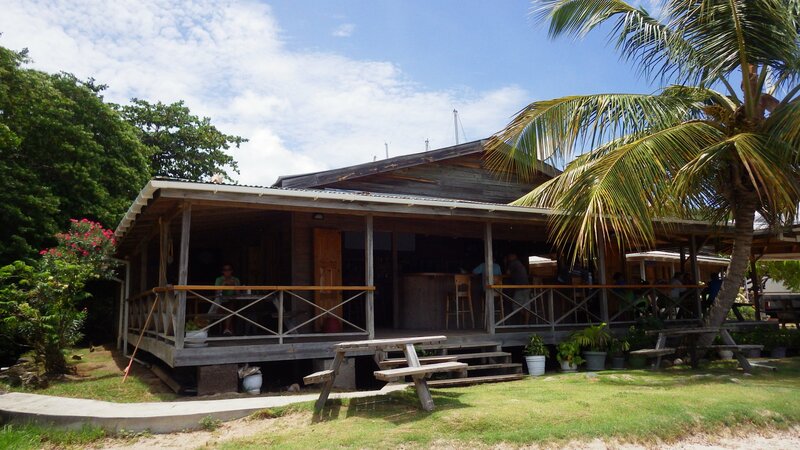 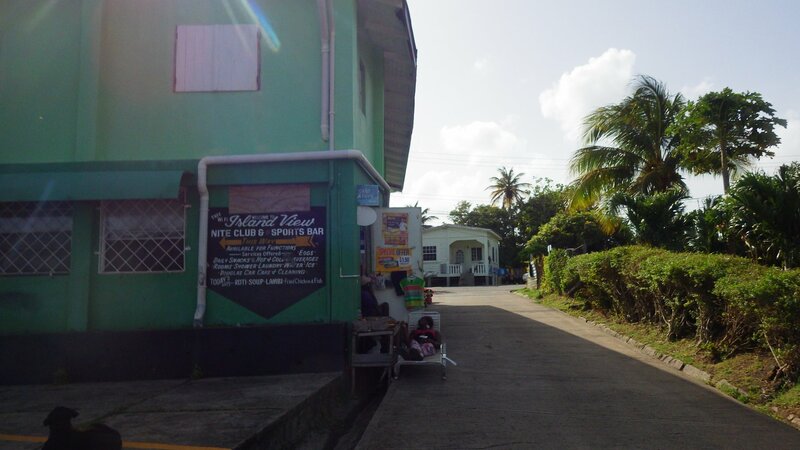 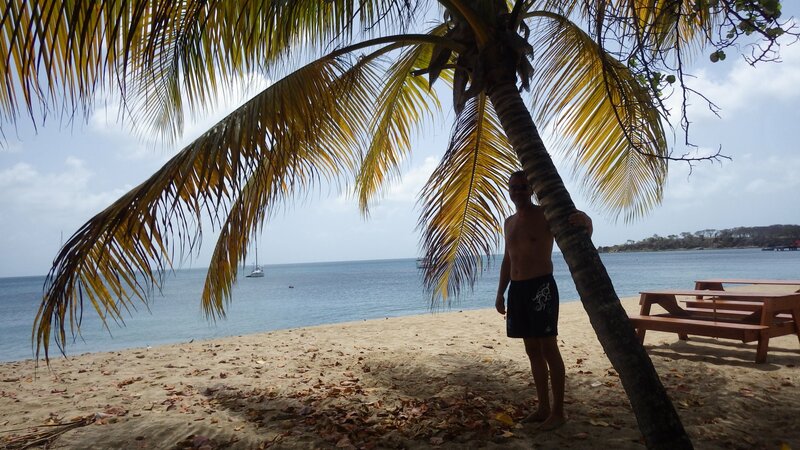 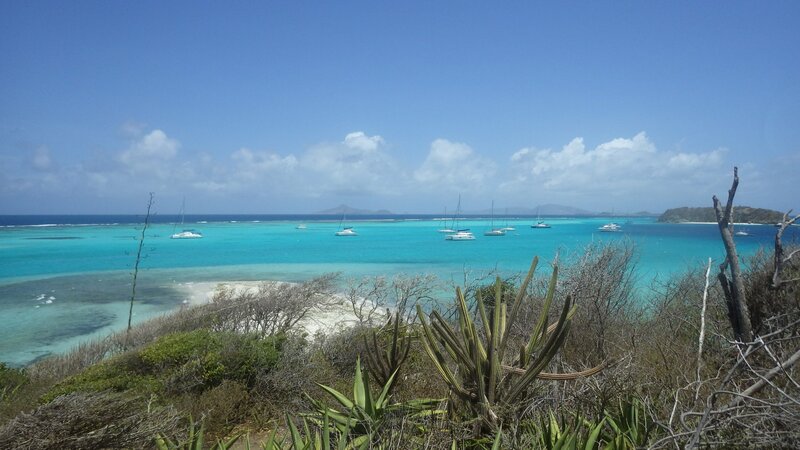 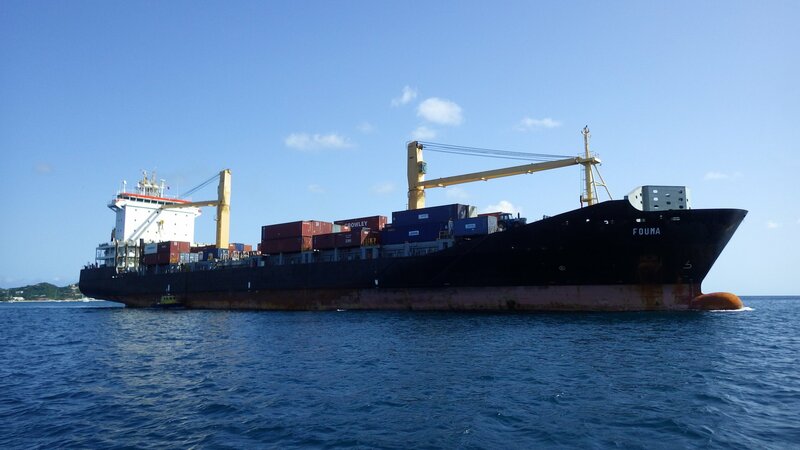 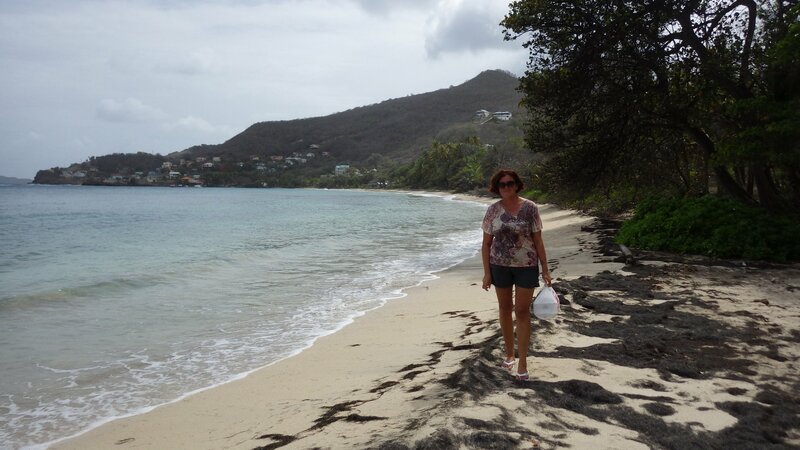 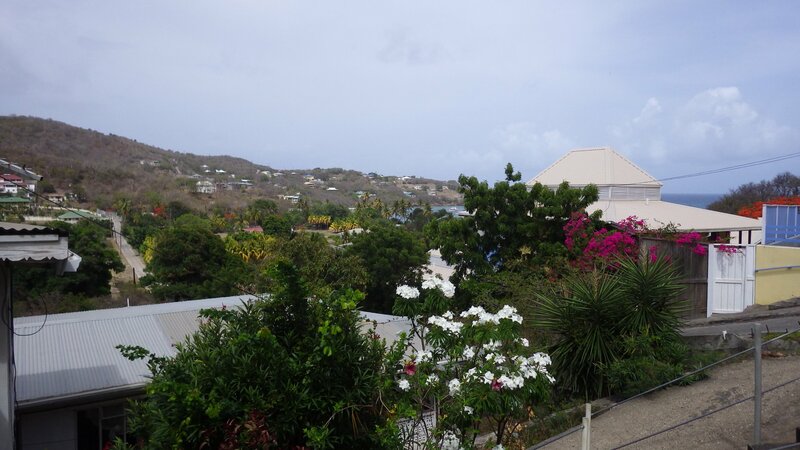 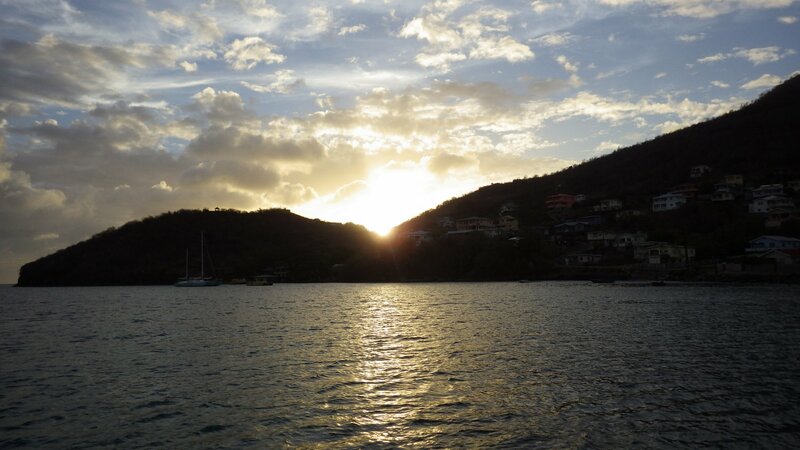 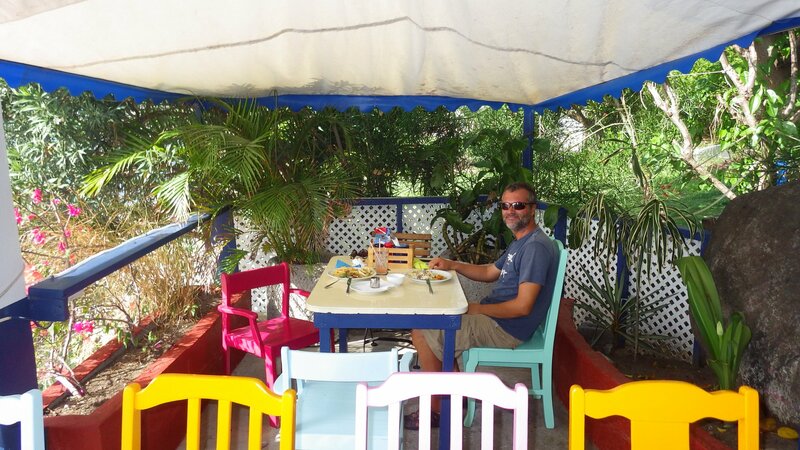 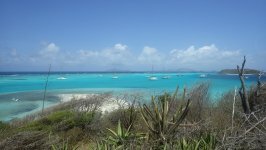 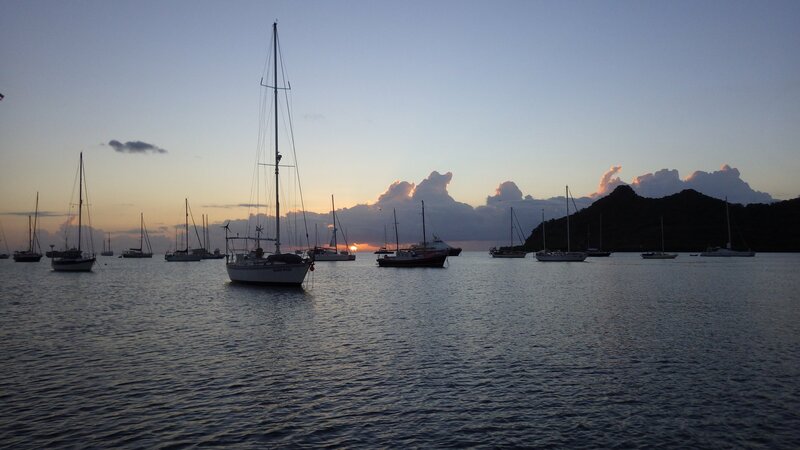 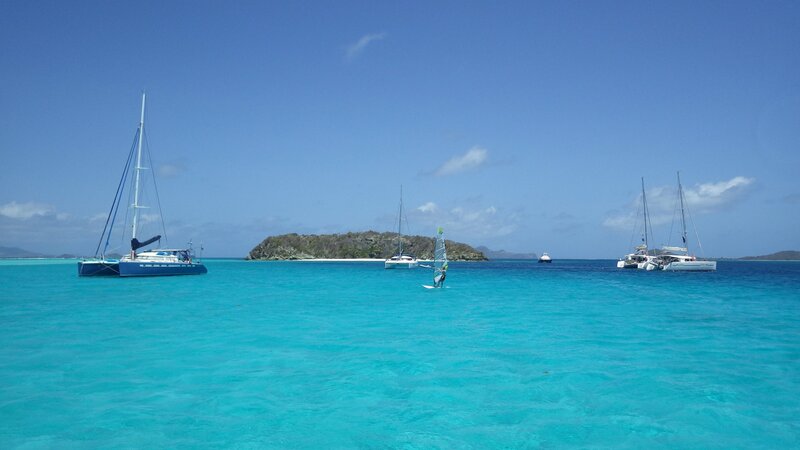 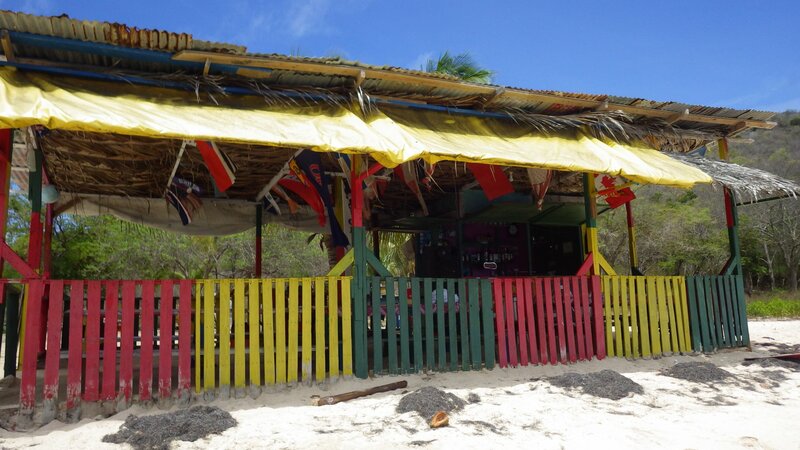 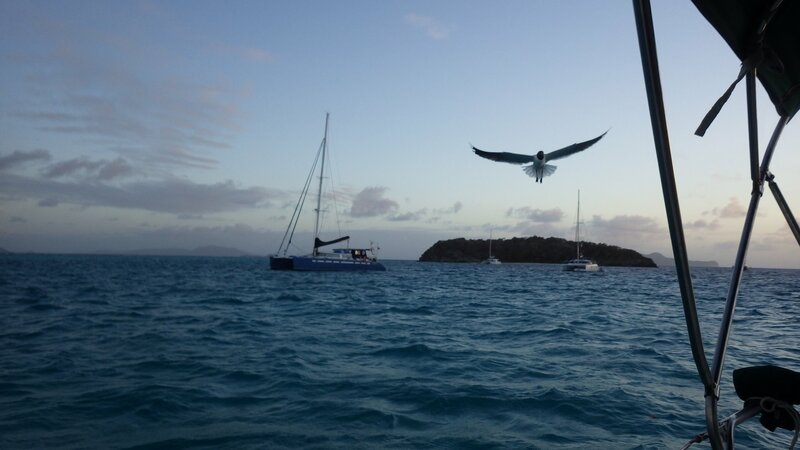 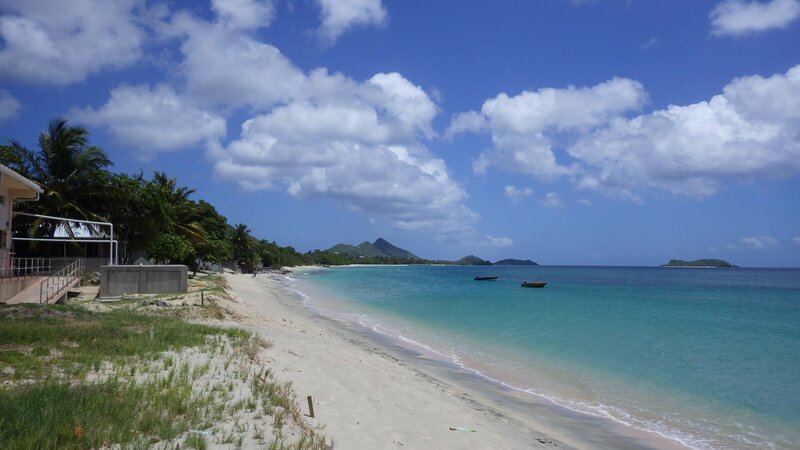 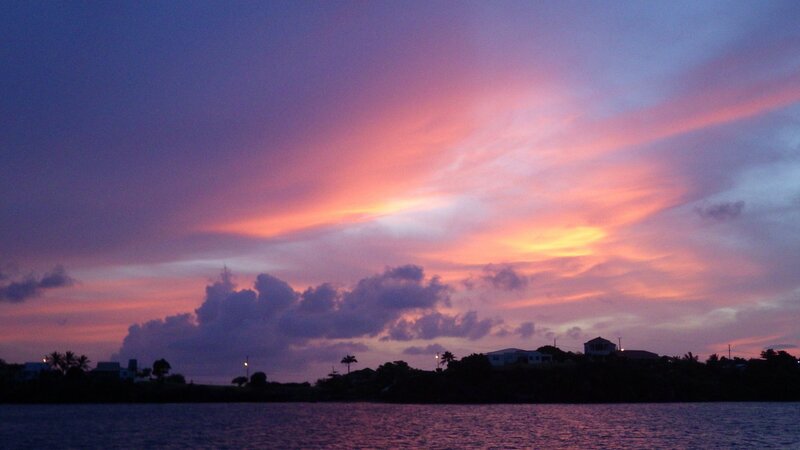 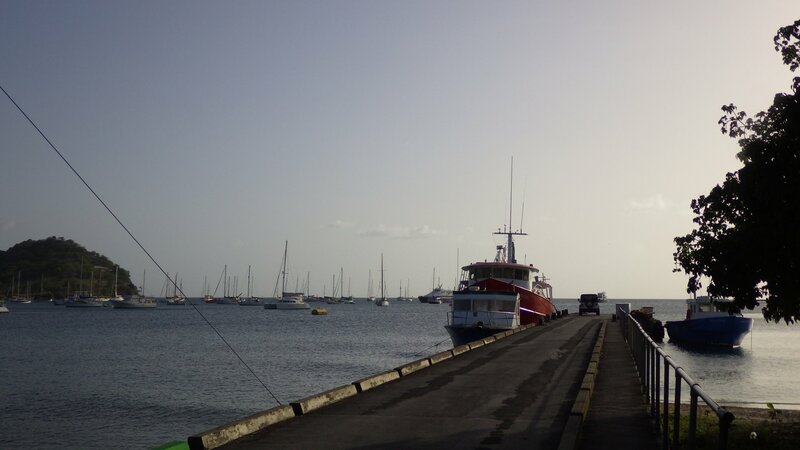 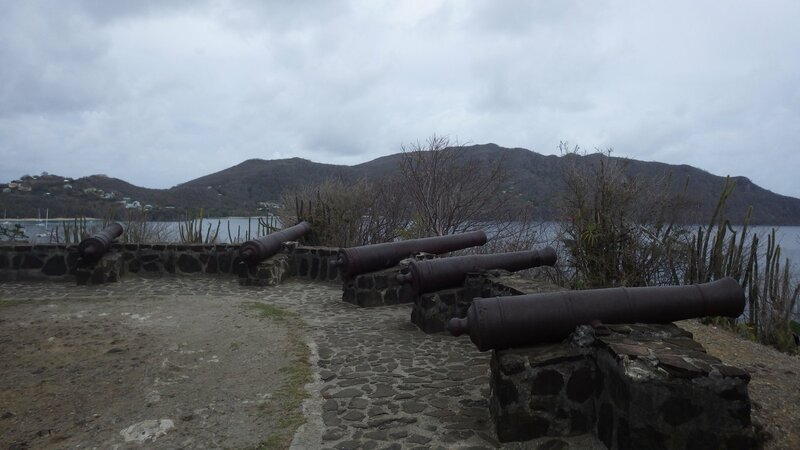 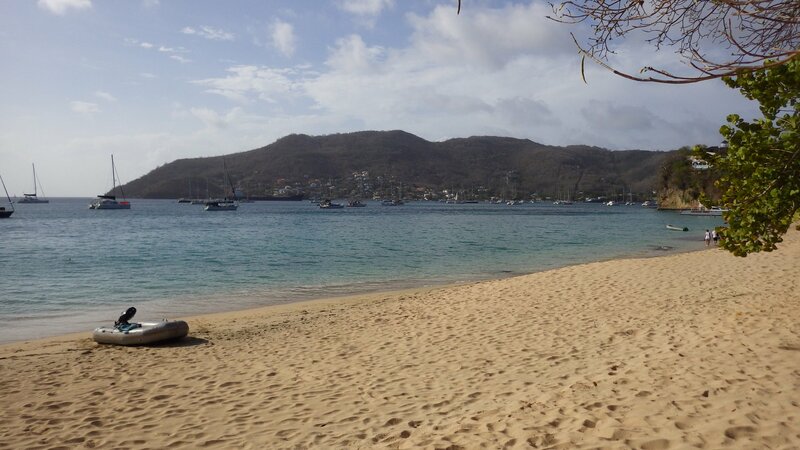 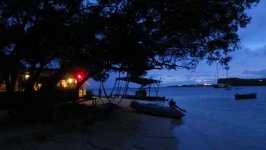 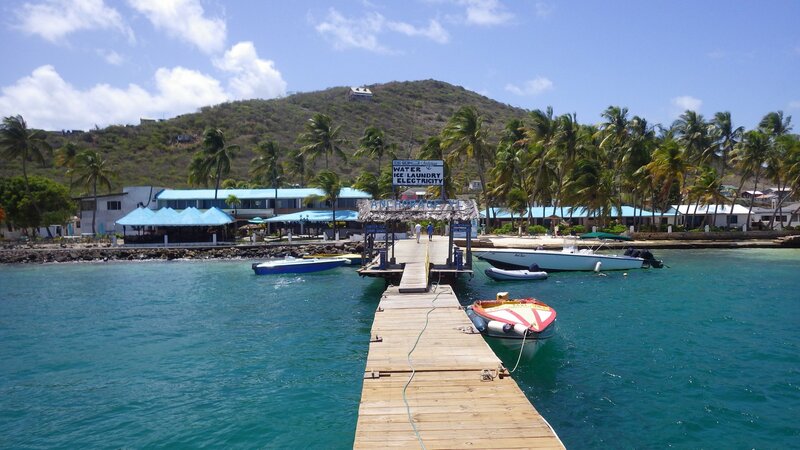 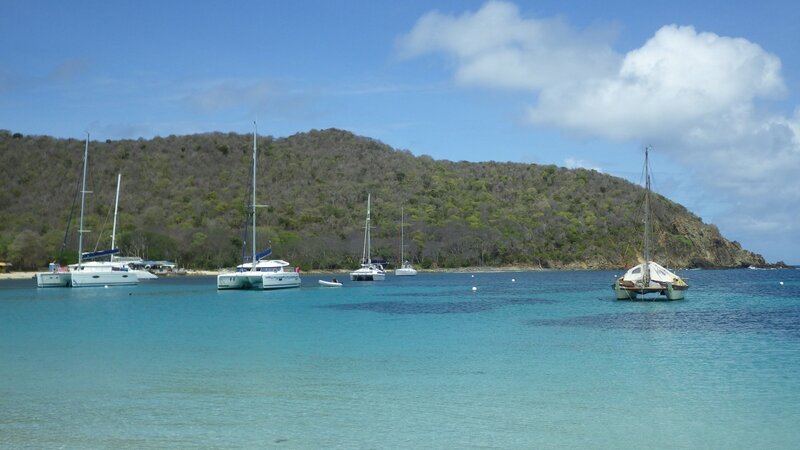 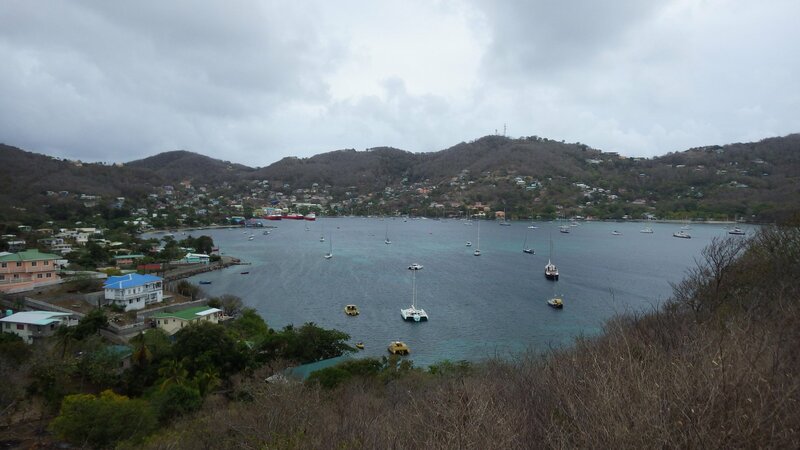 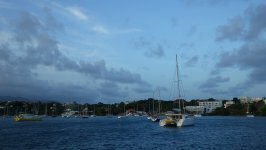 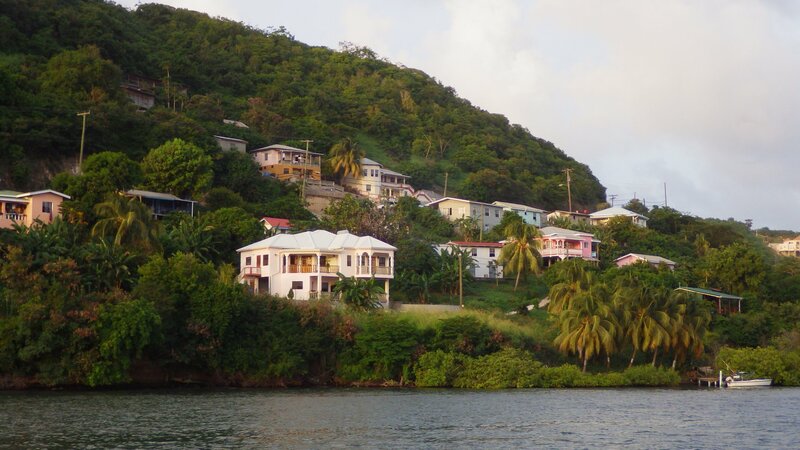 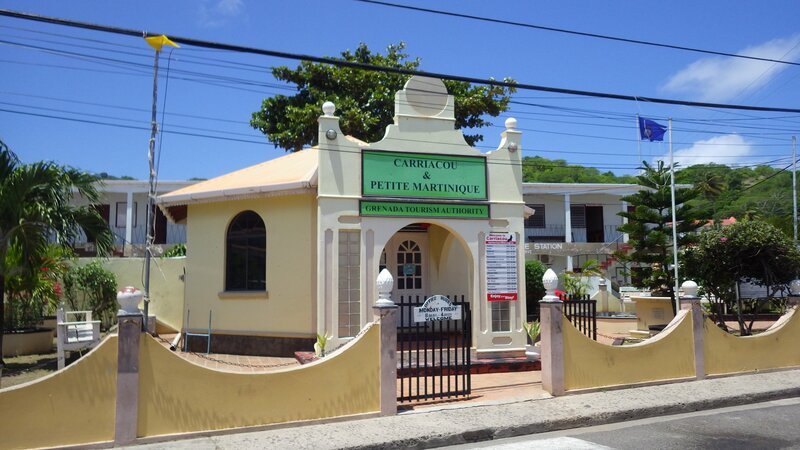 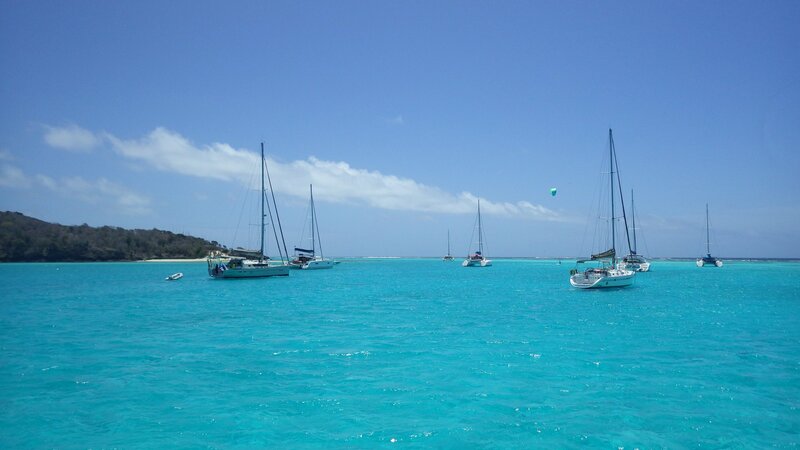 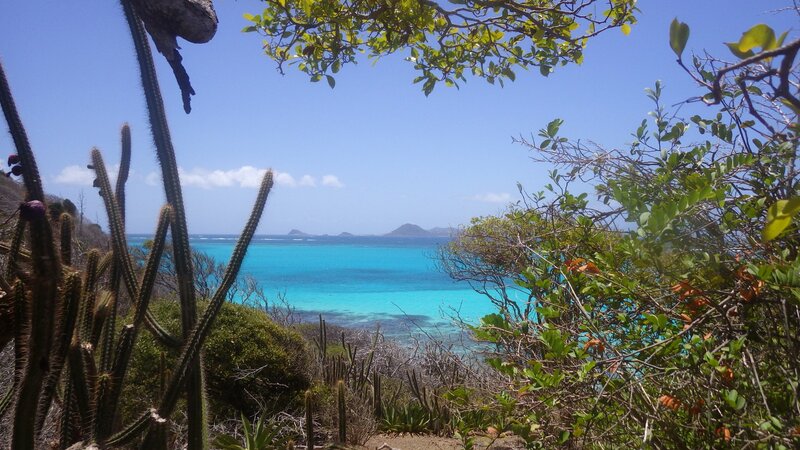 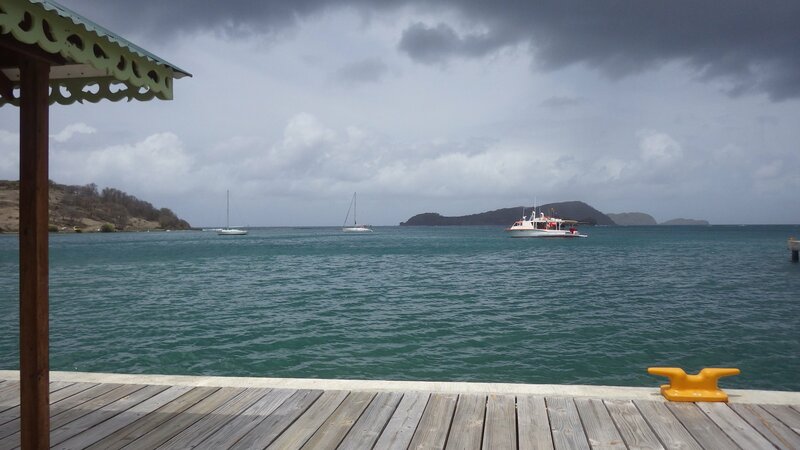 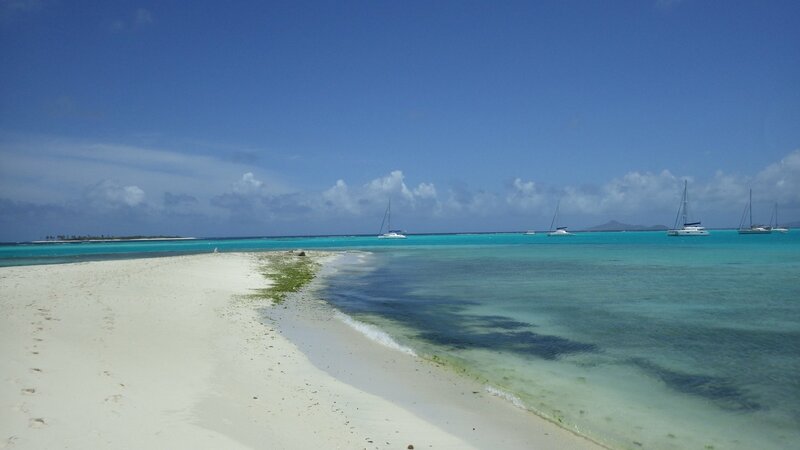 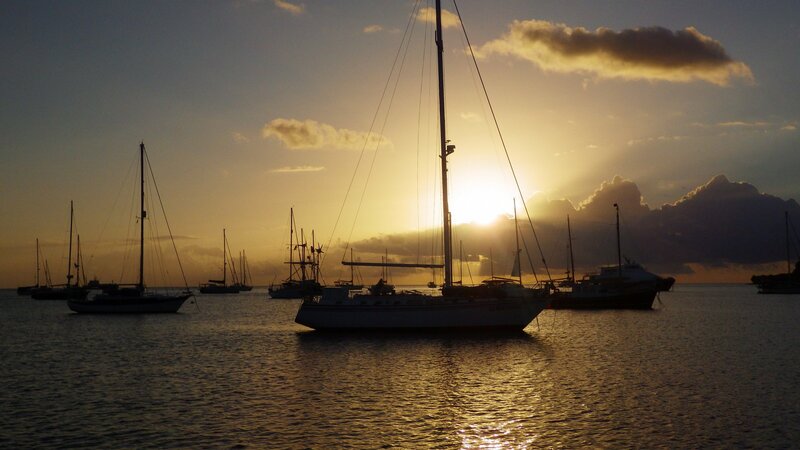 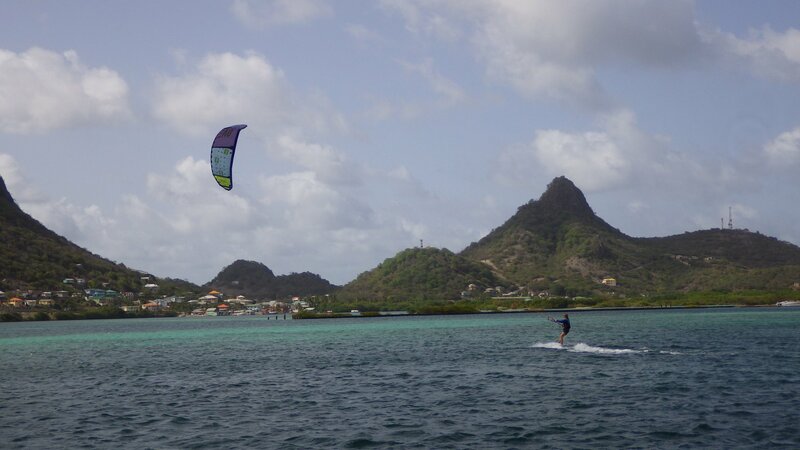 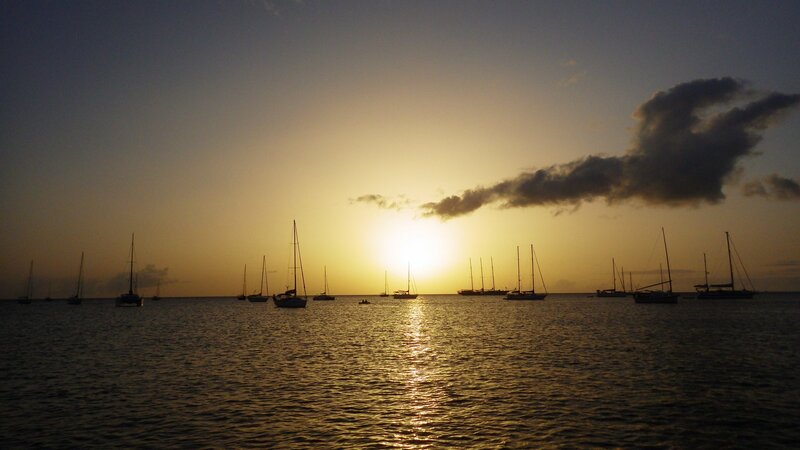 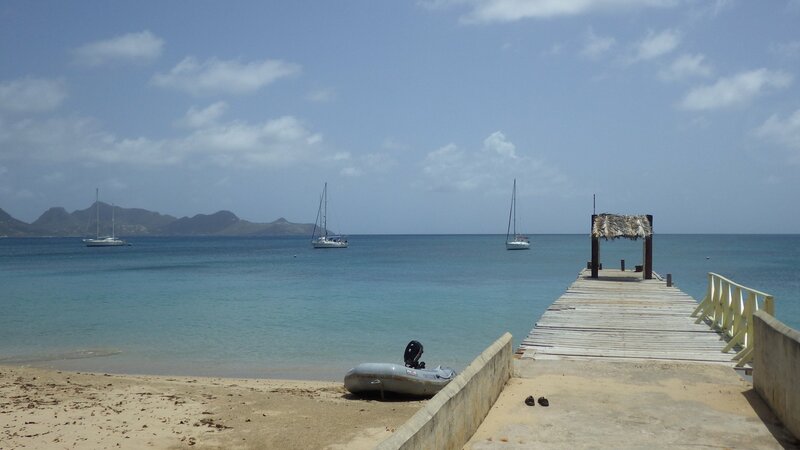 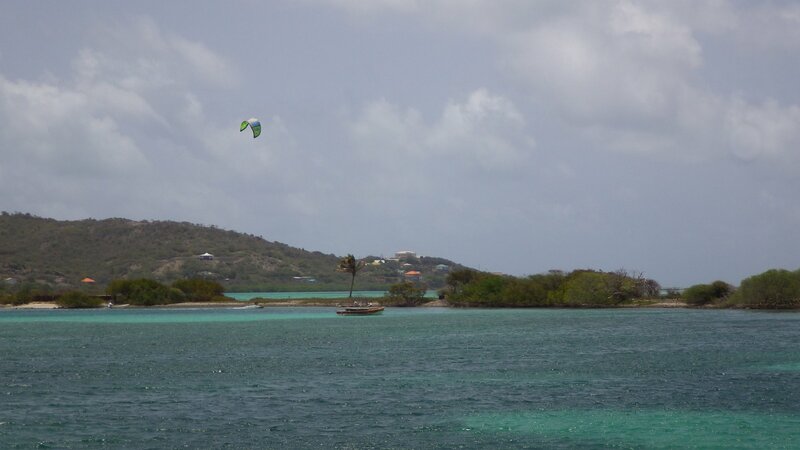 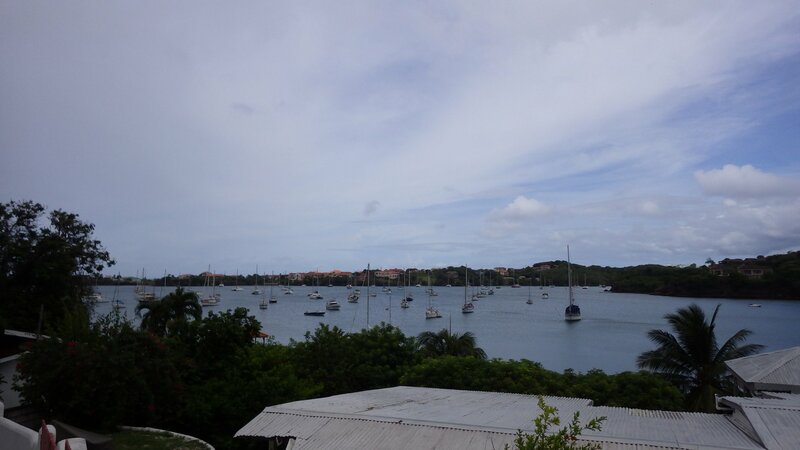 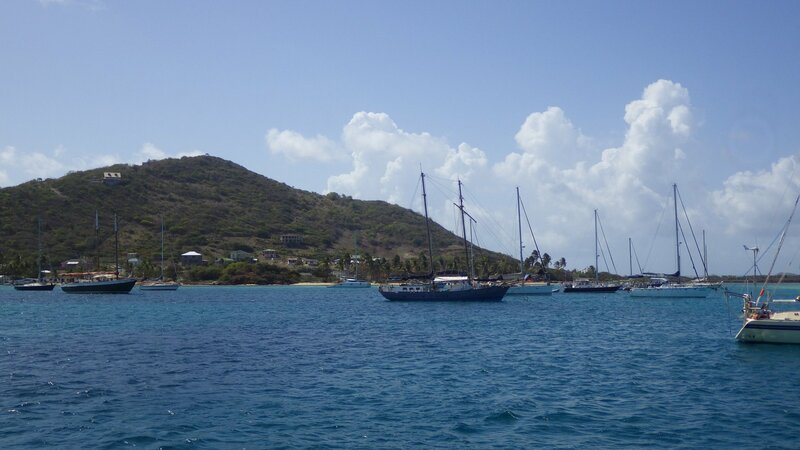 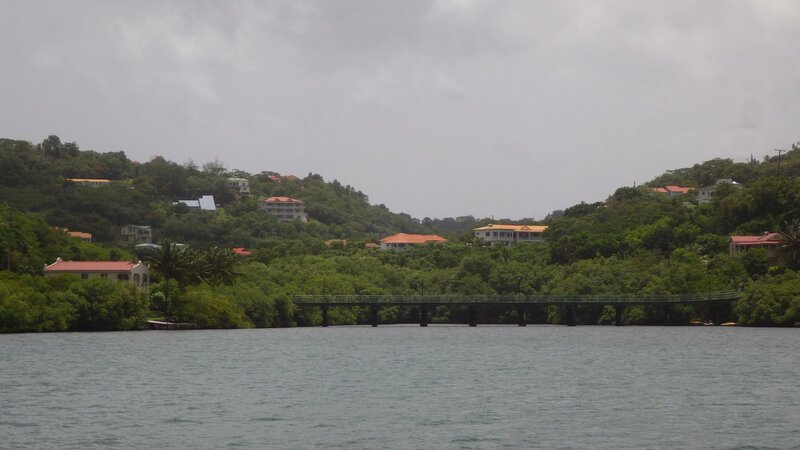 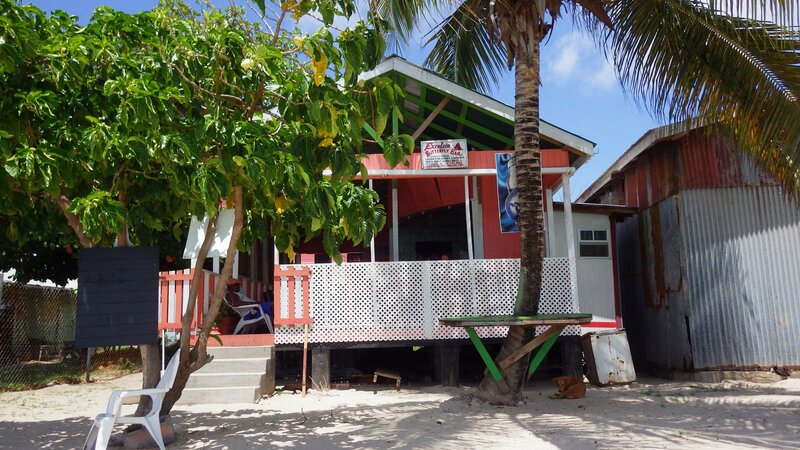 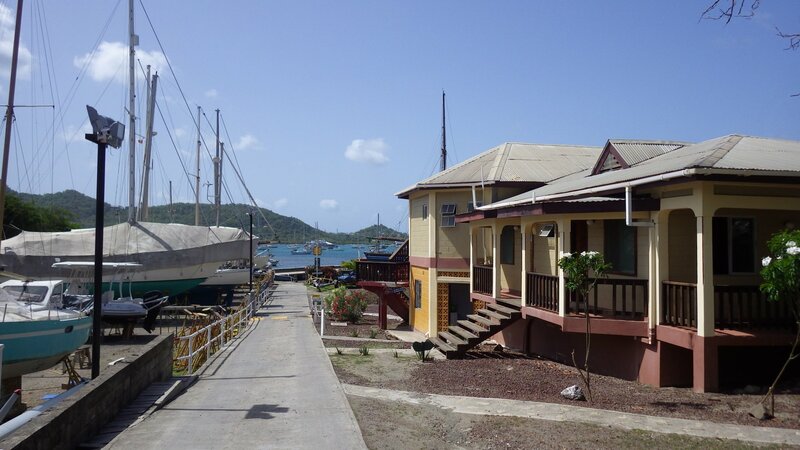 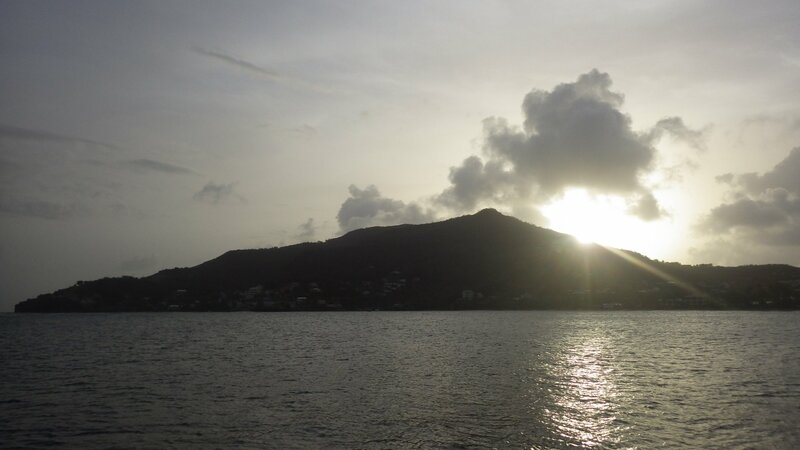 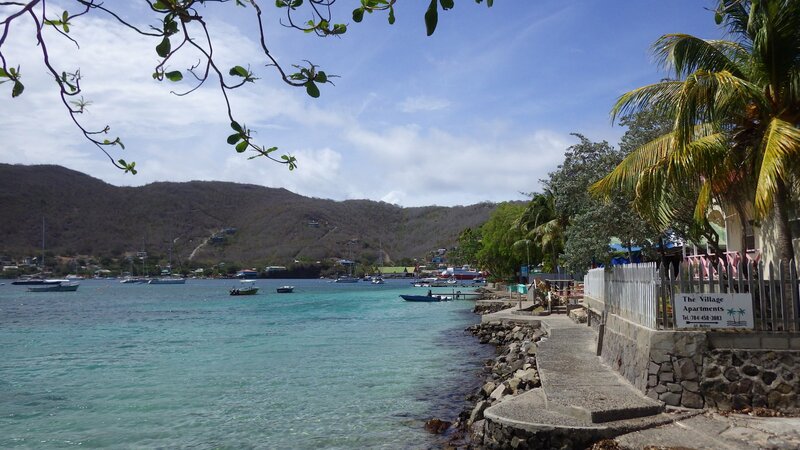 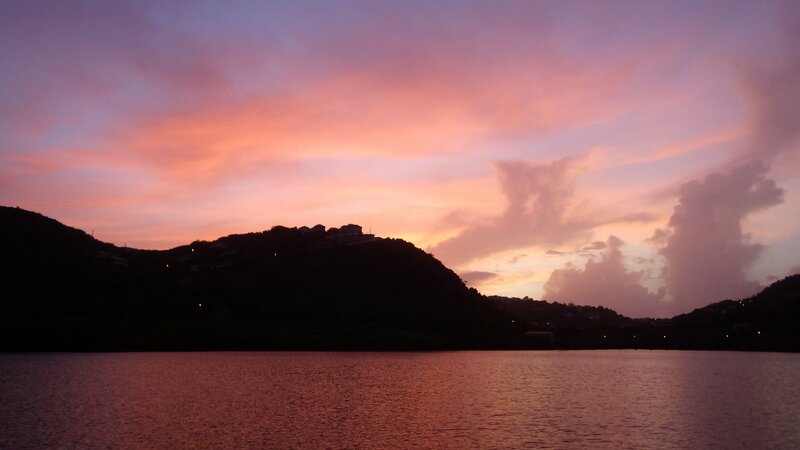 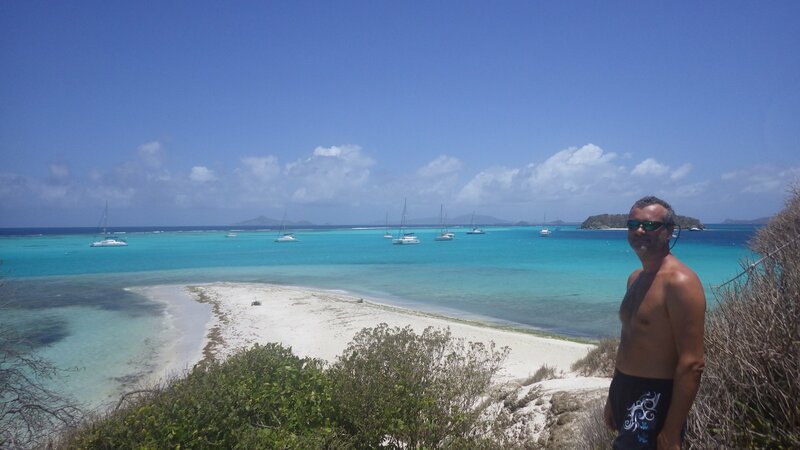 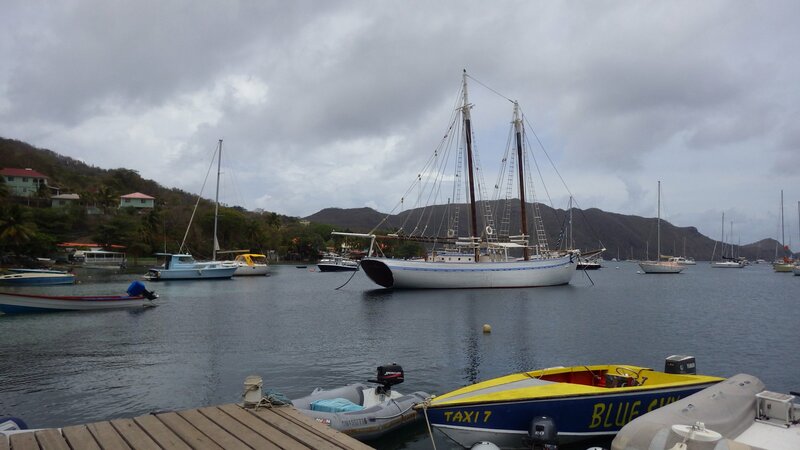 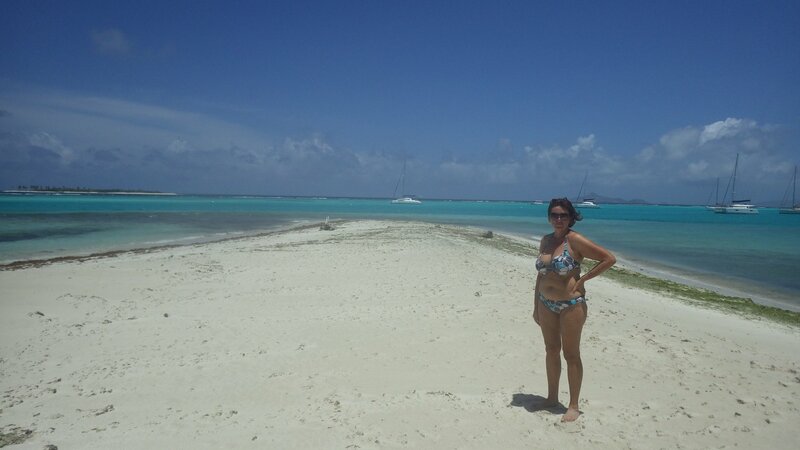 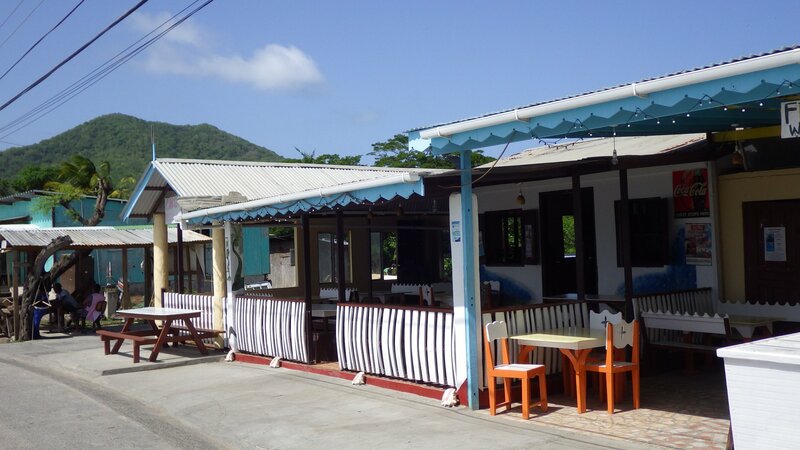 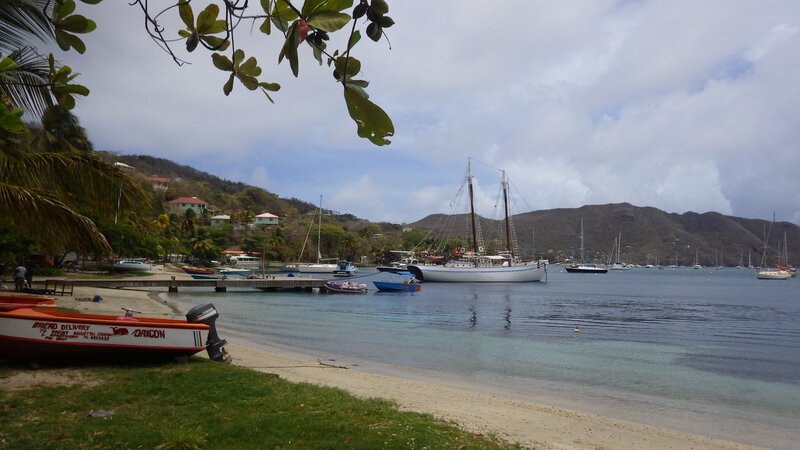 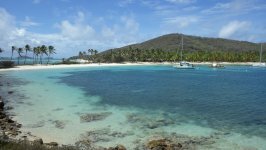 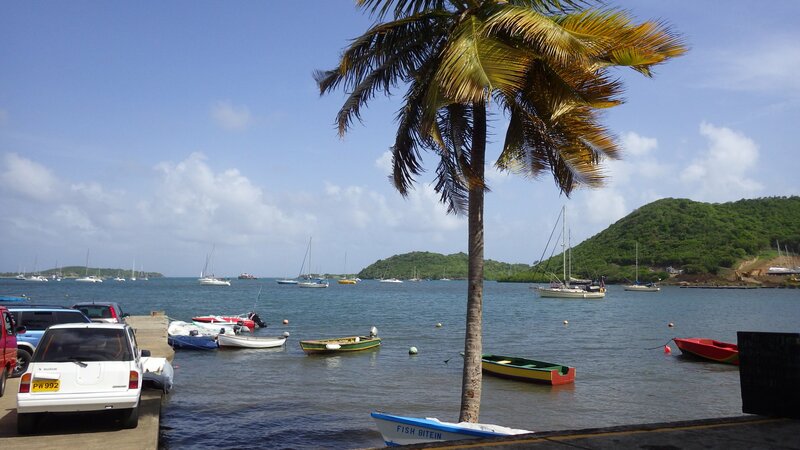 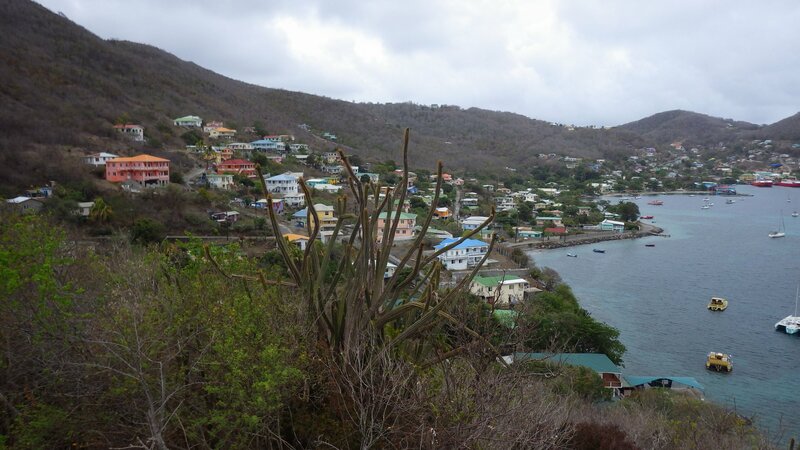 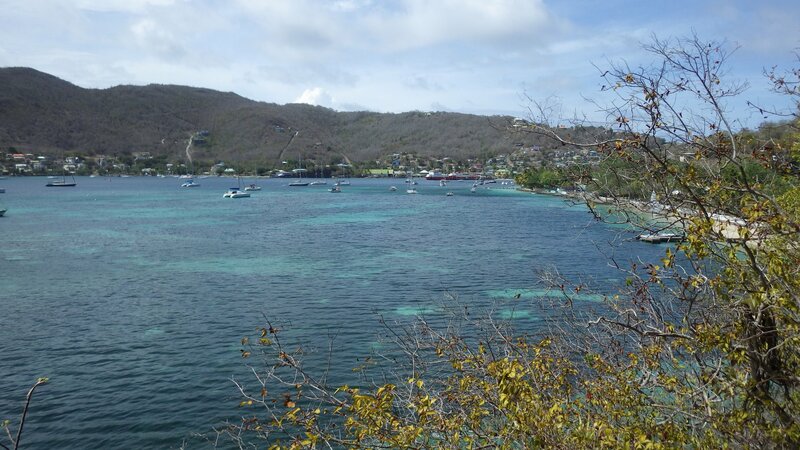 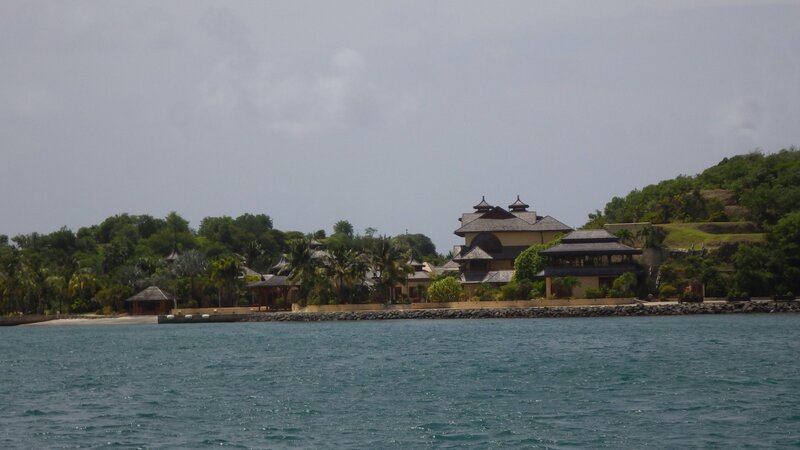 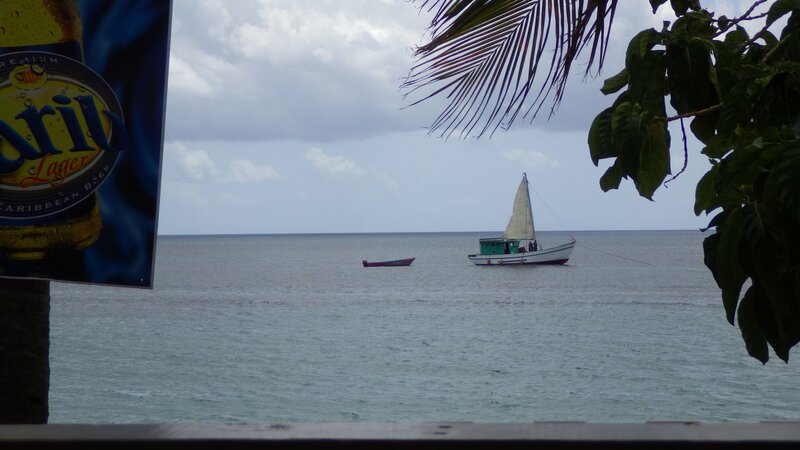 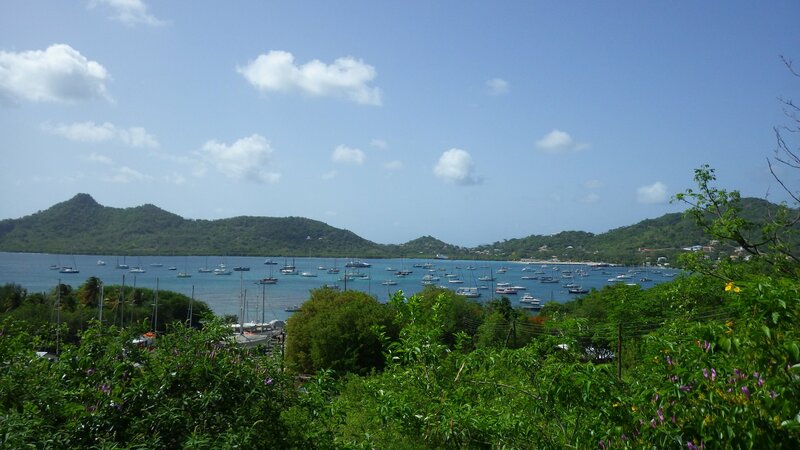 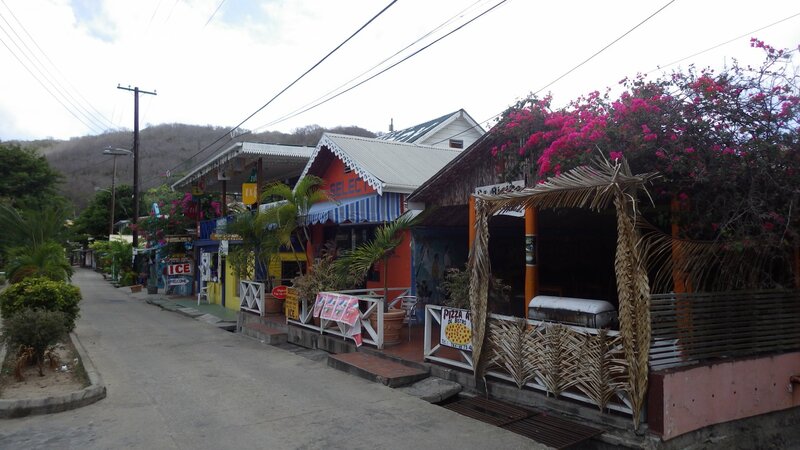 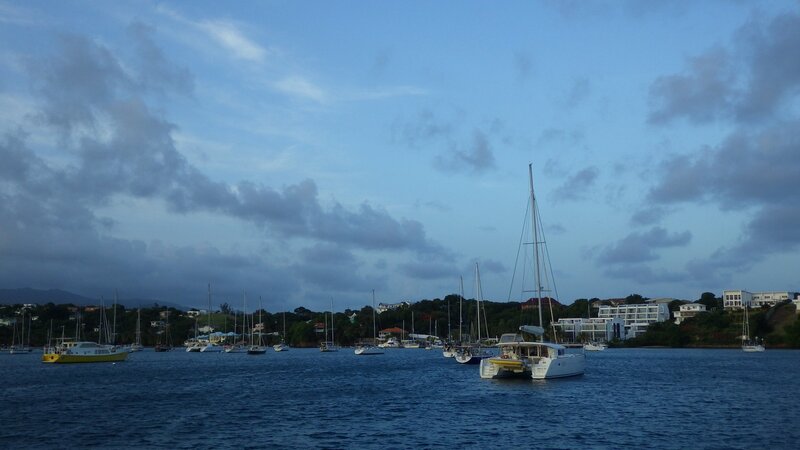 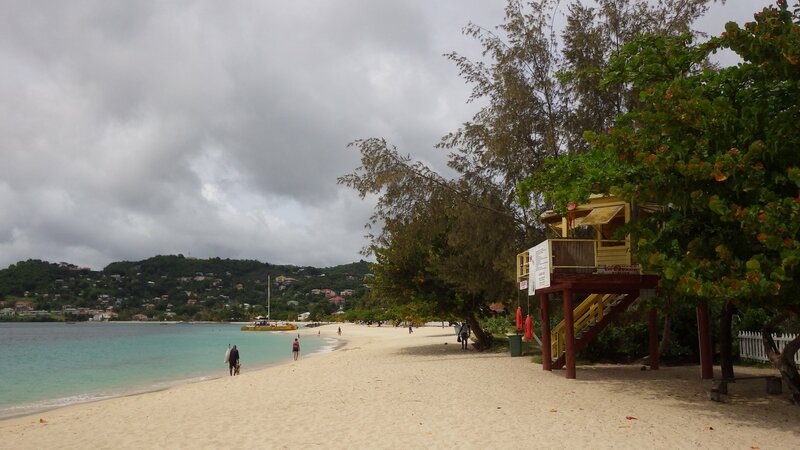 We only stayed for one night in Canouan � didn't like the vibe of the town, and the anchorage was rolly at night. 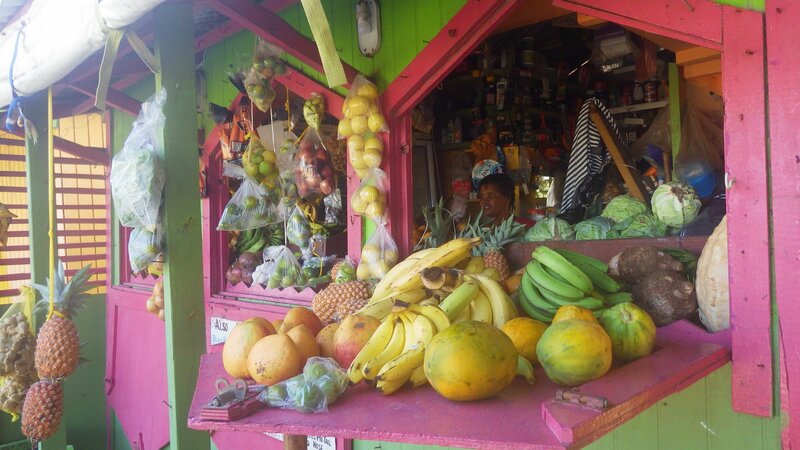 Picked up some fresh produce and fish, didn't go far. 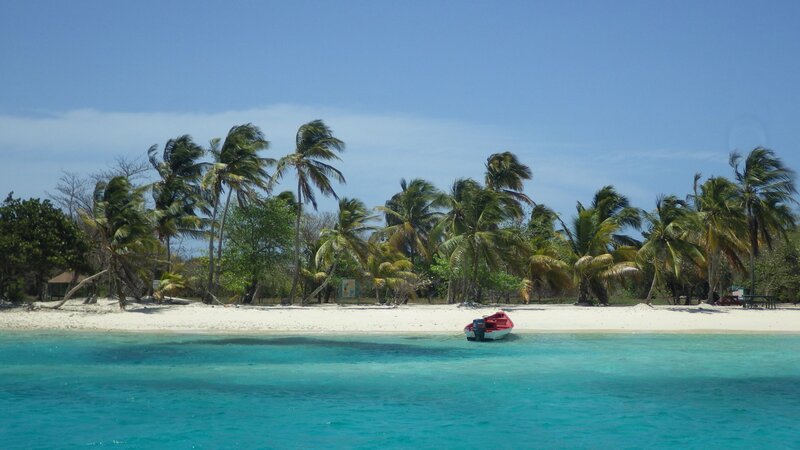 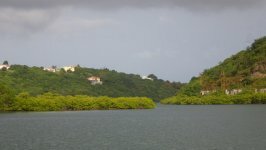 Tobago Keys is THE destination in Caribbean. 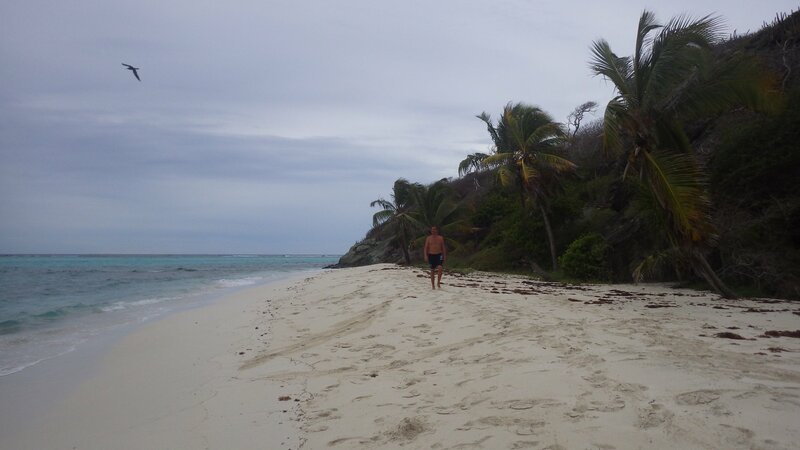 It's also helps to be here off season, when there are fewer crowds. 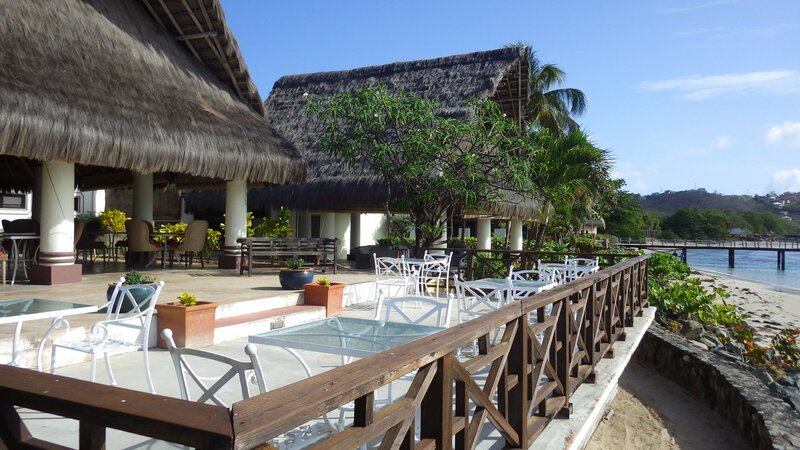 We arrived here on a perfect sunny day. 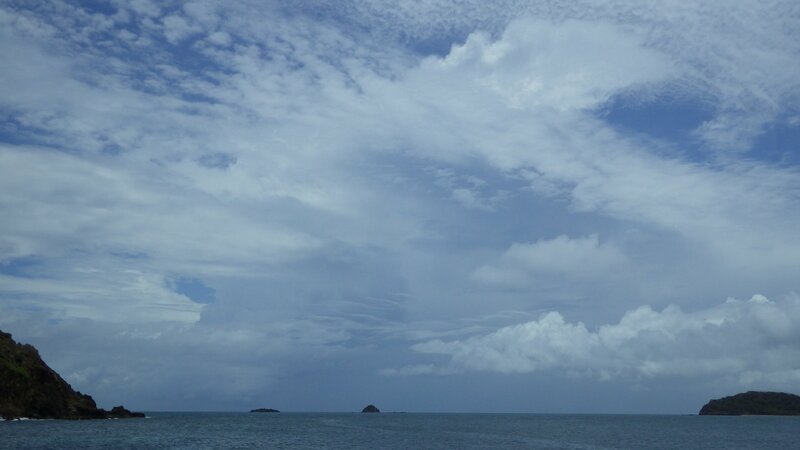 The next day tropical wave came in with windy night and couple of cloudy days afterwards. 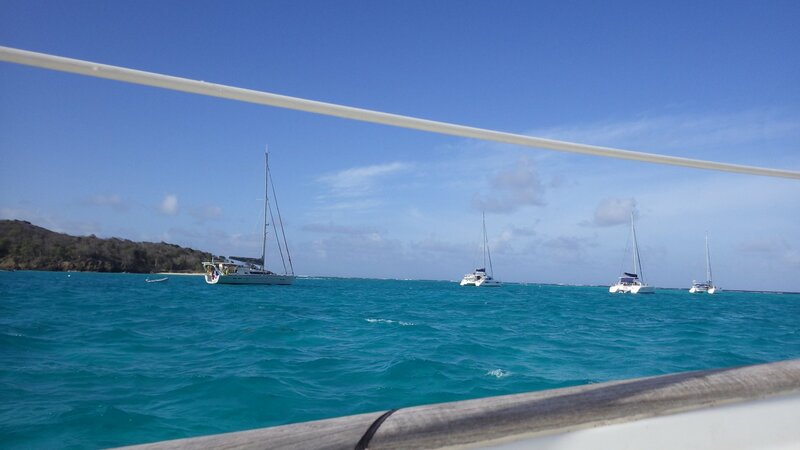 The fish was biting our toes as we were swimming off the transom platform. 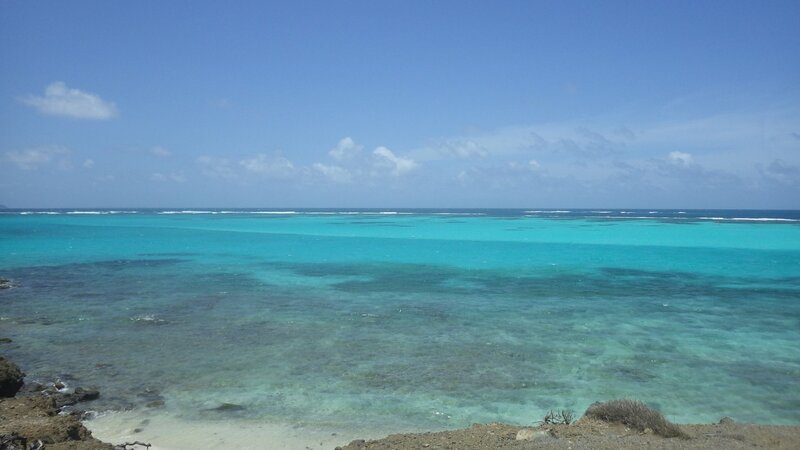 Didn't get to see much of sea turtles. 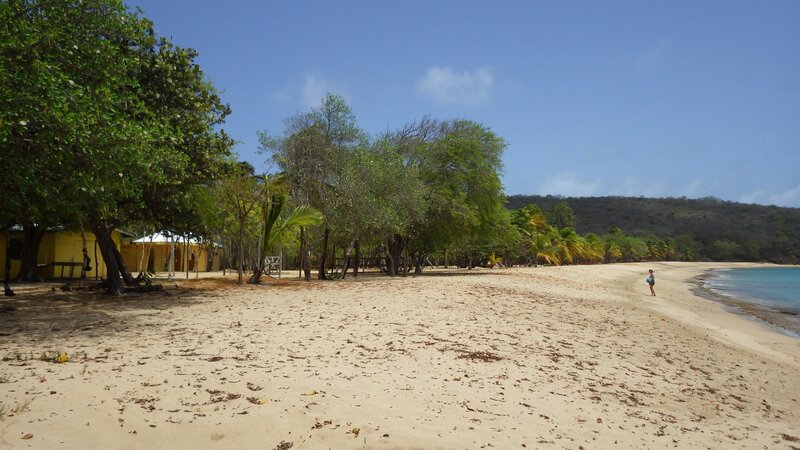 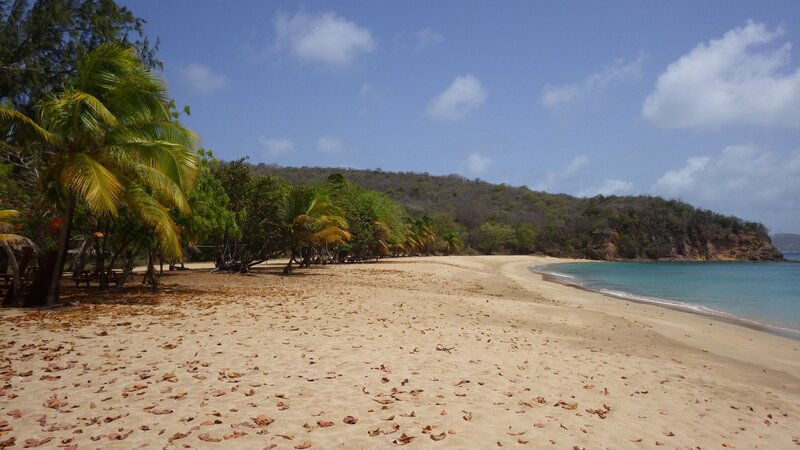 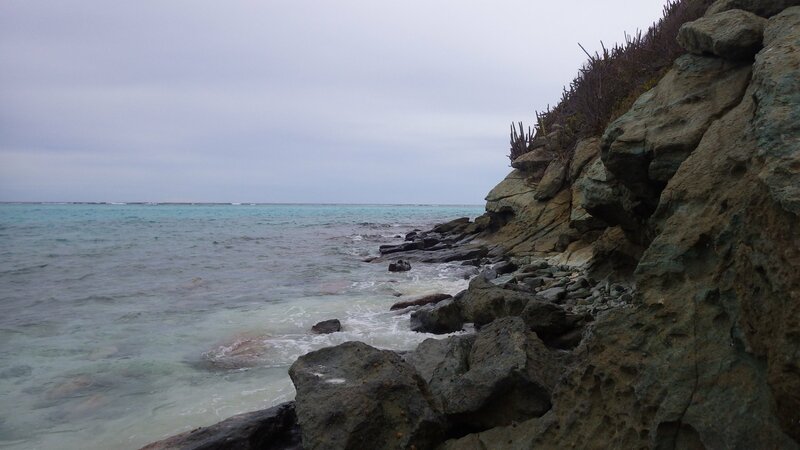 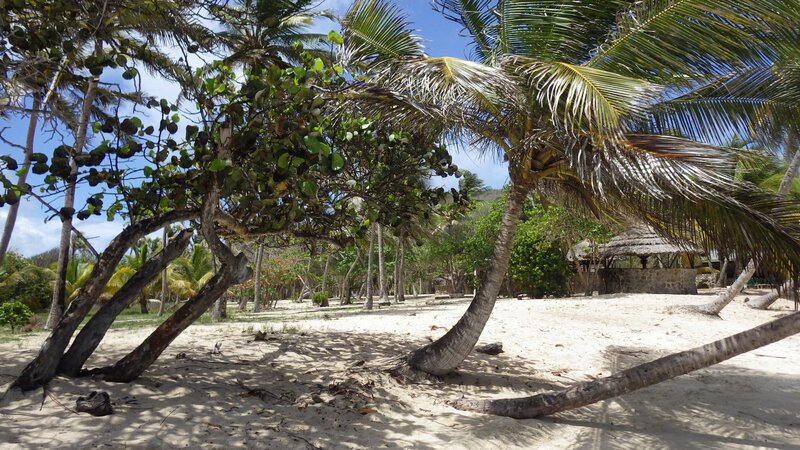 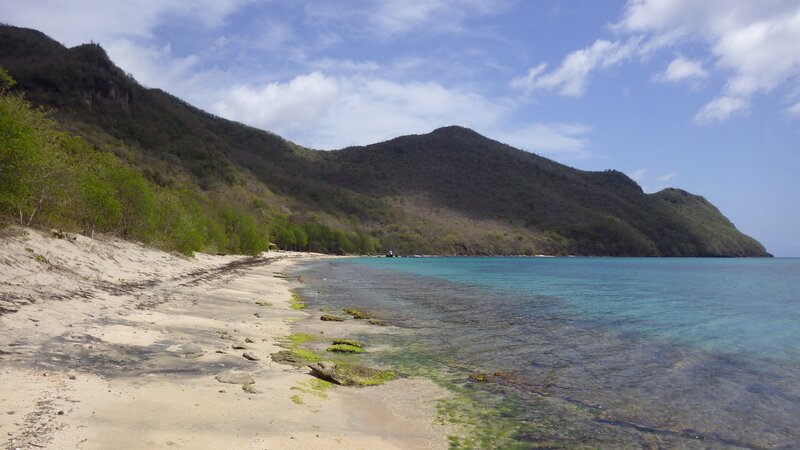 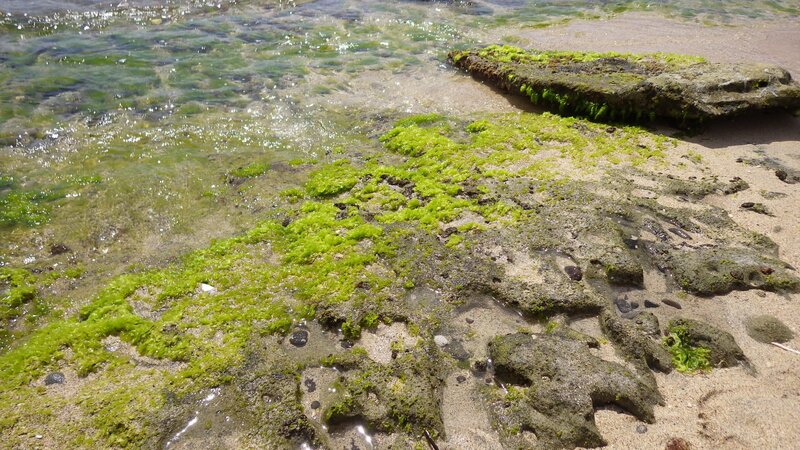 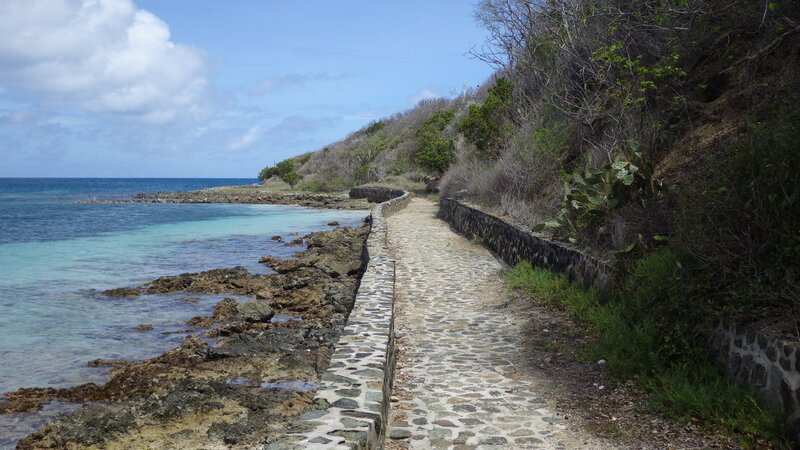 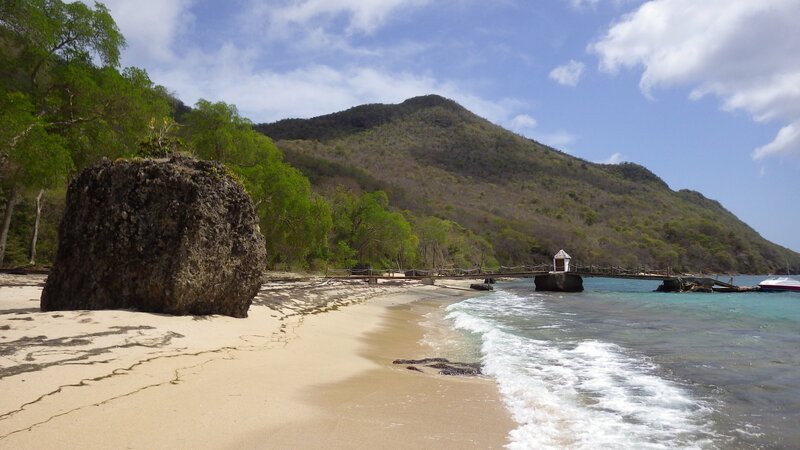 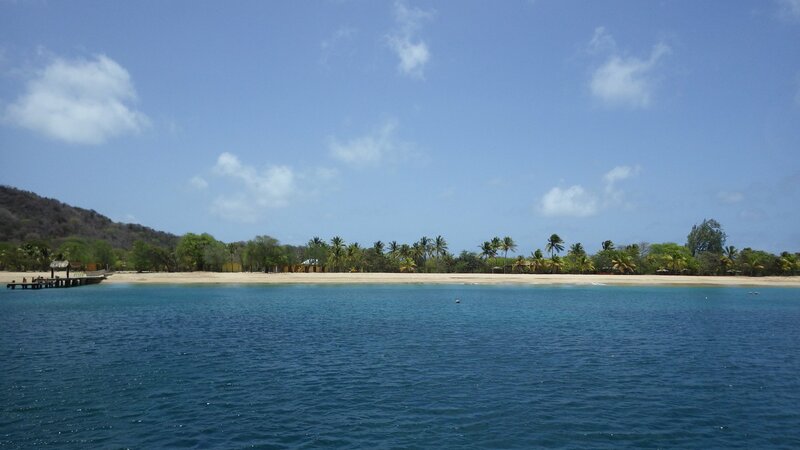 I have found Salt Whistle Bay at the NorthWest corner of Mayreau Island to be pretty, but too small and overcrowded. 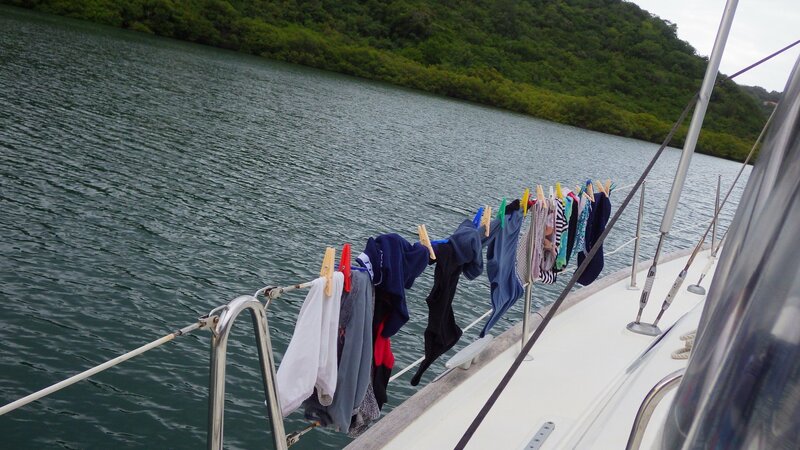 Mooring balls take most of the anchorage area, annoying "park ranger" kept giving instructions to boaters, and then there are boat boys who often come over to your boat and try to sell you stuff. 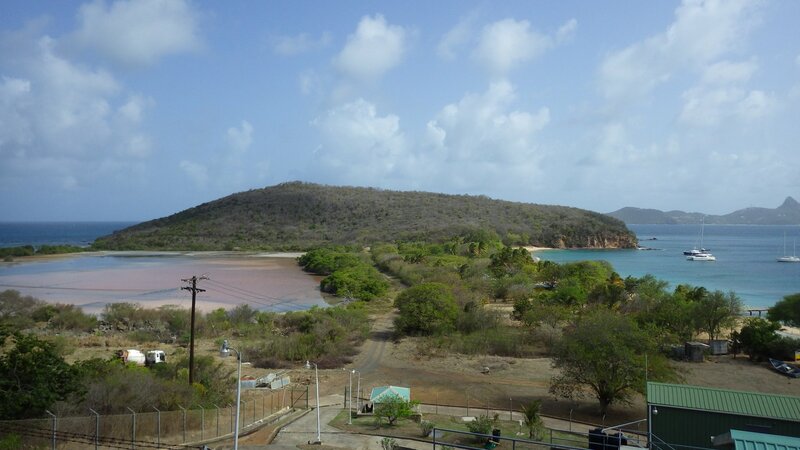 We really liked the Saline Bay. 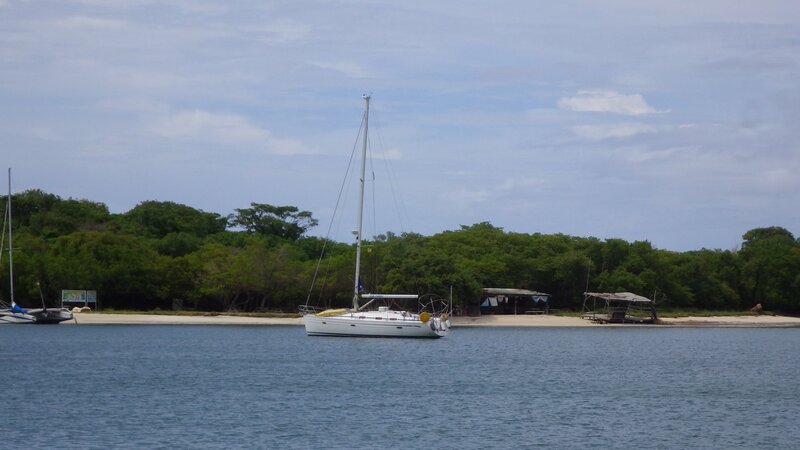 The anchorage is pretty, spacious, protected and not visited by many. 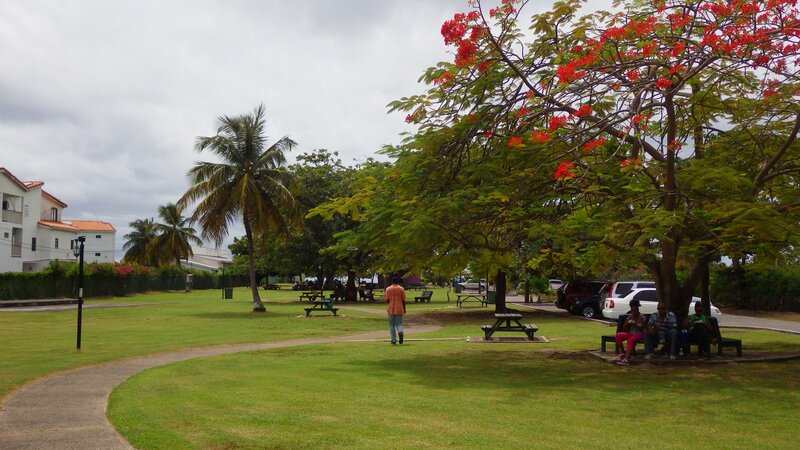 The beach park (for occasional cruiseship crowd) is clean, inviting and very picturesque. 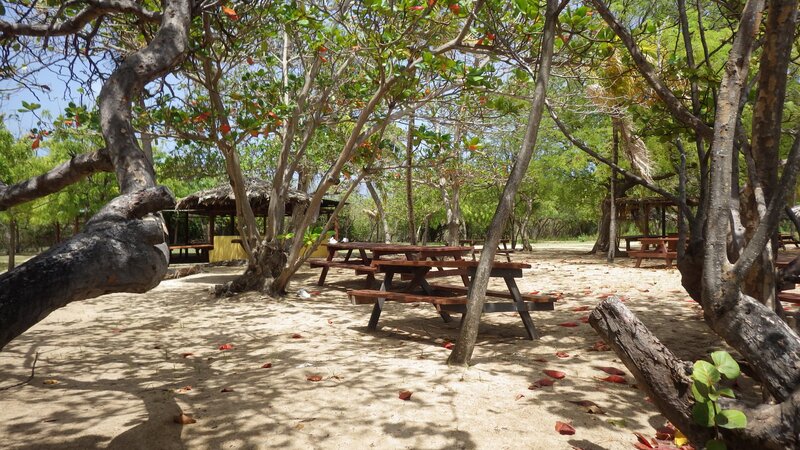 We had memorable picnics and very good time there, along. 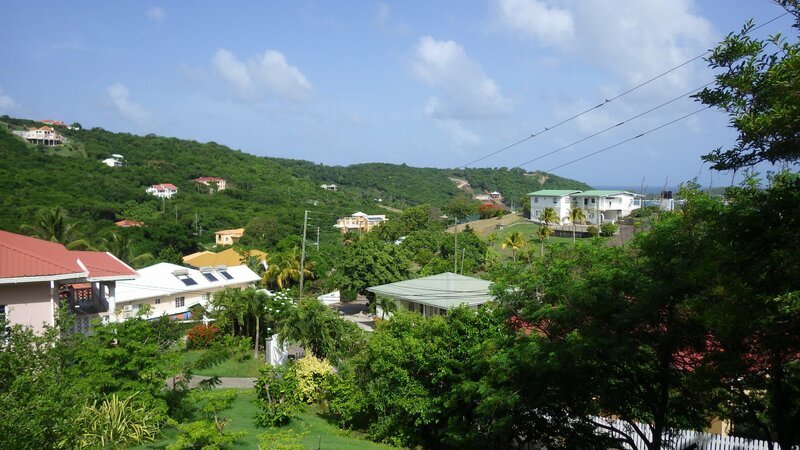 Up the hill, there is a small local town. 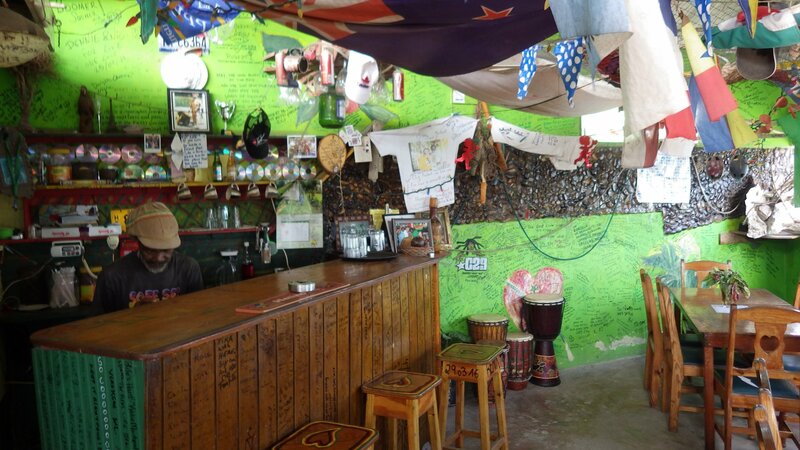 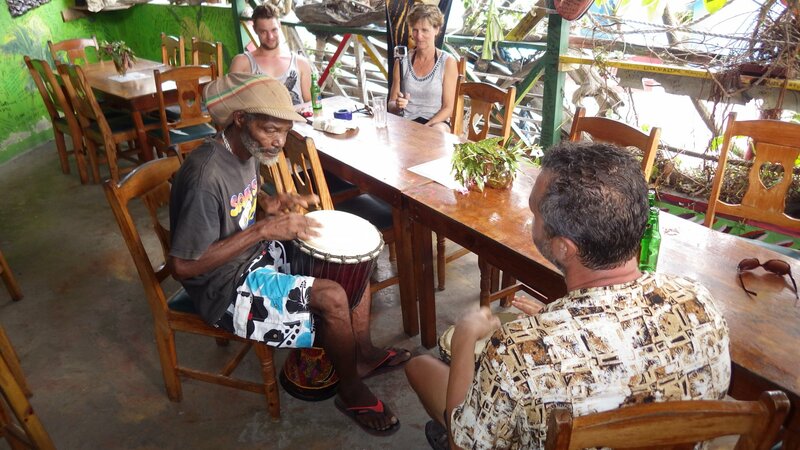 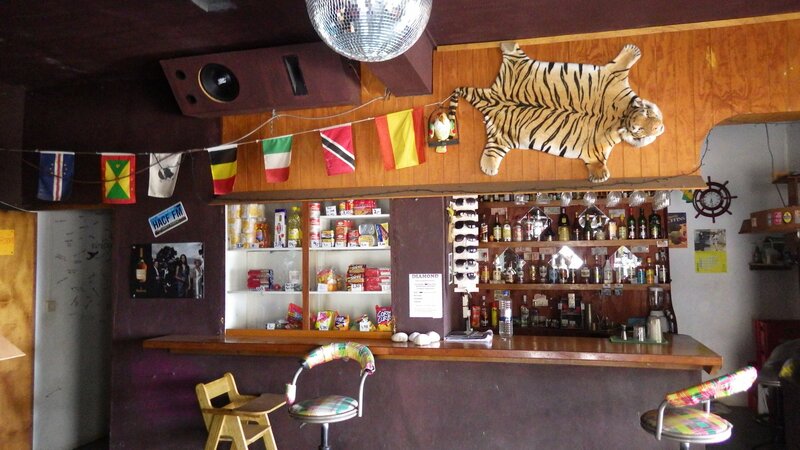 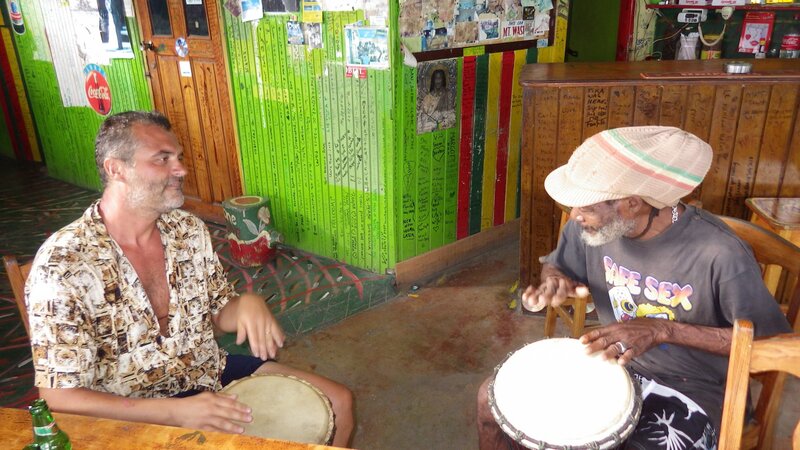 We have visited an interesting bar there and, after some drinks, I had drum session with a bar host. 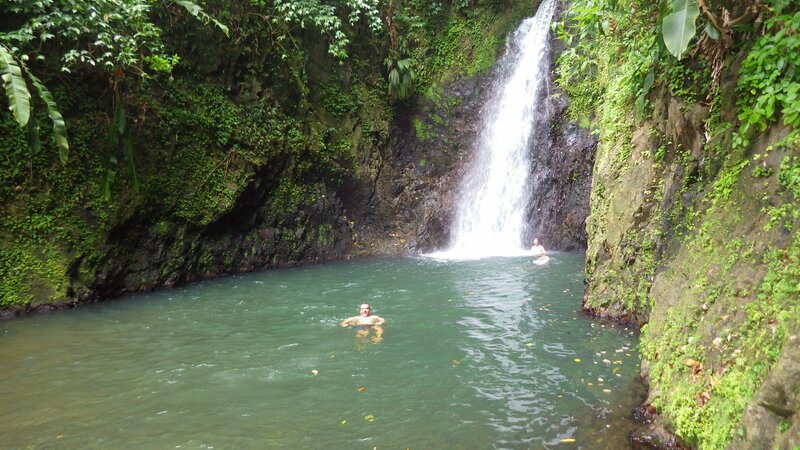 It was really fun. 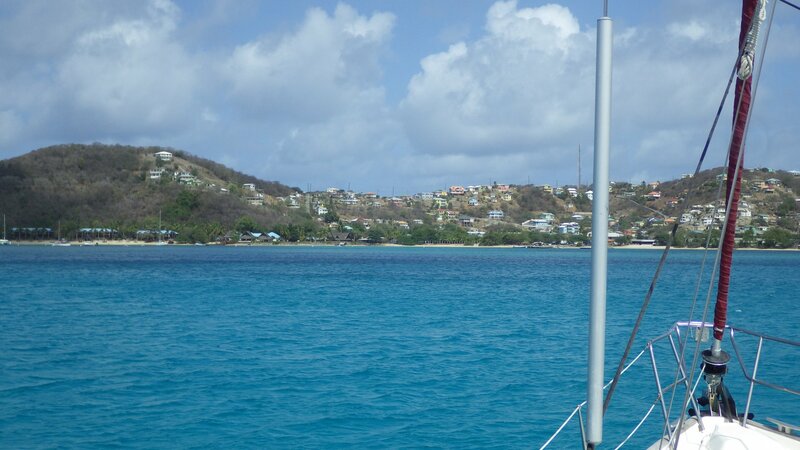 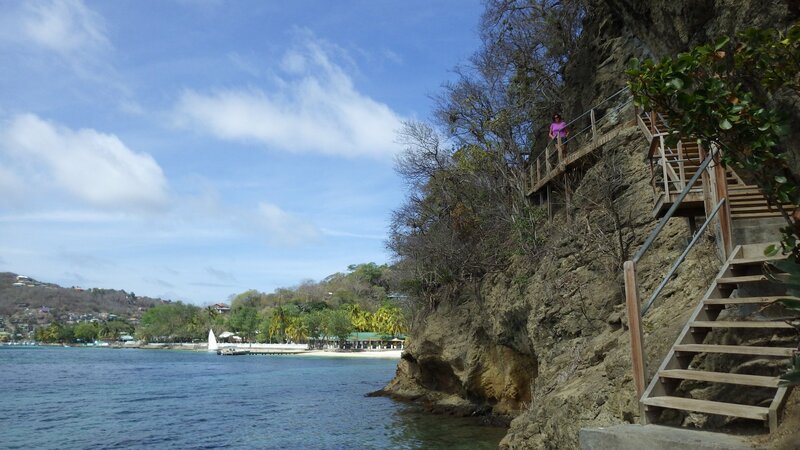 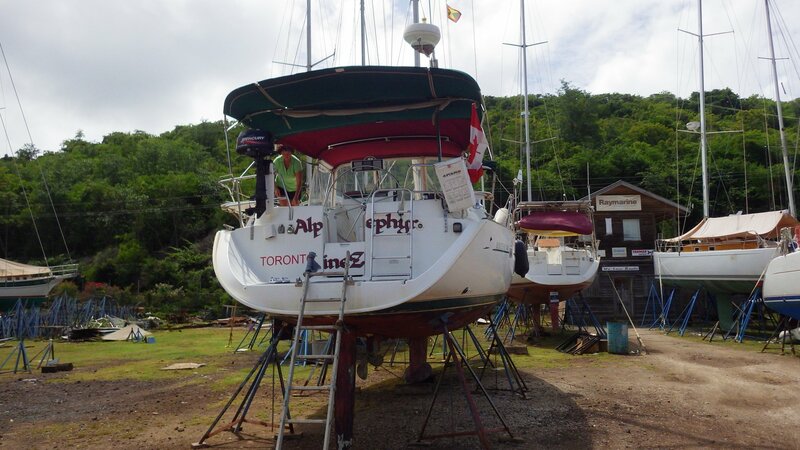 We visited Clifton primarily to clear out of the Saint Vincent and Grenadines before sailing to Grenada. 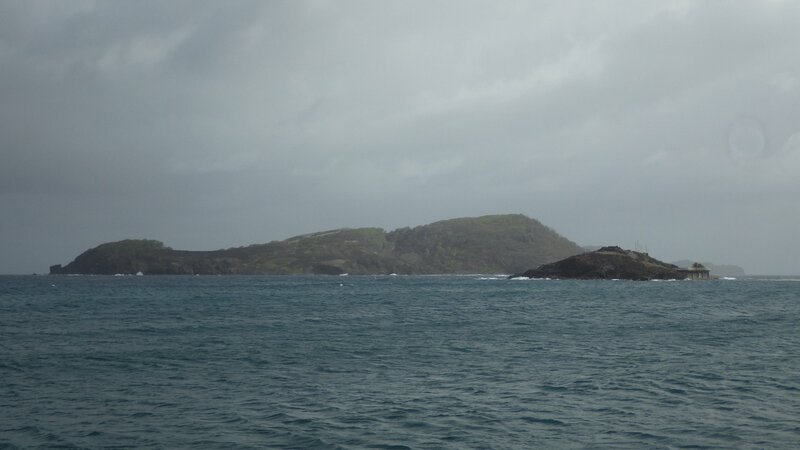 The Clifton Harbour anchorage is protected from large waves by a reef, but is still windy and not really comfortable. 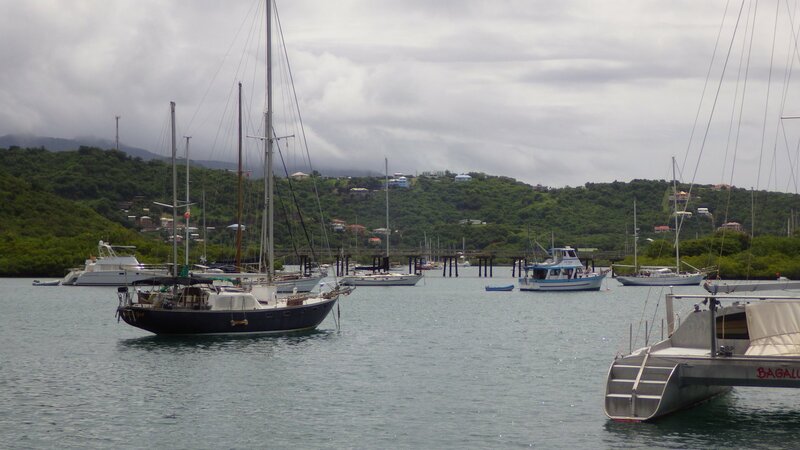 After filling up our water tanks at Anchorage Yacht Club dock, we went ashore, visited a waterfront restaurant and had a chance to stock up on fresh produce at the local market. 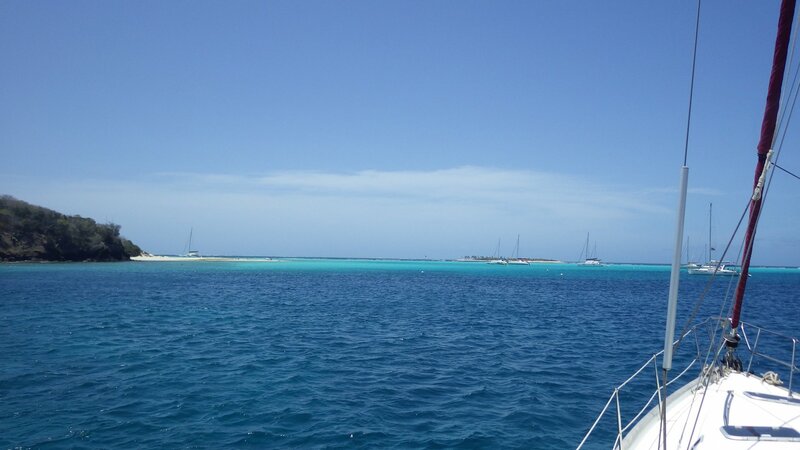 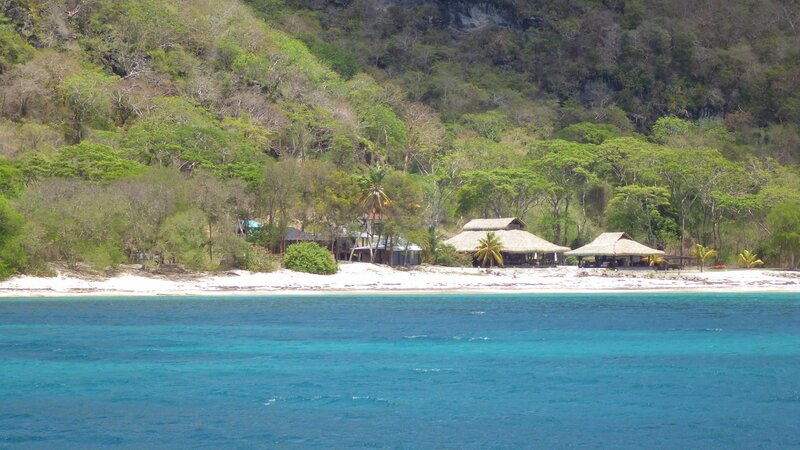 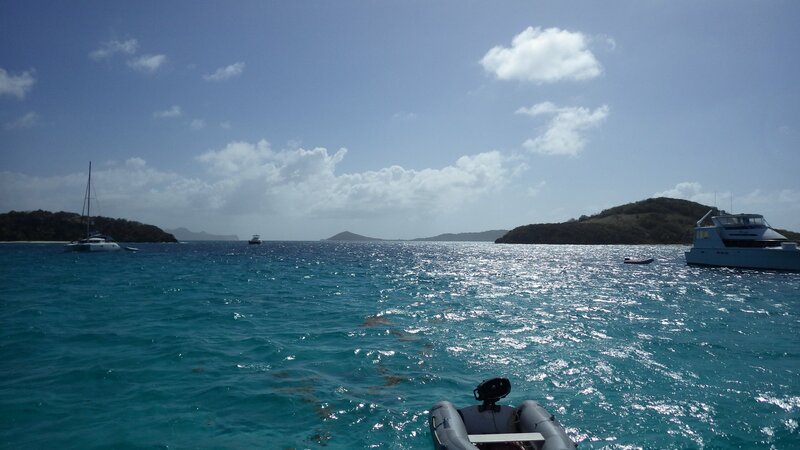 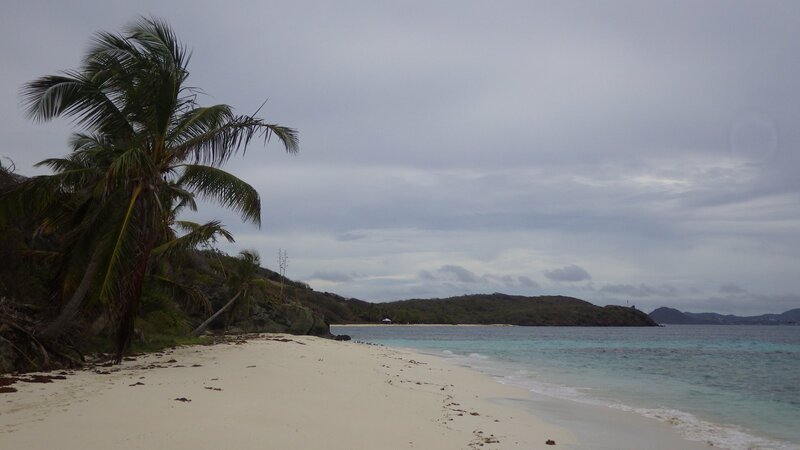 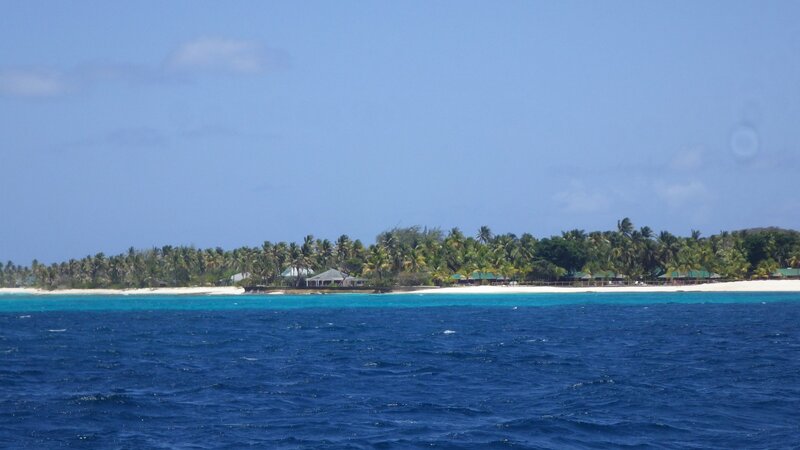 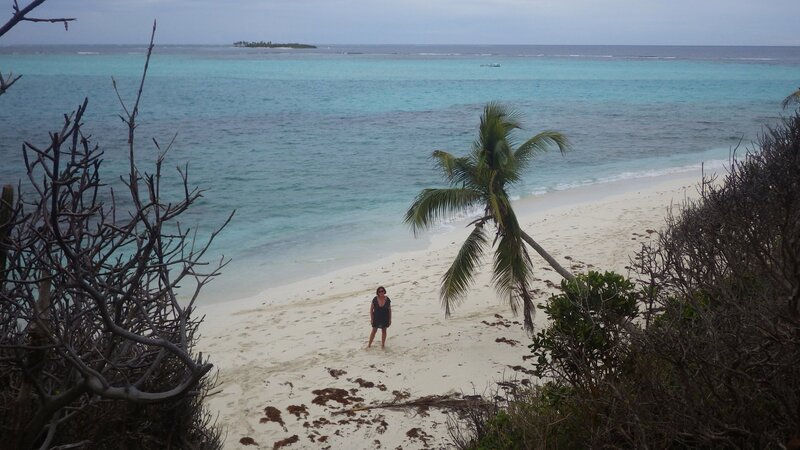 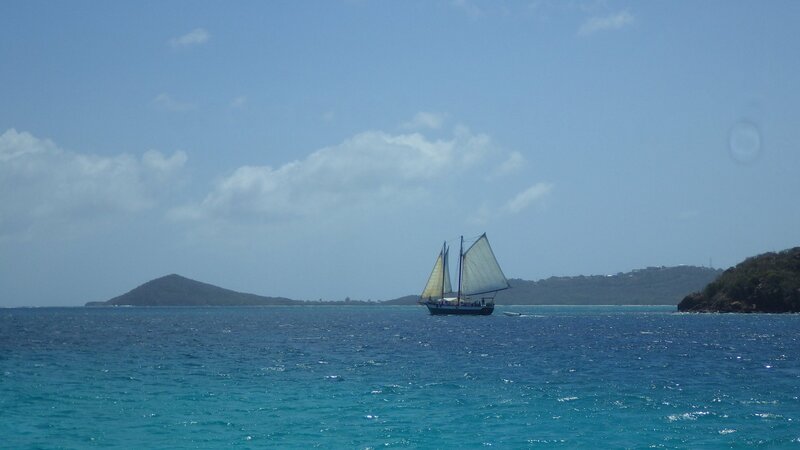 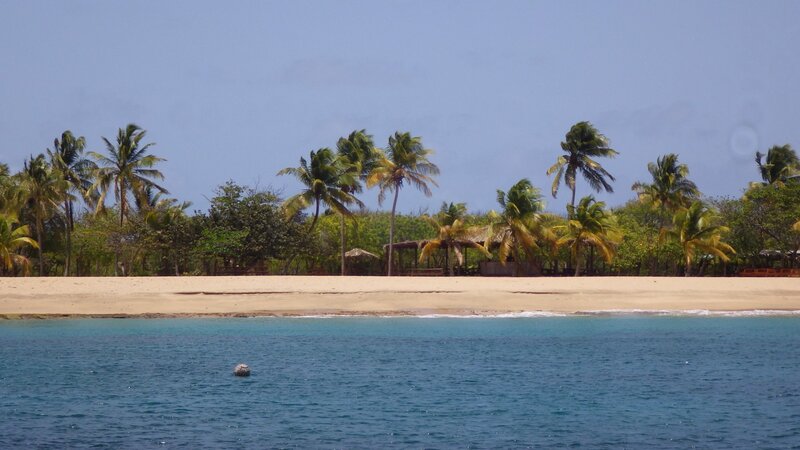 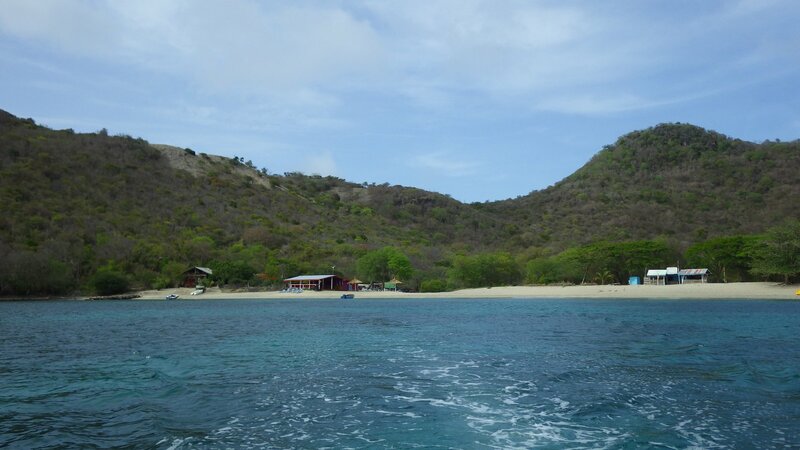 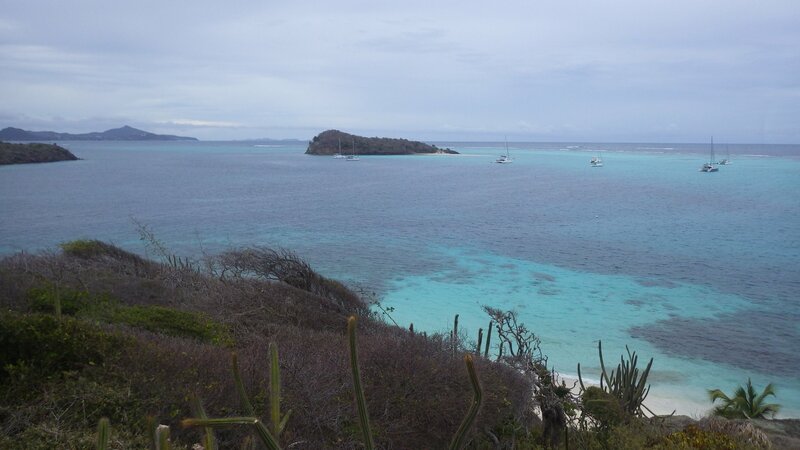 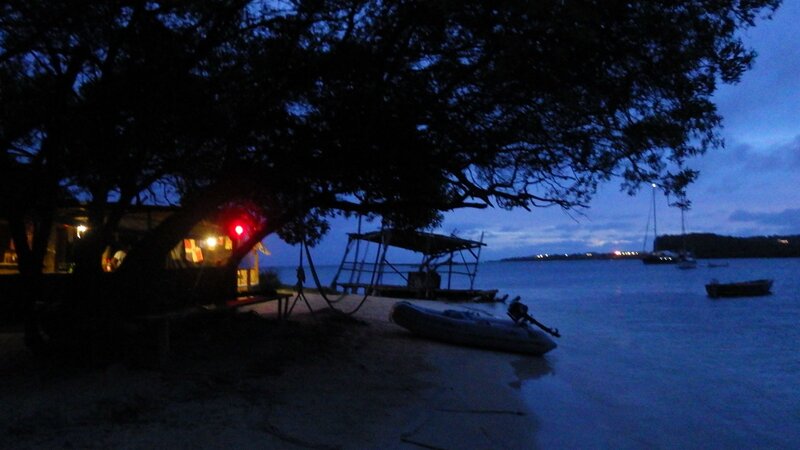 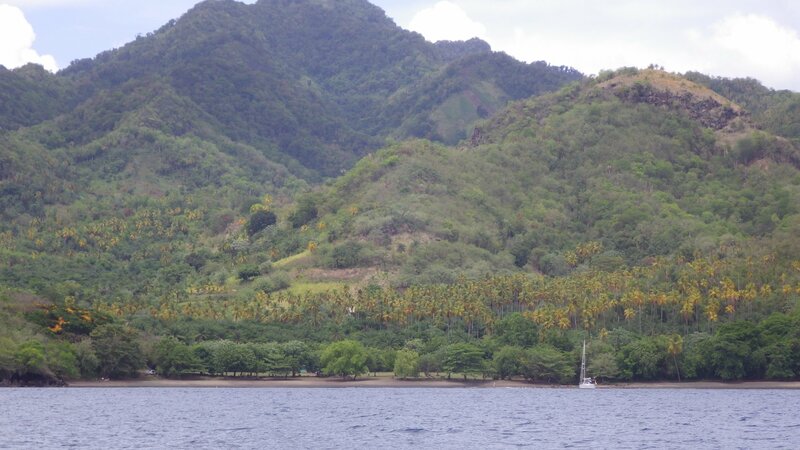 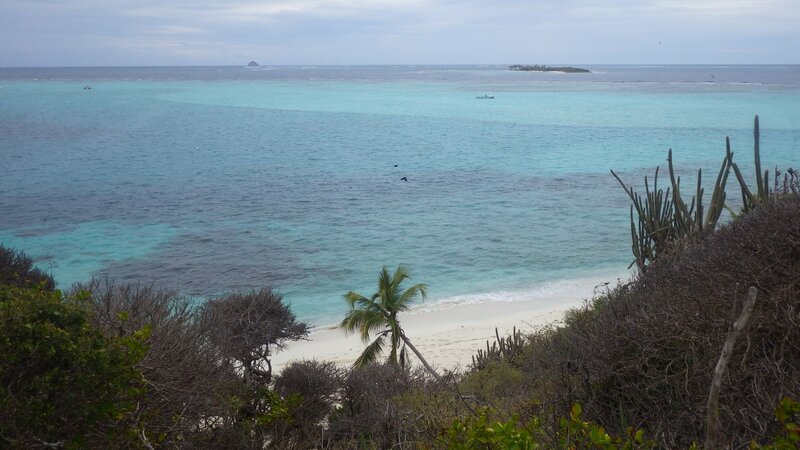 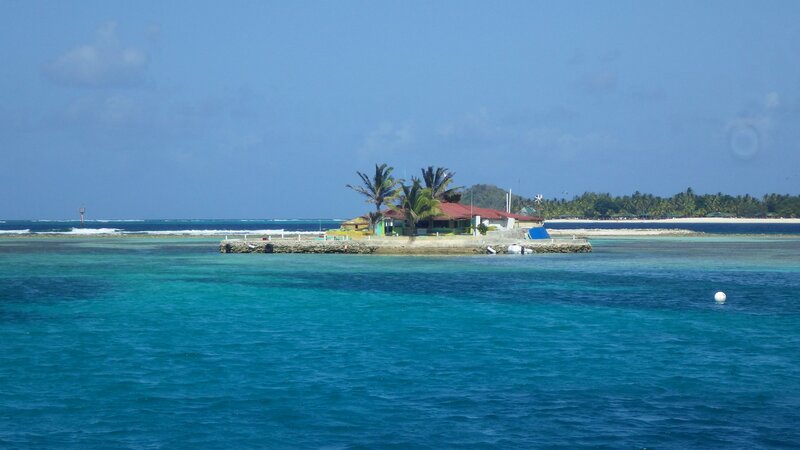 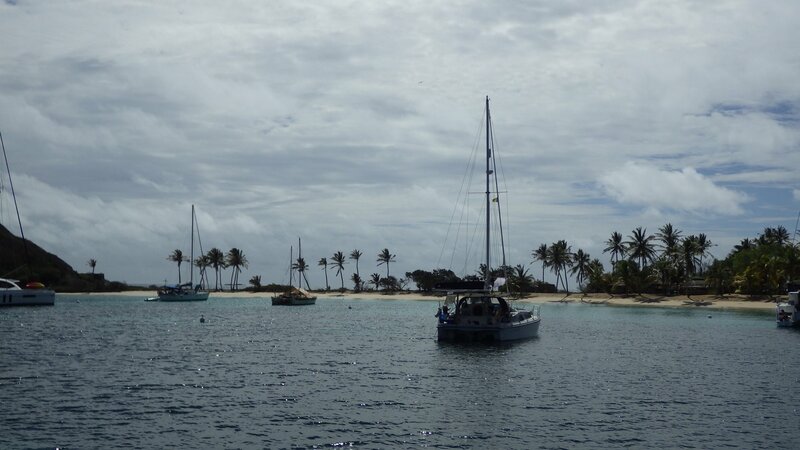 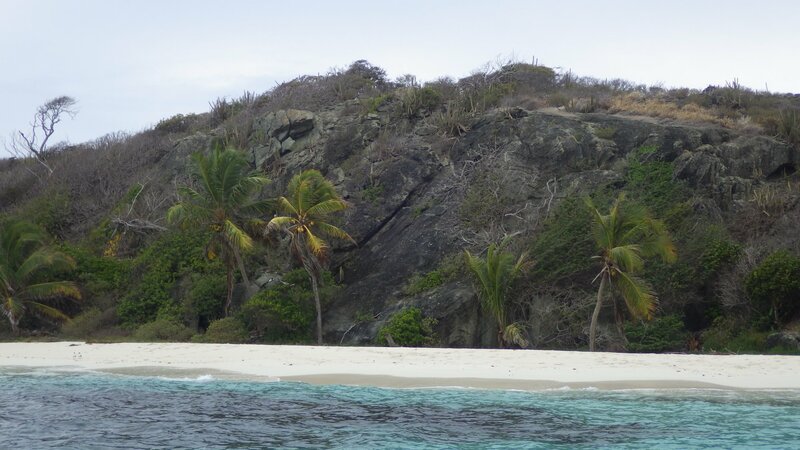 We sailed to the Chatham Bay on the west side of Union Island. 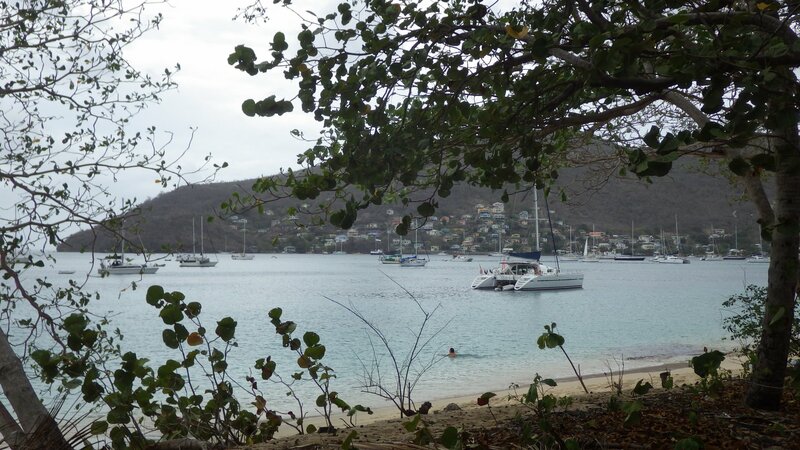 The bay is large but gusty, with rocky coral shore where we had good swims. 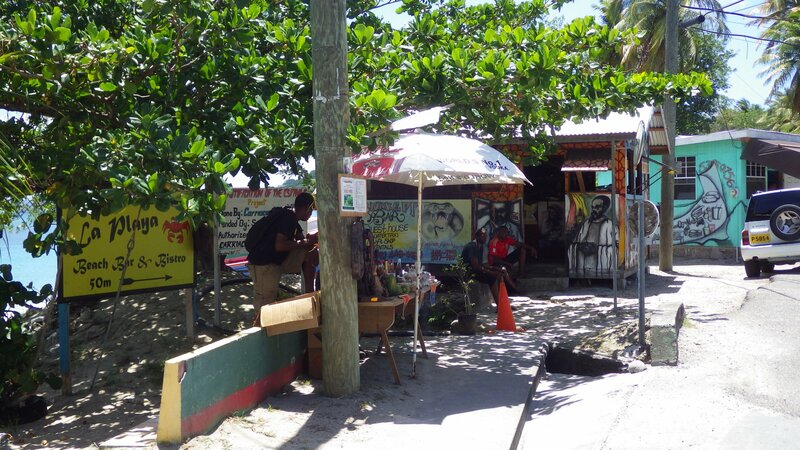 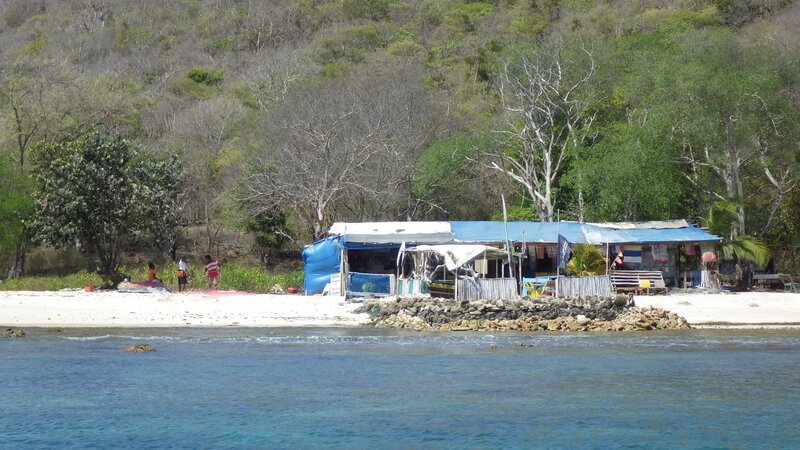 On the shore, there are five small and rough beach bars/restaurants competing for the yachties' dollars. 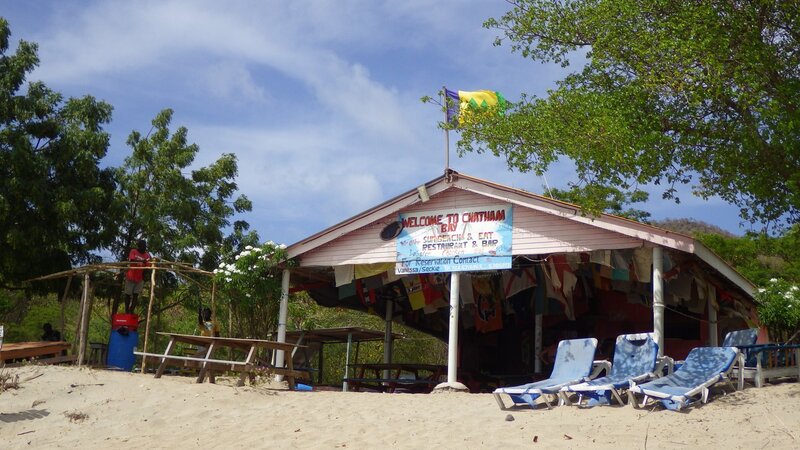 As in many places in the Caribbean, there are boat boys coming to offer you something, including beach restaurant meals. 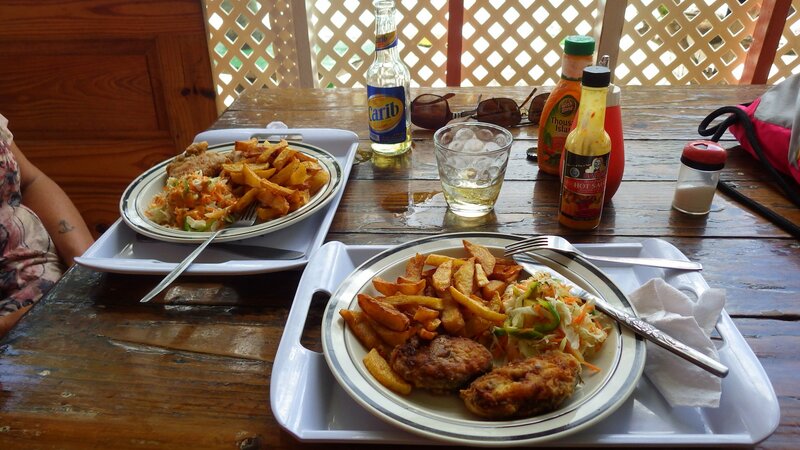 This time we agreed to visit one of such restaurants, at least to see what it's all about. 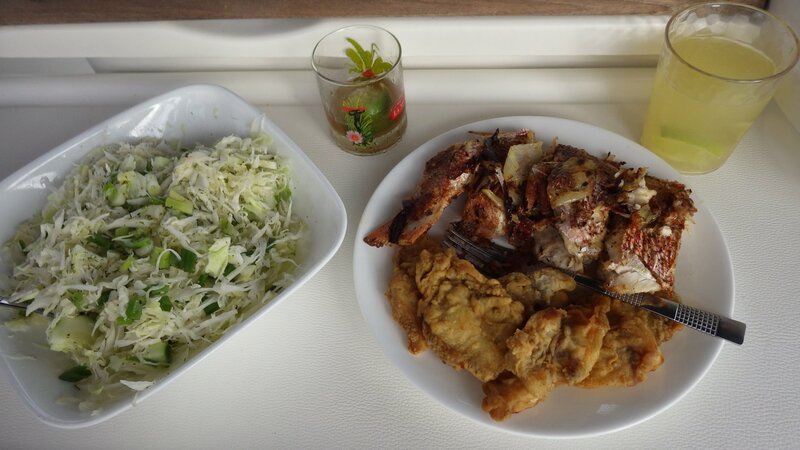 The meal was good, but not cheap. 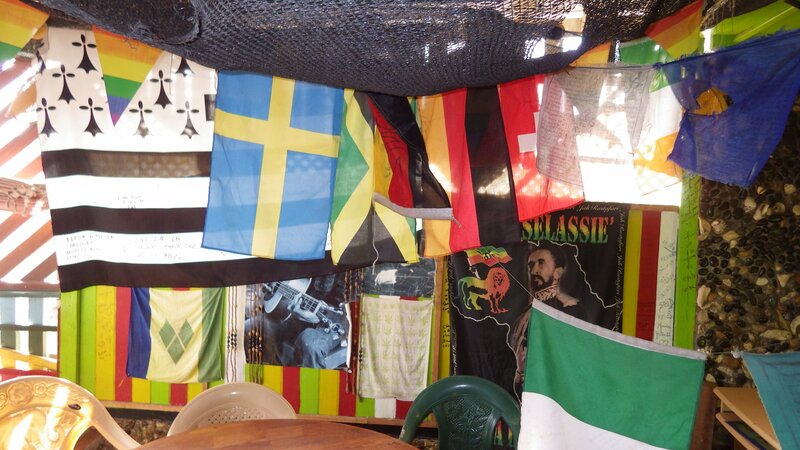 We also had an interesting talk with hosts, sharing our stories and ideas. 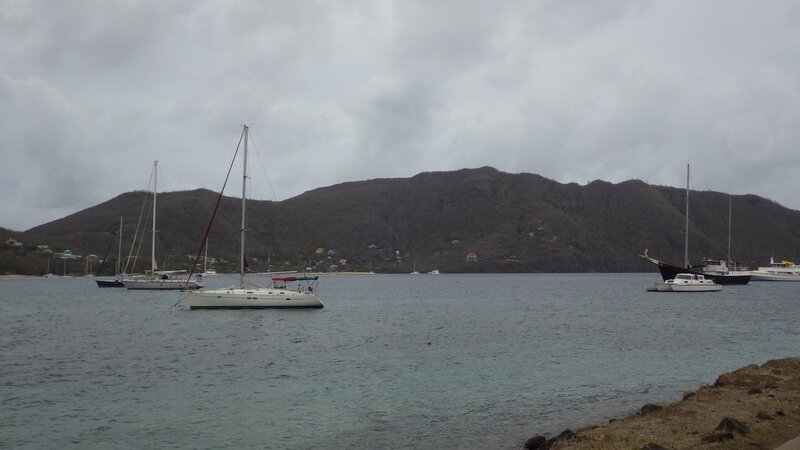 We needed to check-out at customs in Clifton, but the anchorage there is quite windy, so we stayed in a more protected area nearby, behind the Frigate Island. 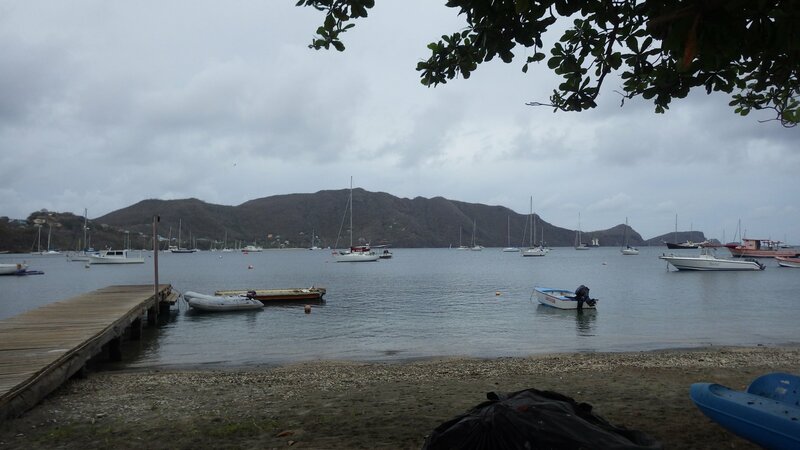 It was a quiet stay, watching mountains, windsurfers and fishermen. 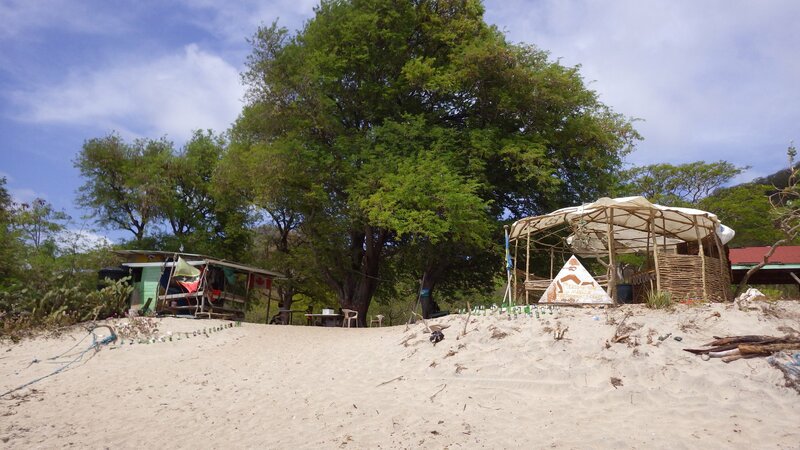 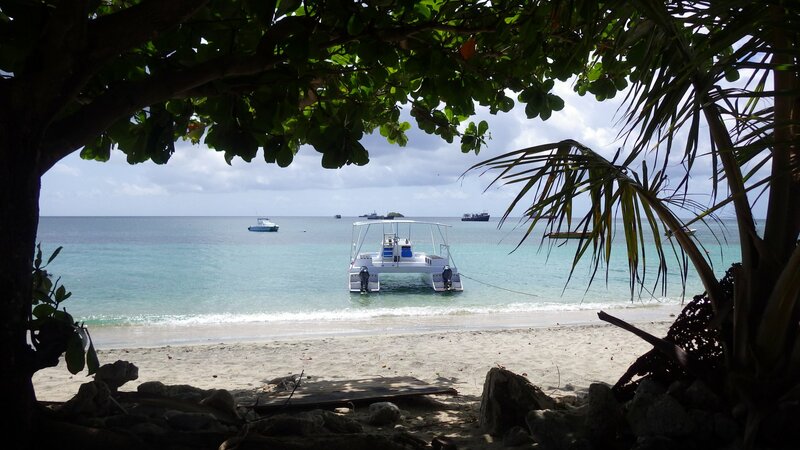 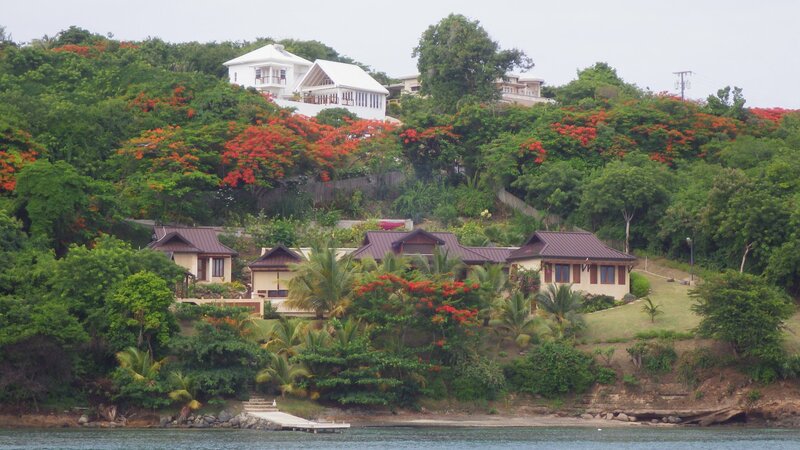 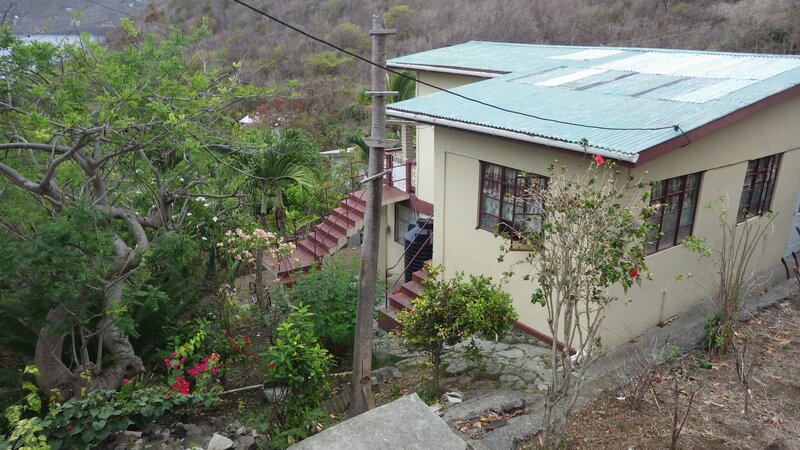 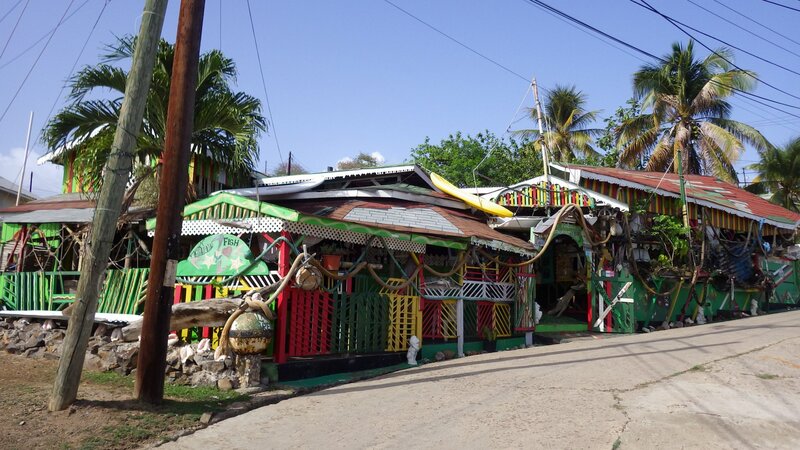 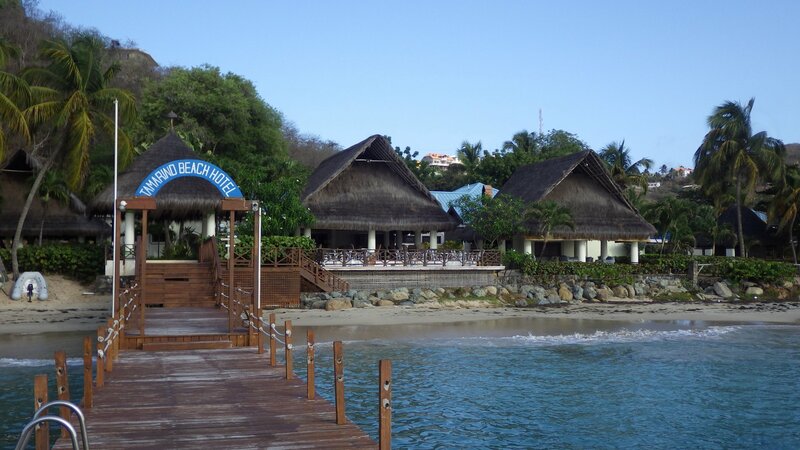 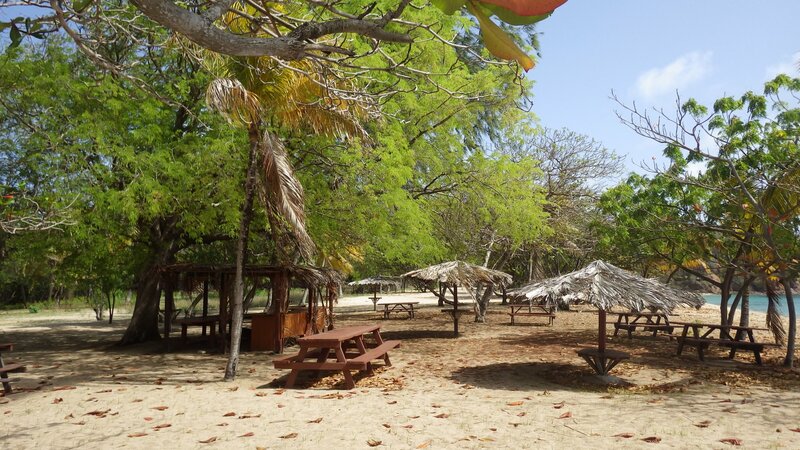 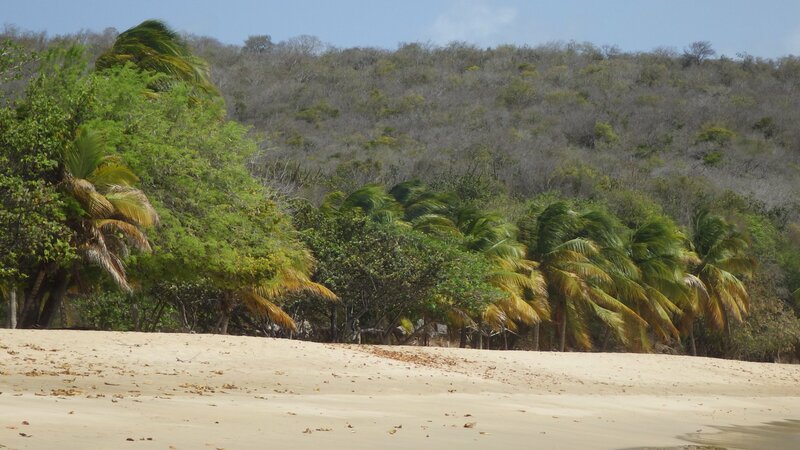 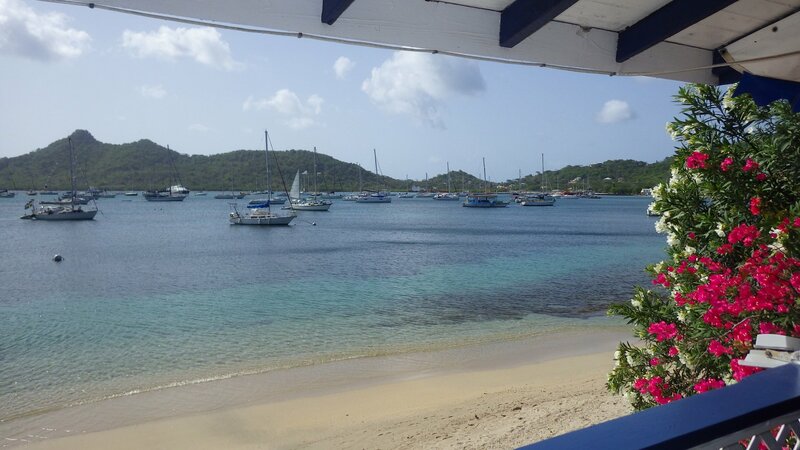 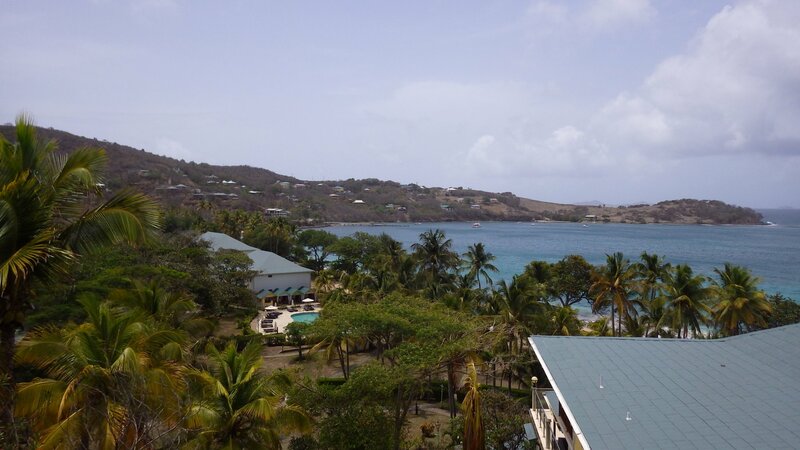 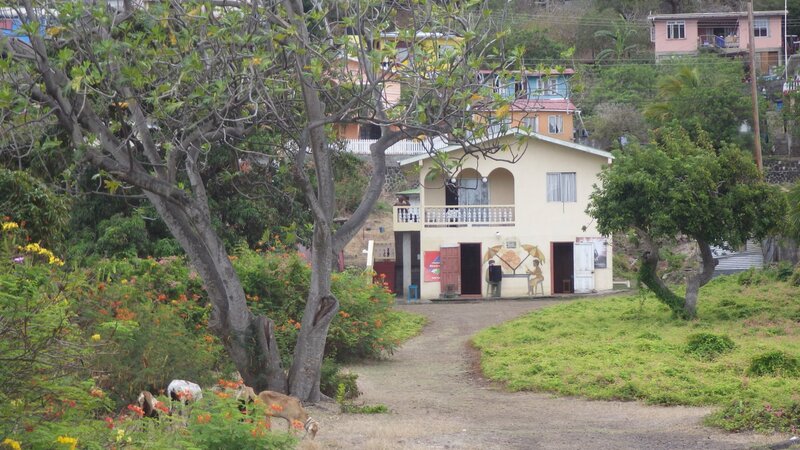 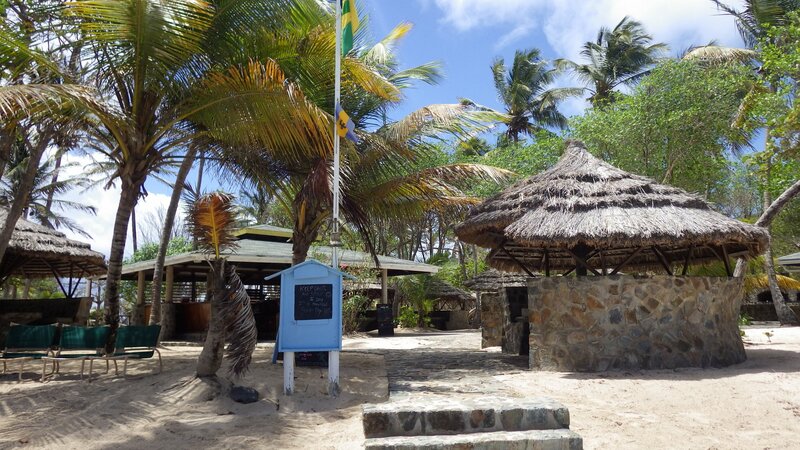 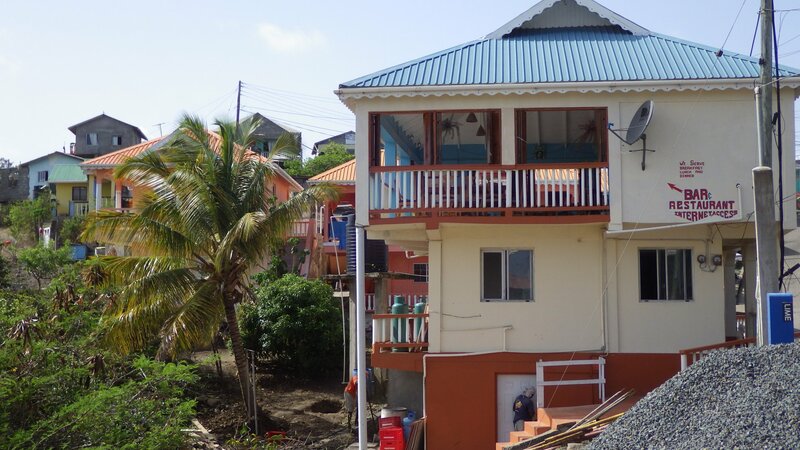 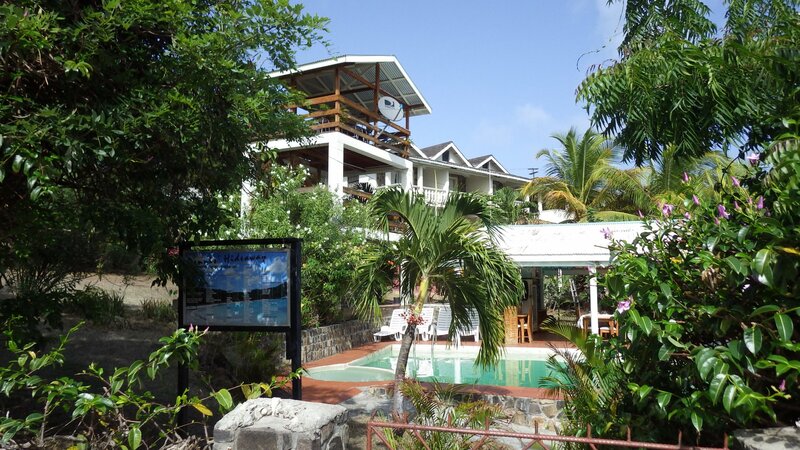 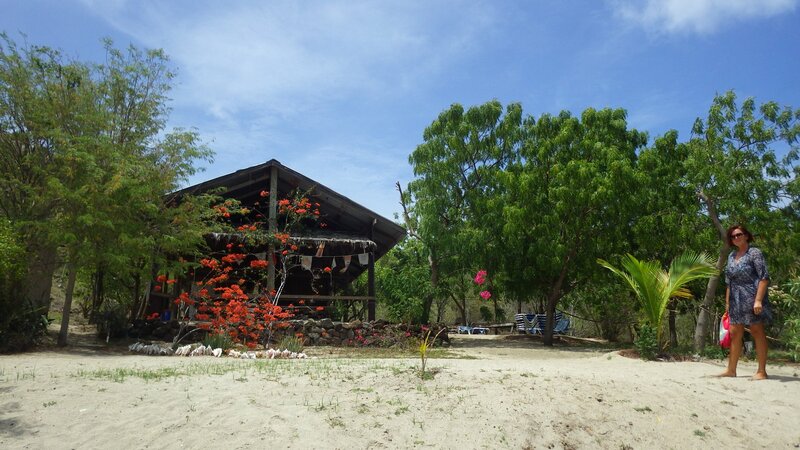 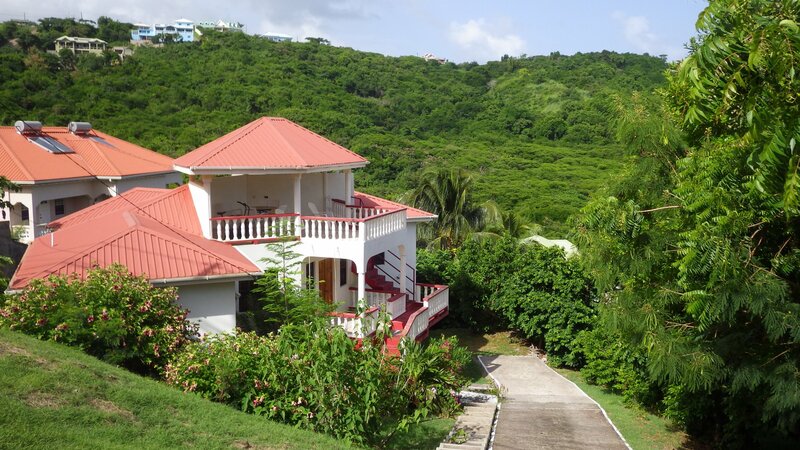 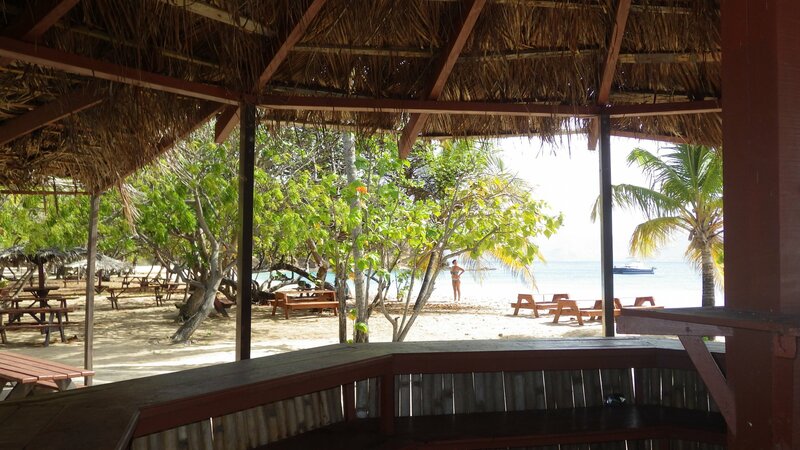 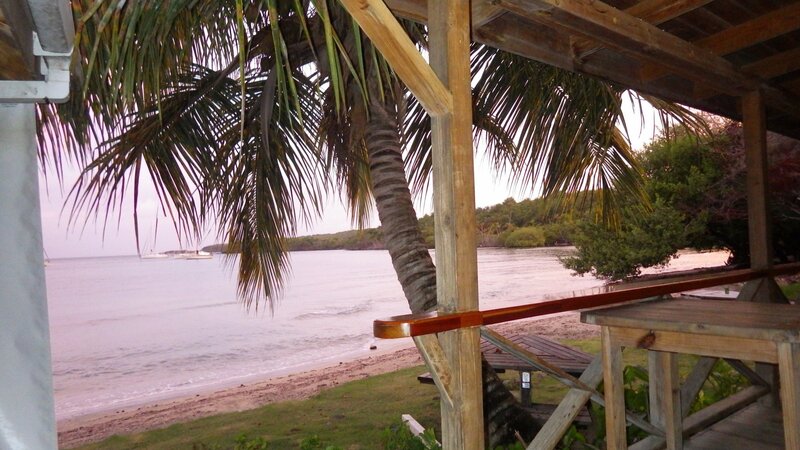 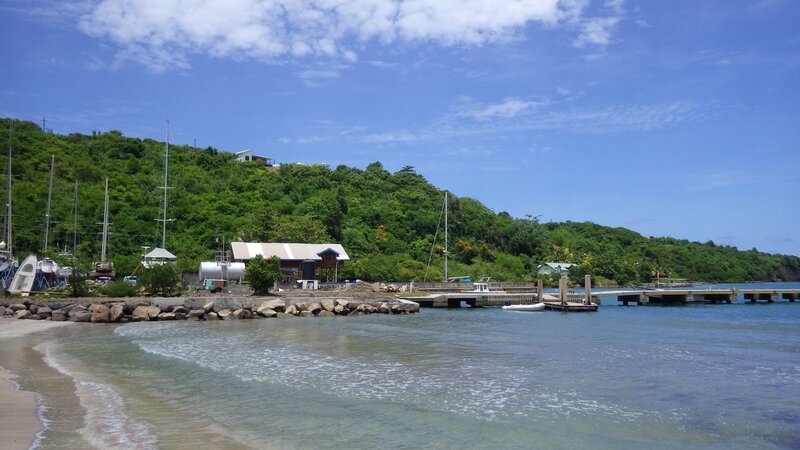 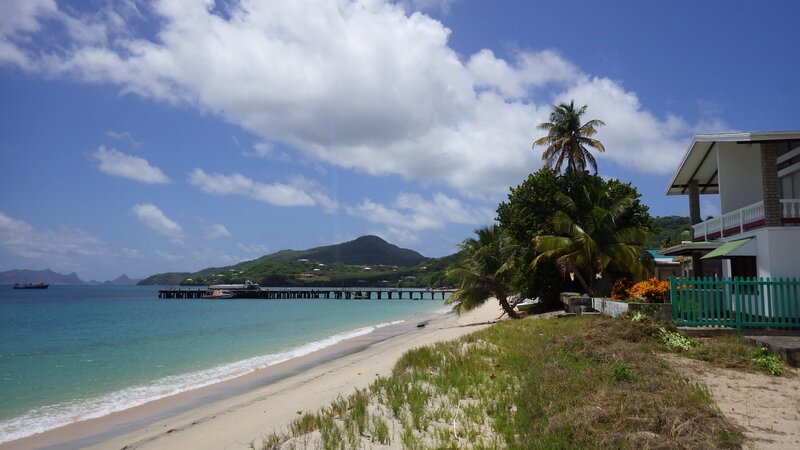 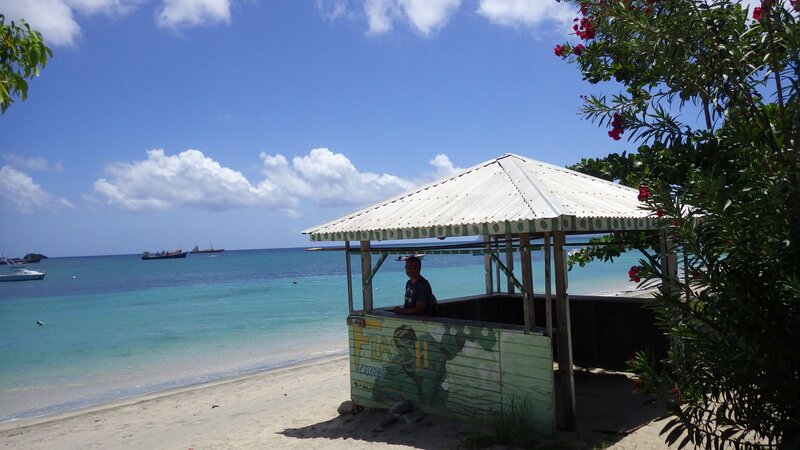 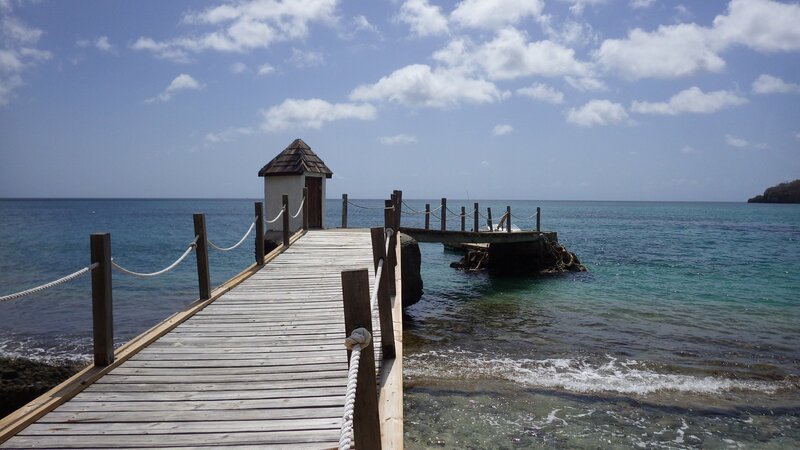 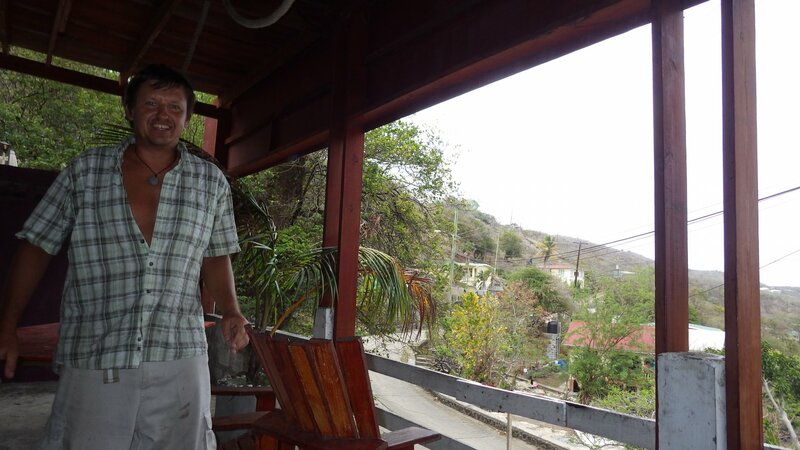 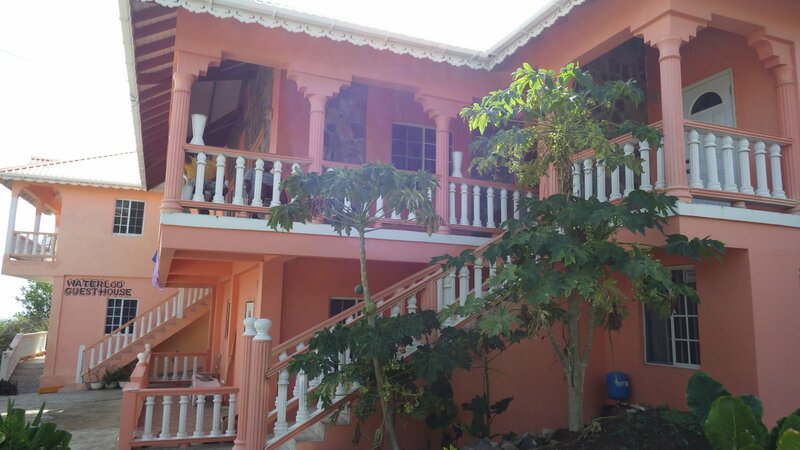 We checked in with Grenada customs at Tyrrel Bay, Curriacou. 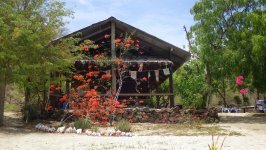 Stayed here for few days. 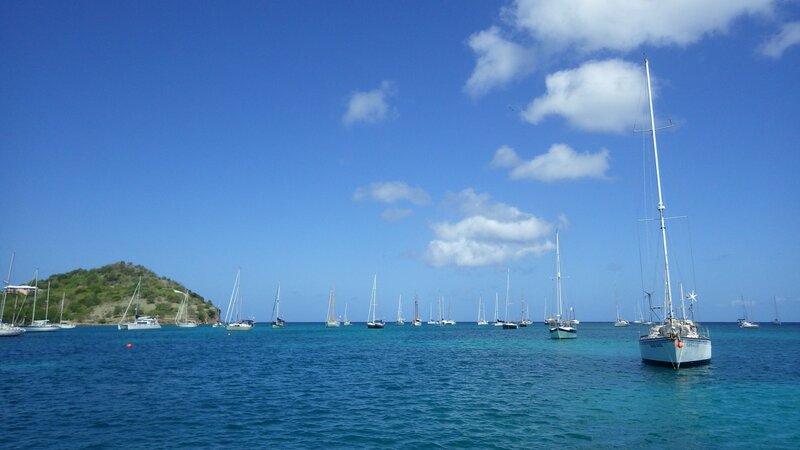 The bay is big, well protected and full of boats. 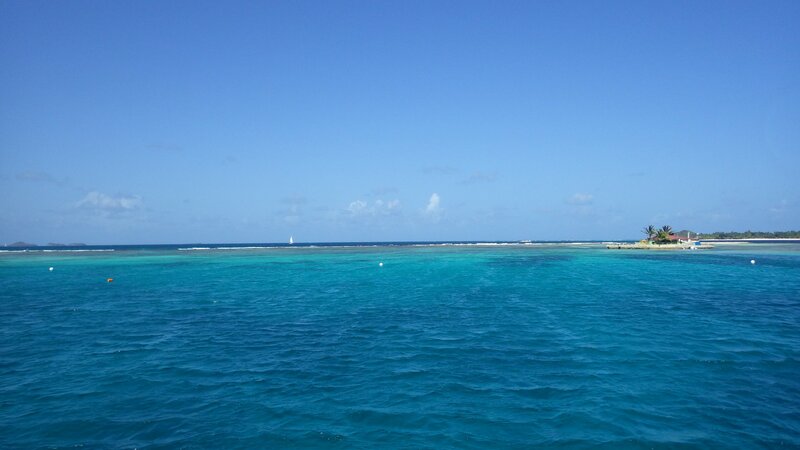 Many cruisers stay here for a long time. 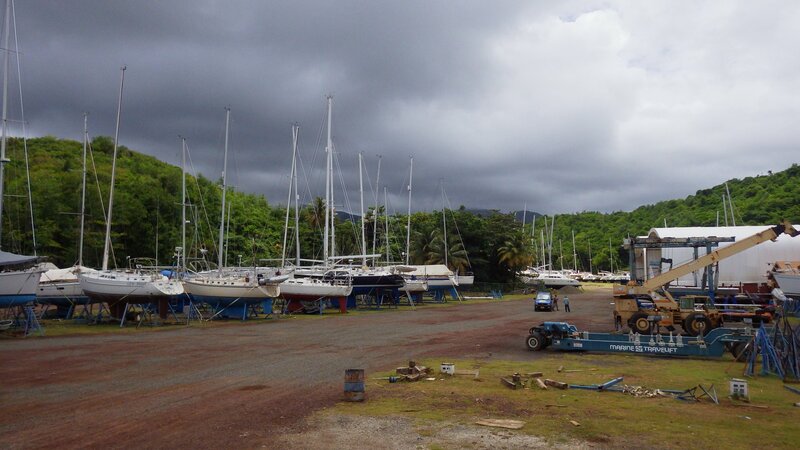 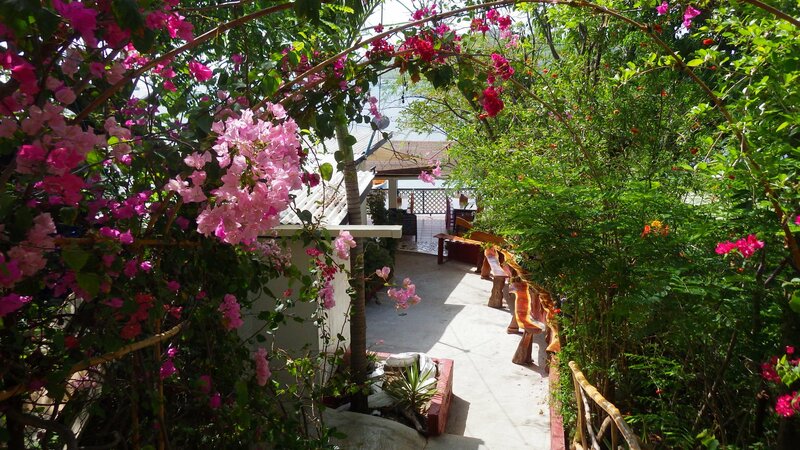 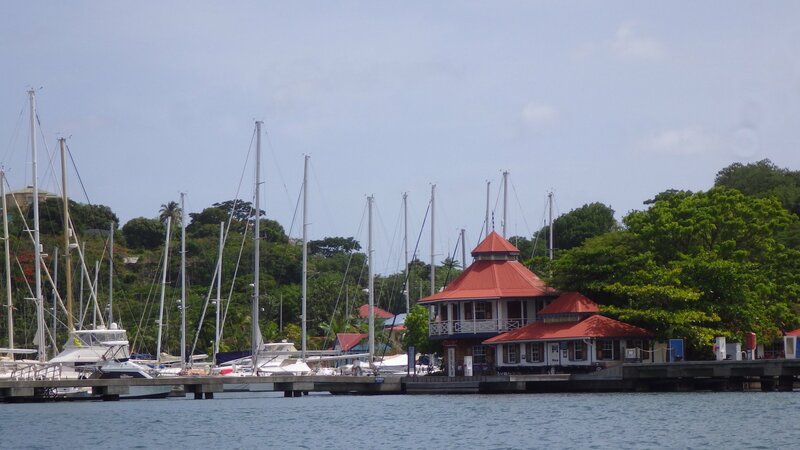 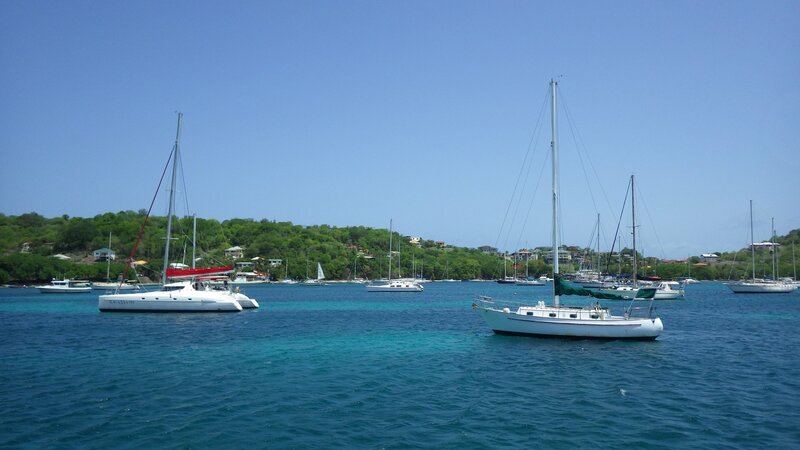 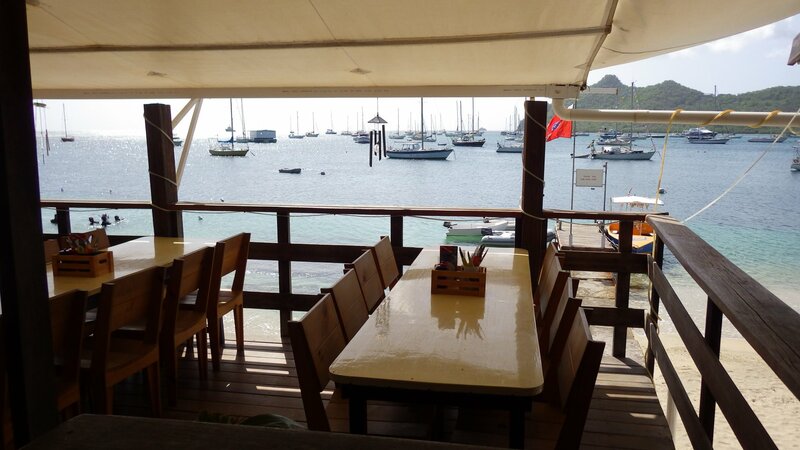 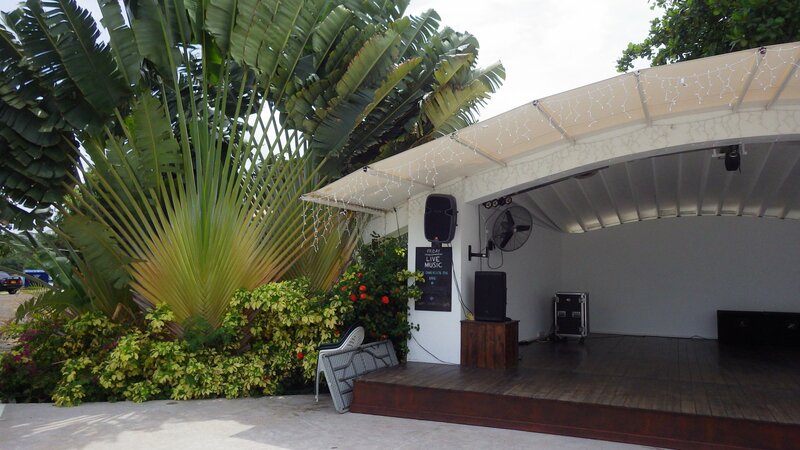 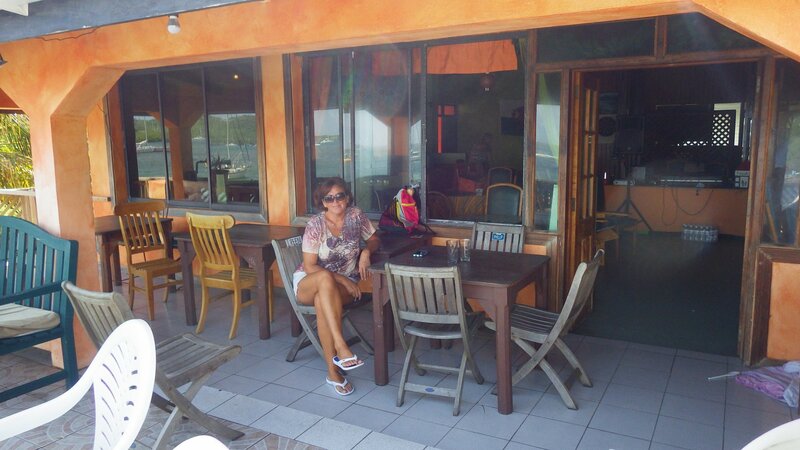 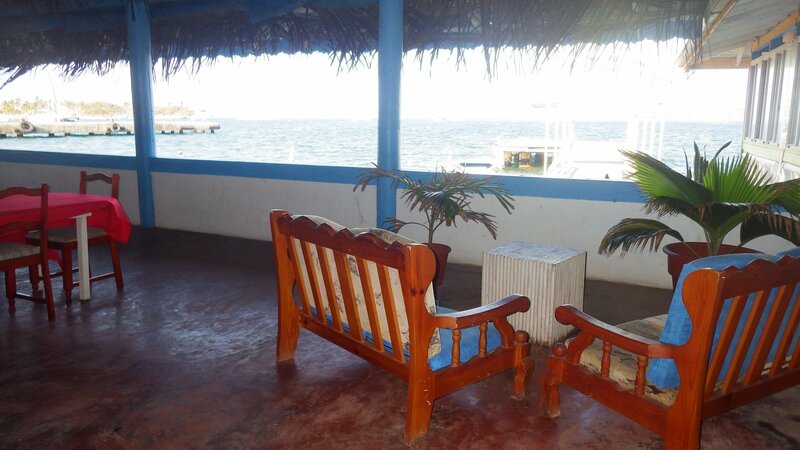 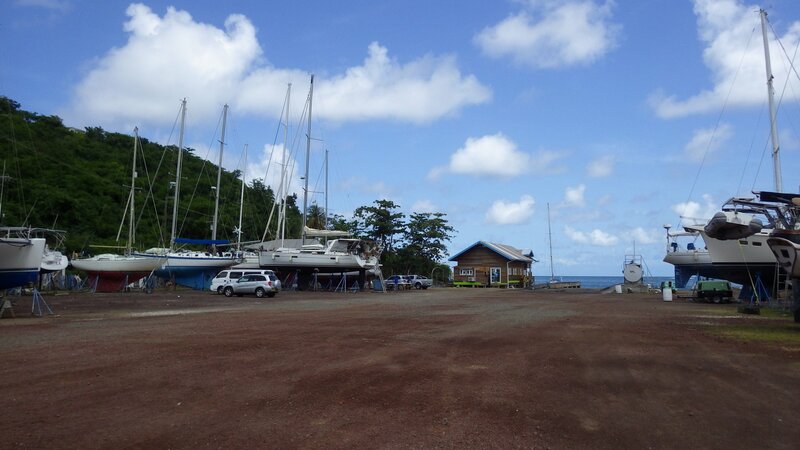 The place is welcoming and pleasant, with marina/boatyard, several stores and restaurants. 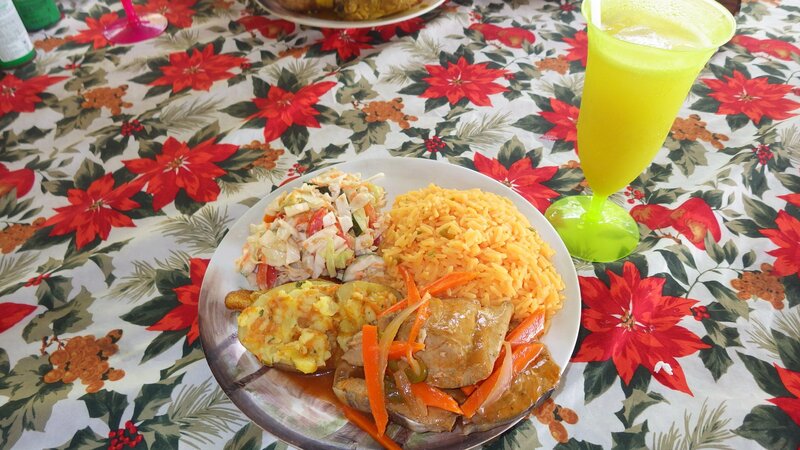 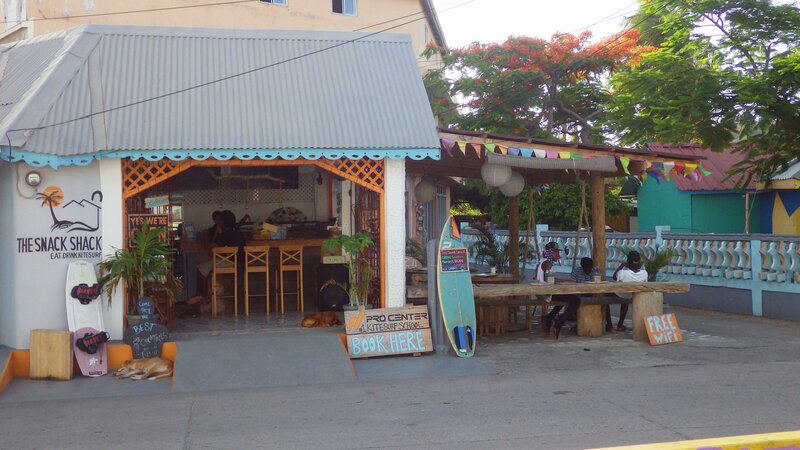 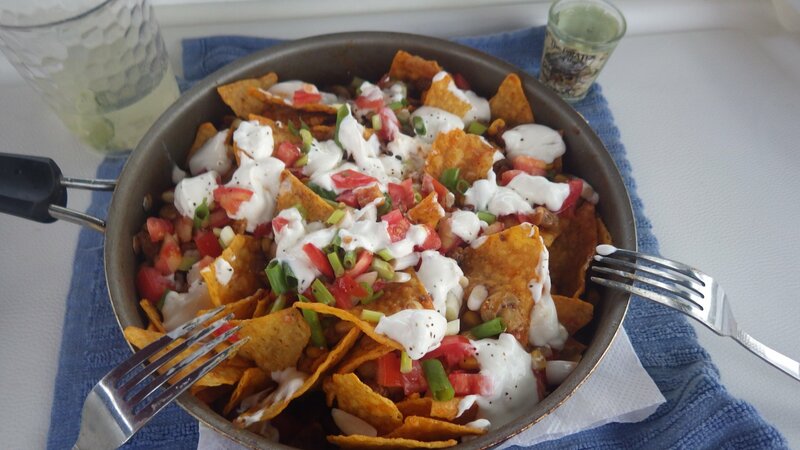 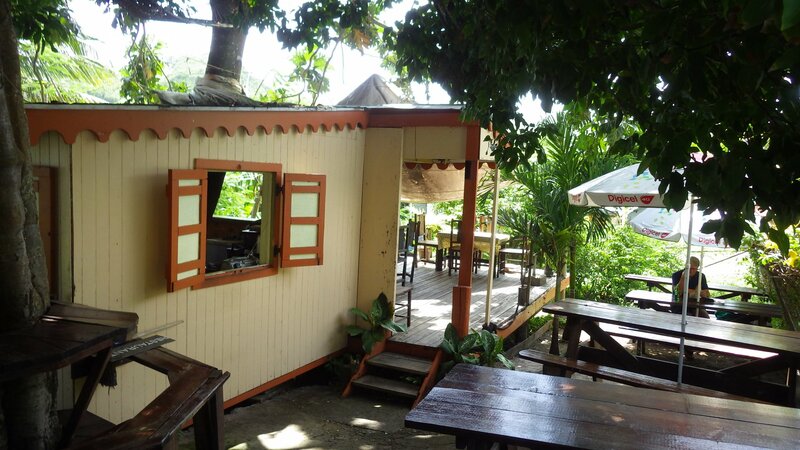 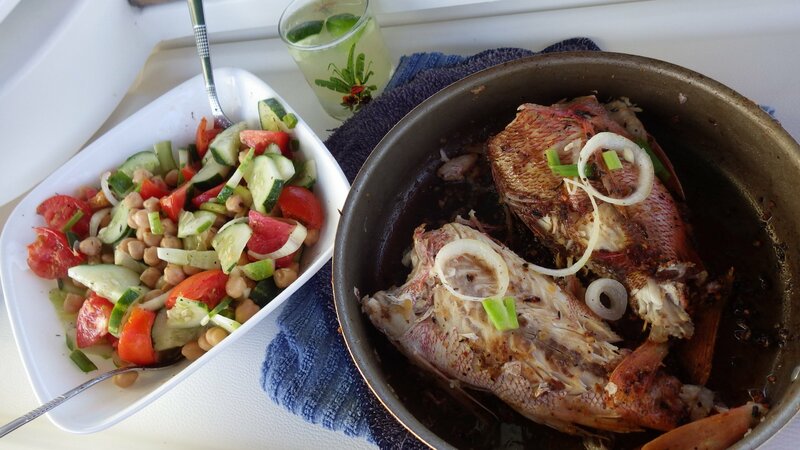 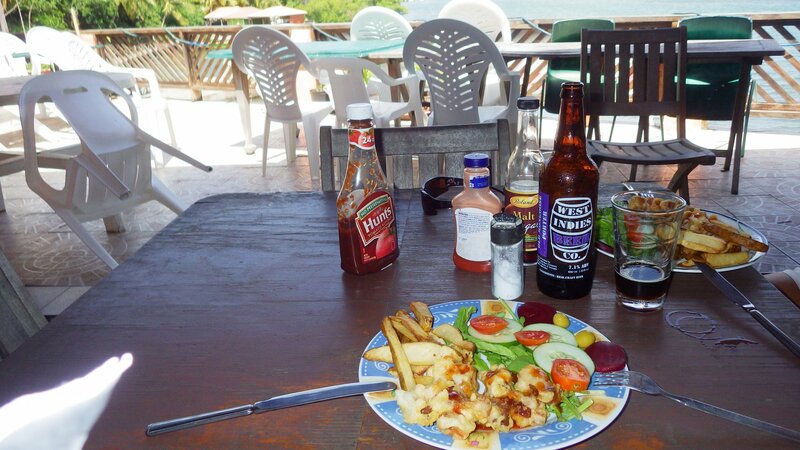 We have tried a Lion Fish here for the first time � very delicious! 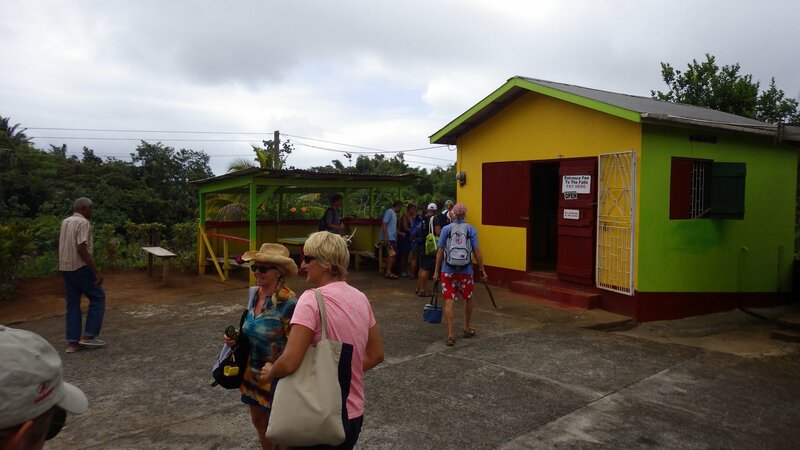 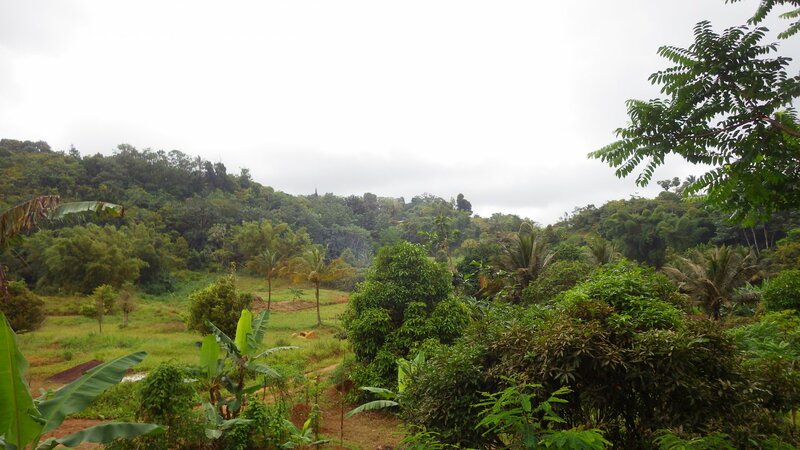 We decided to do a day trip and took an inexpensive bus ride to the town of Hillsborough nearby. 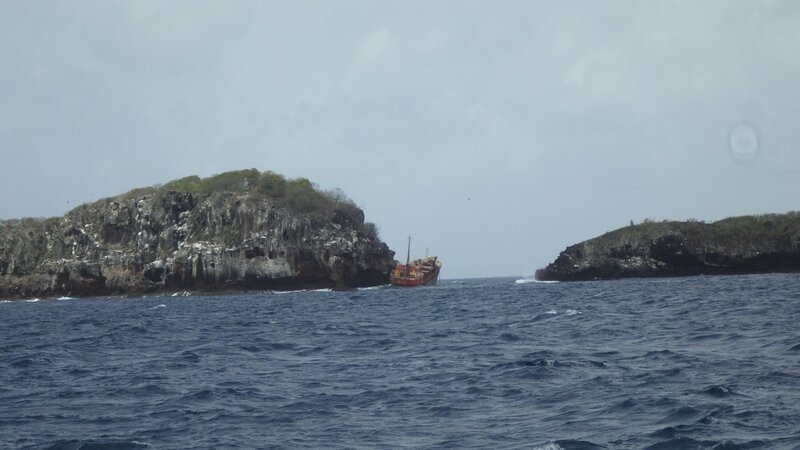 Did not see anything special, but the trip was a nice change. 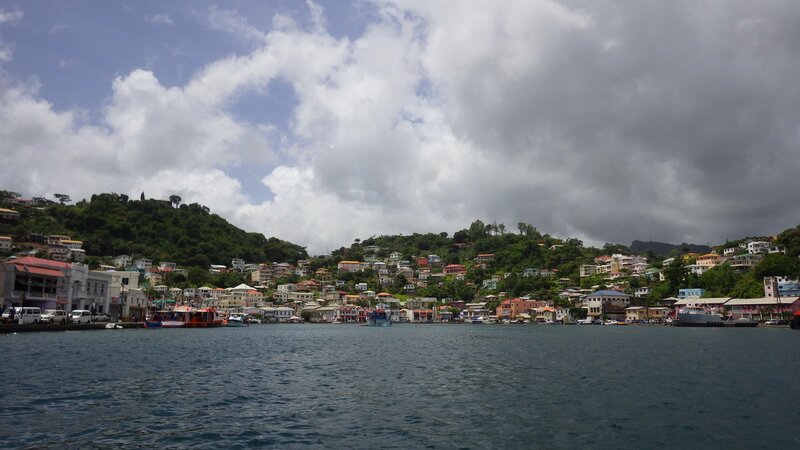 We have made it to Grenada! 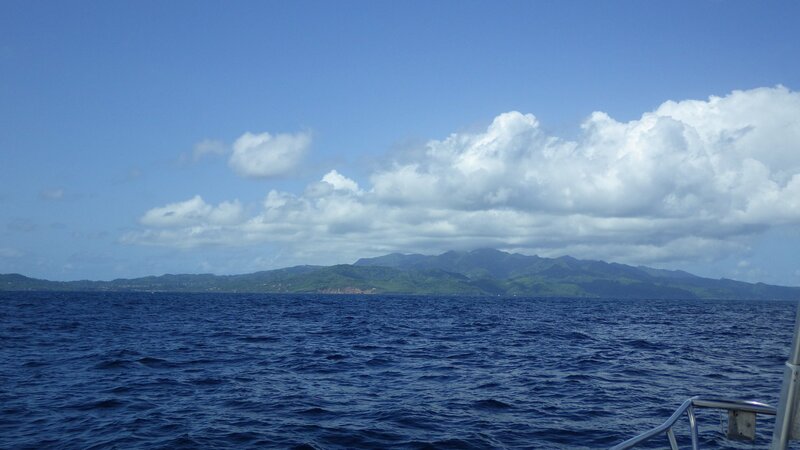 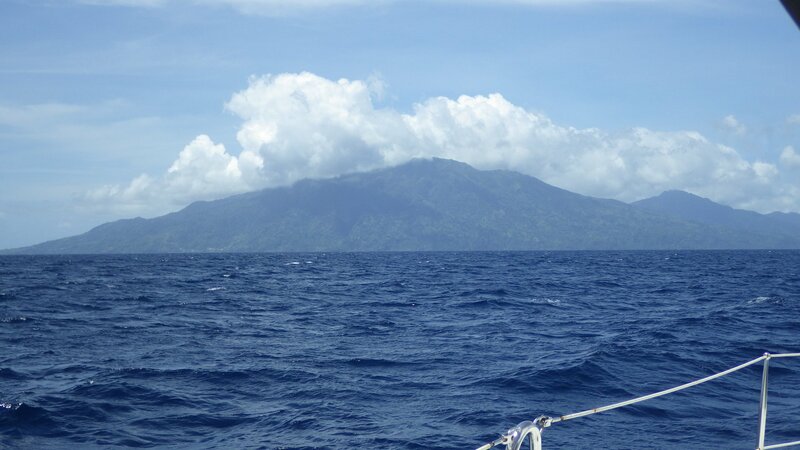 On the way, we sailed near an active underwater volcano. 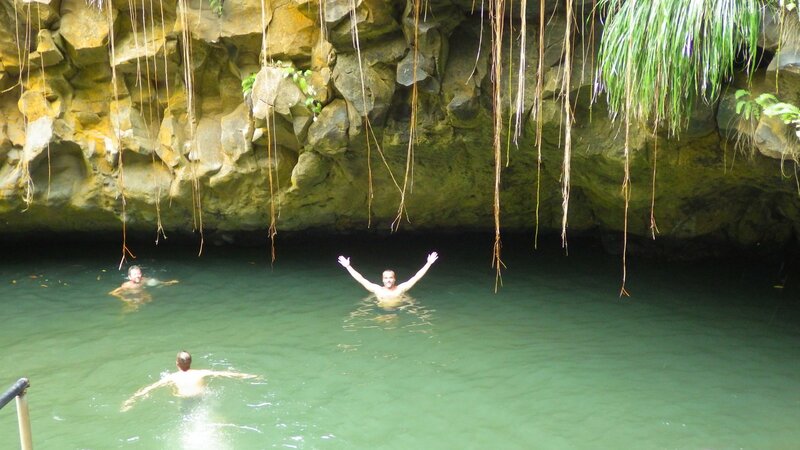 It is quite deep, so we didn't see or feel anything. 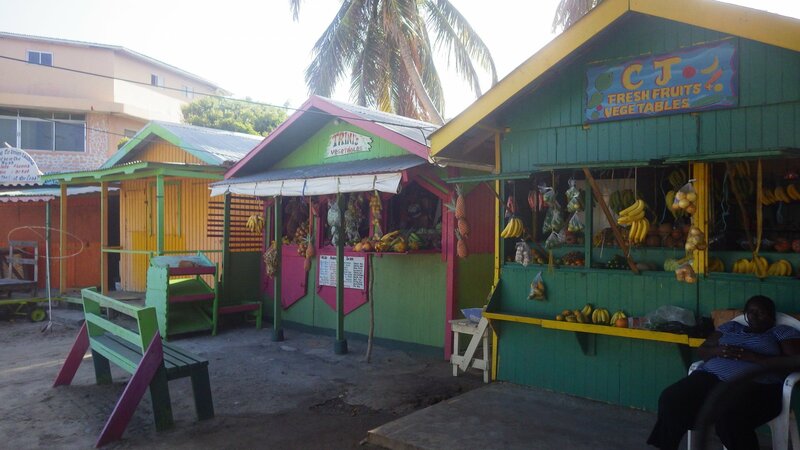 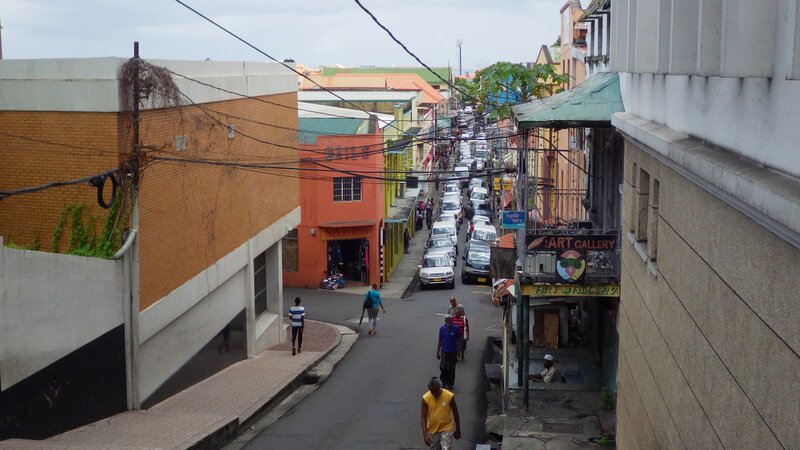 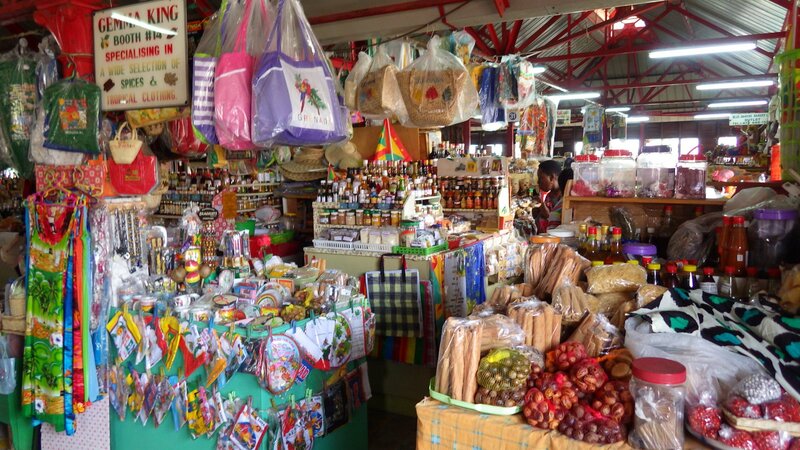 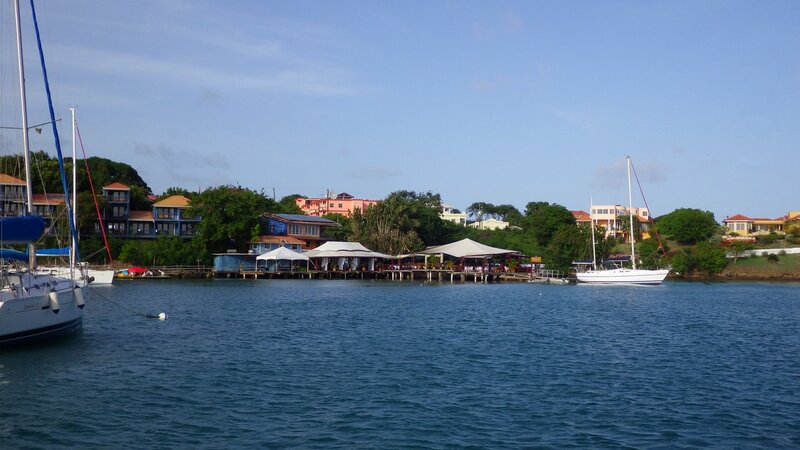 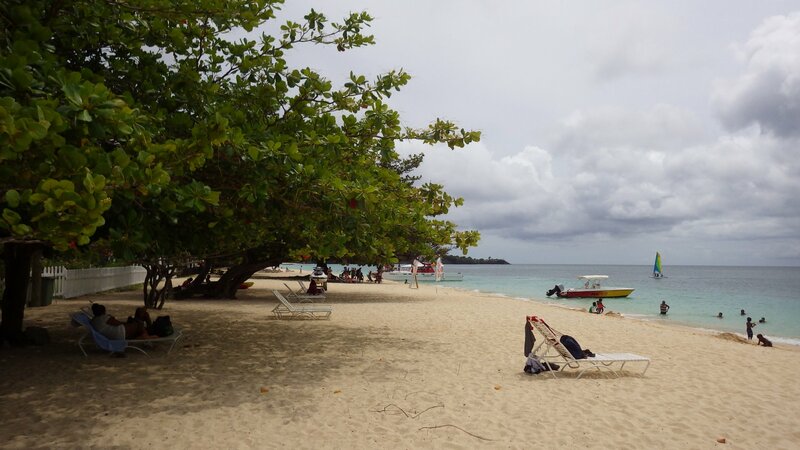 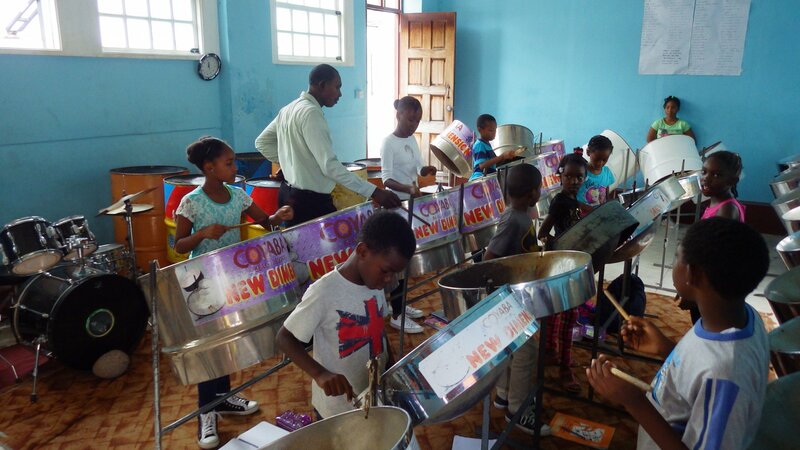 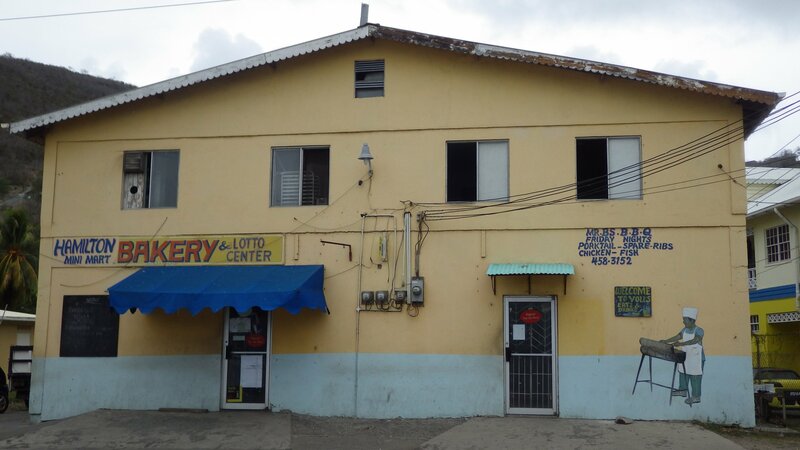 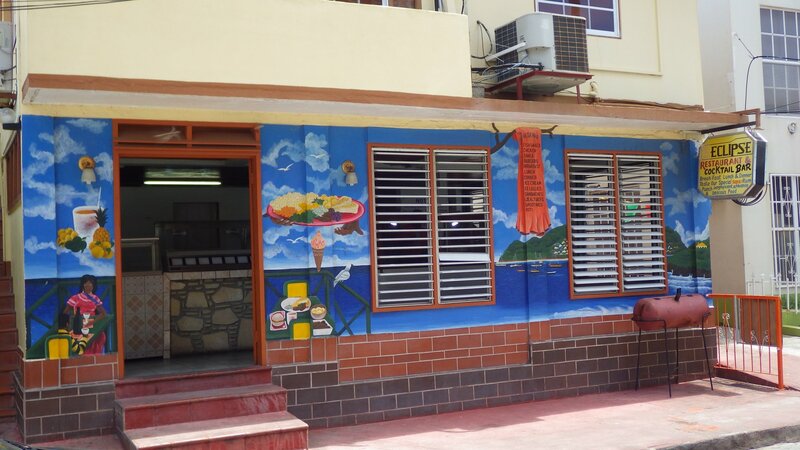 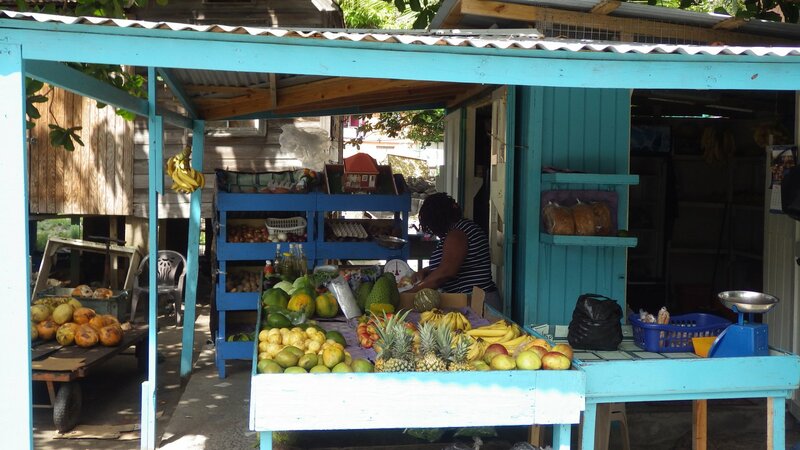 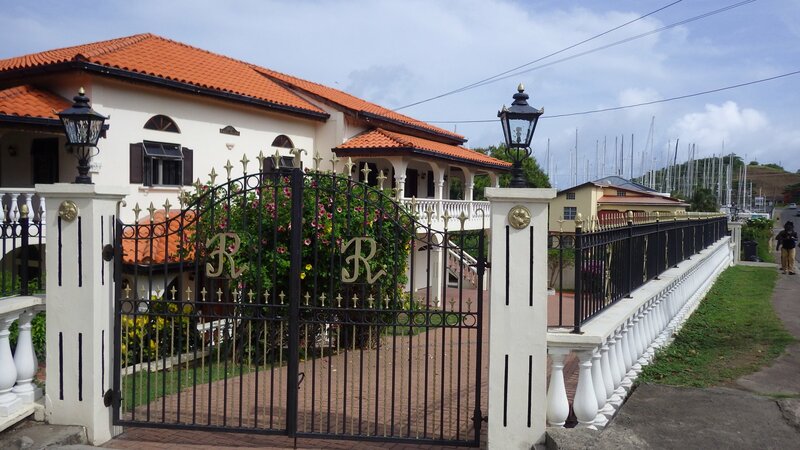 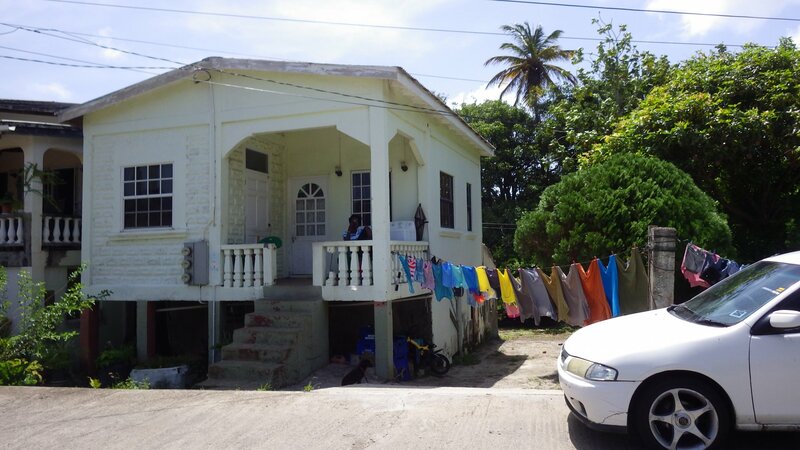 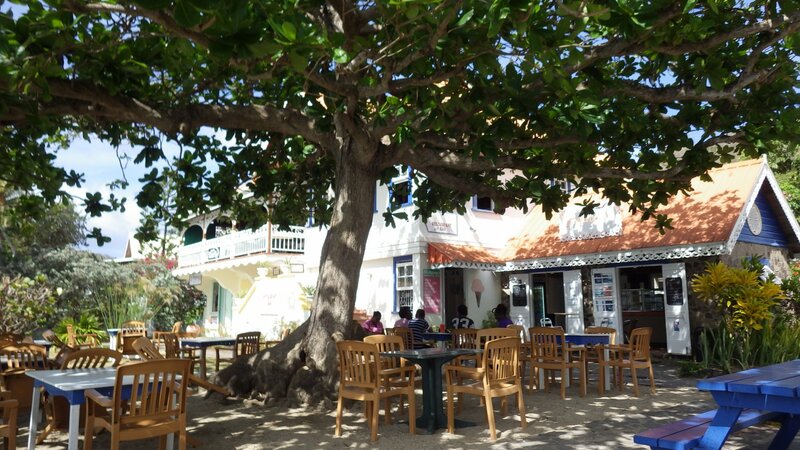 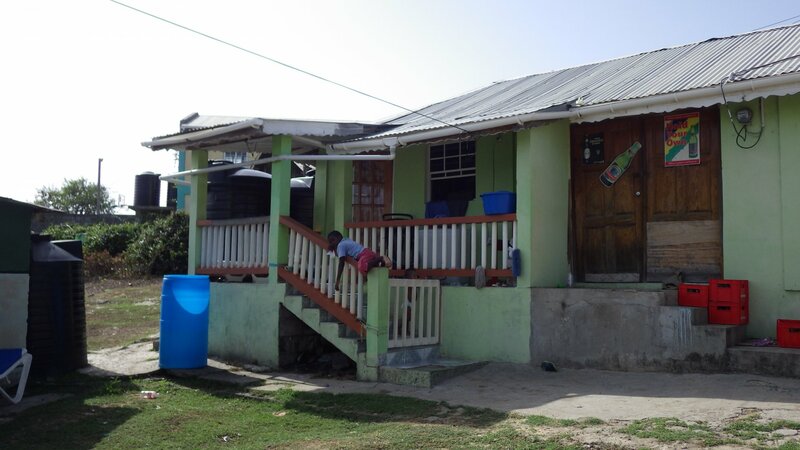 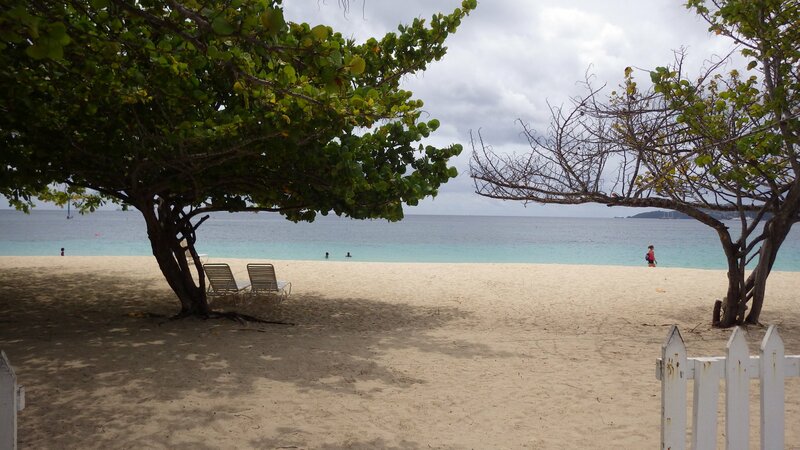 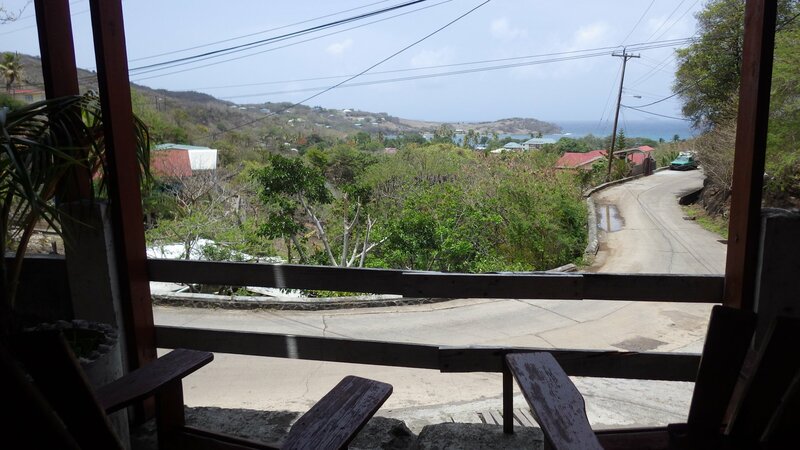 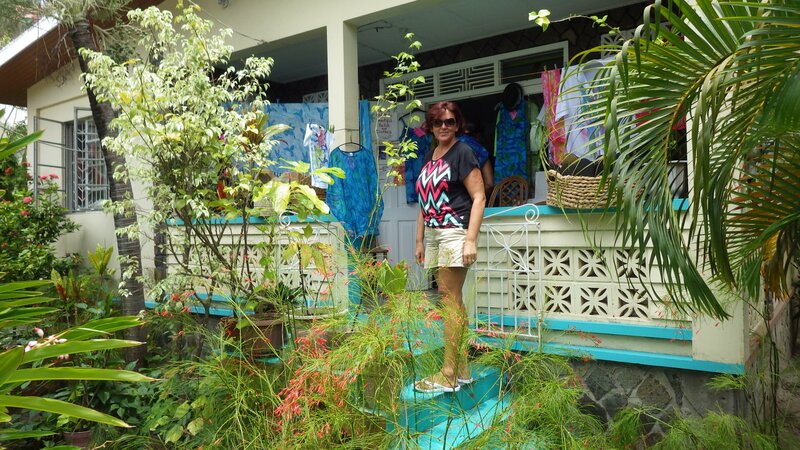 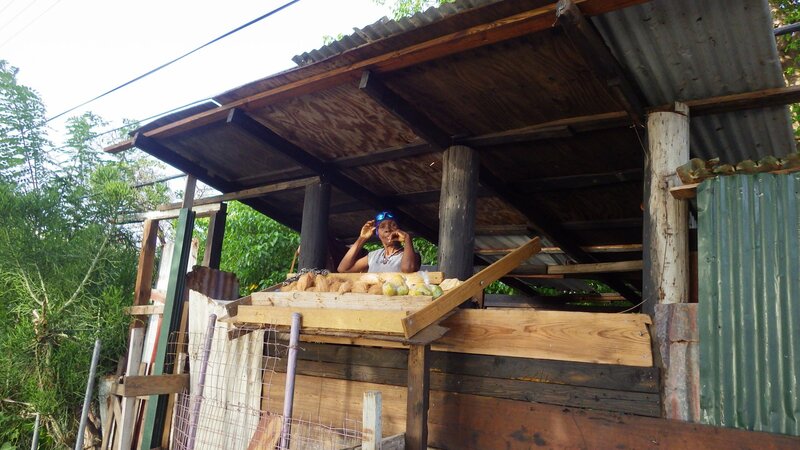 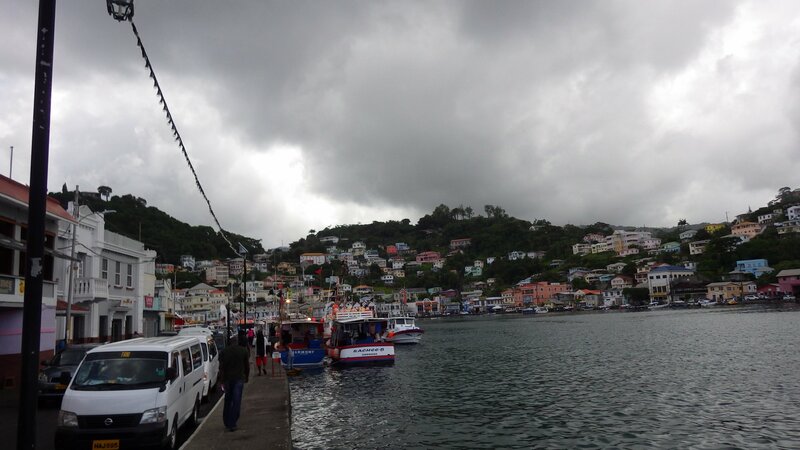 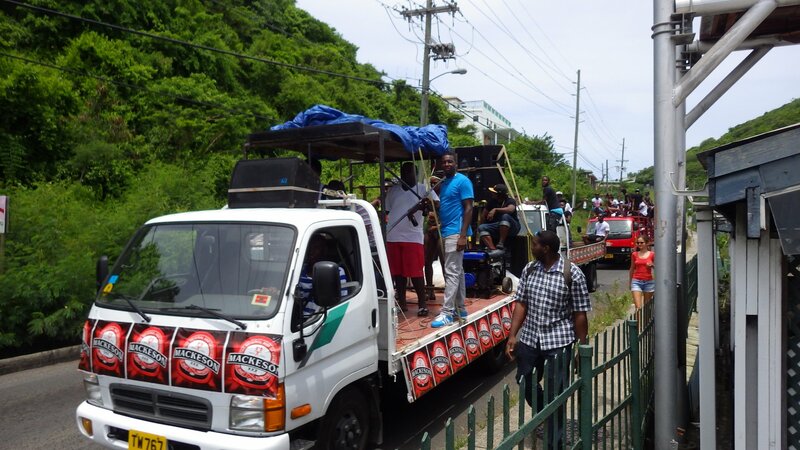 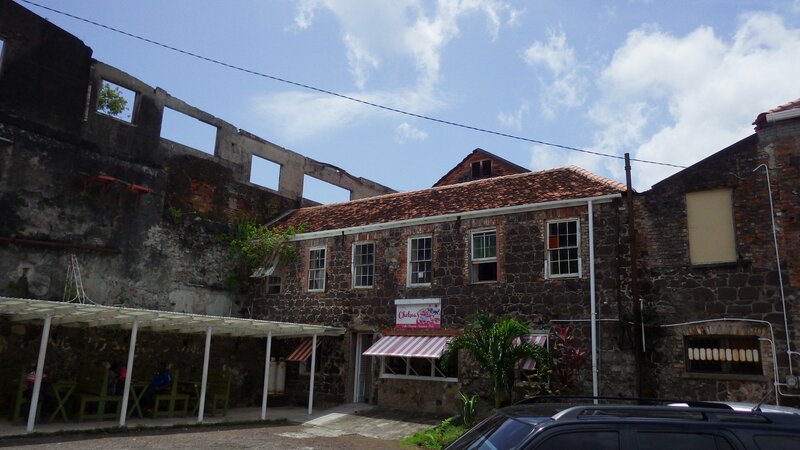 Our first stop in Grenada was at Gouyave. 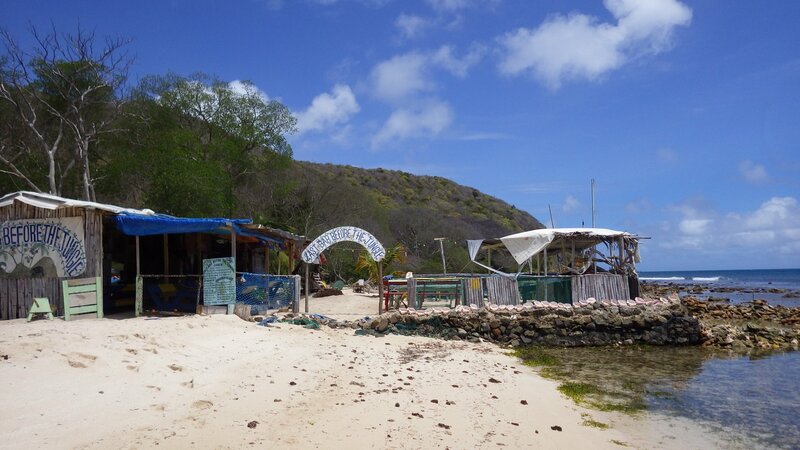 We were hoping to stay here for the weekly seafood fest. 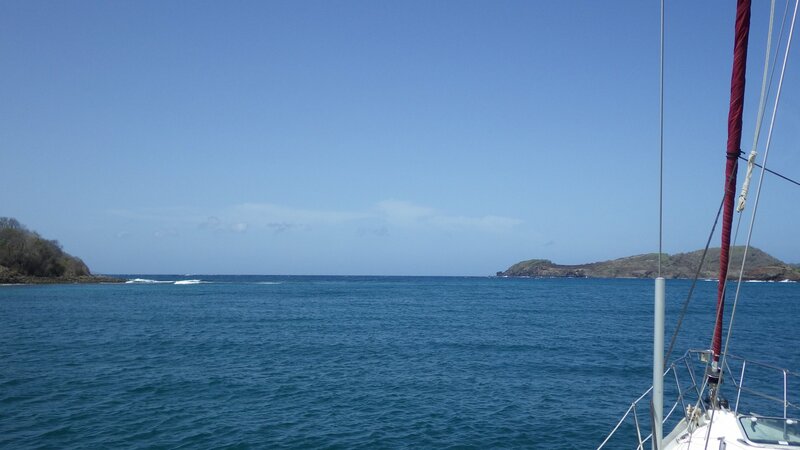 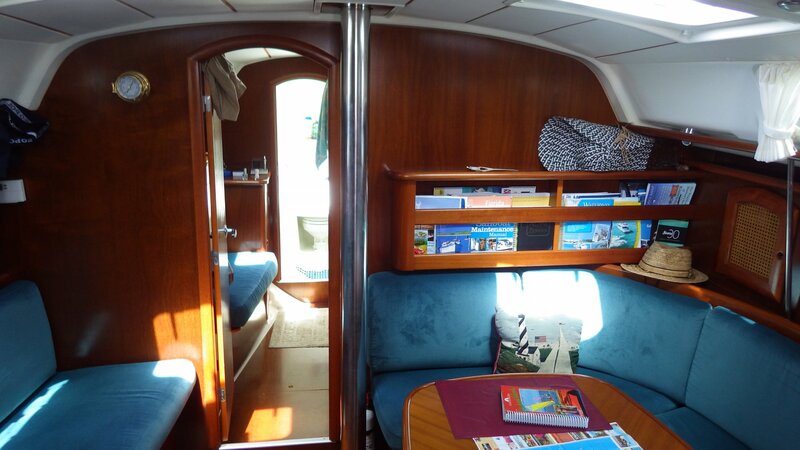 Unfortunately, the swell was rocking our yacht and we felt quite uncomfortable. 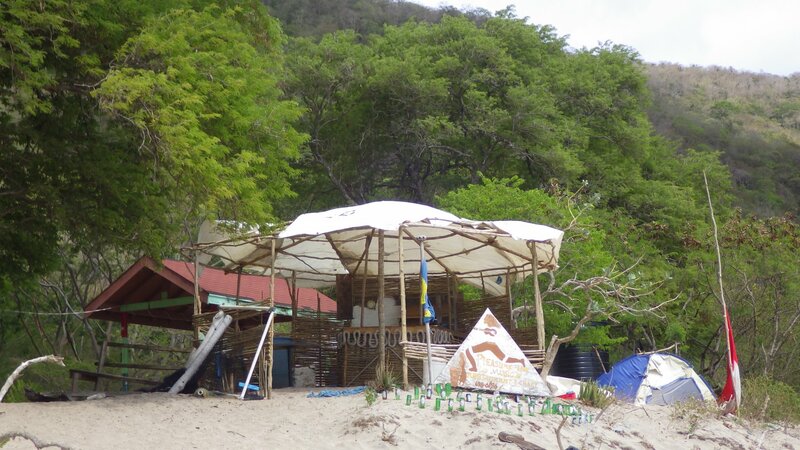 So we decided not to stay overnight and after a short lunch we moved on. 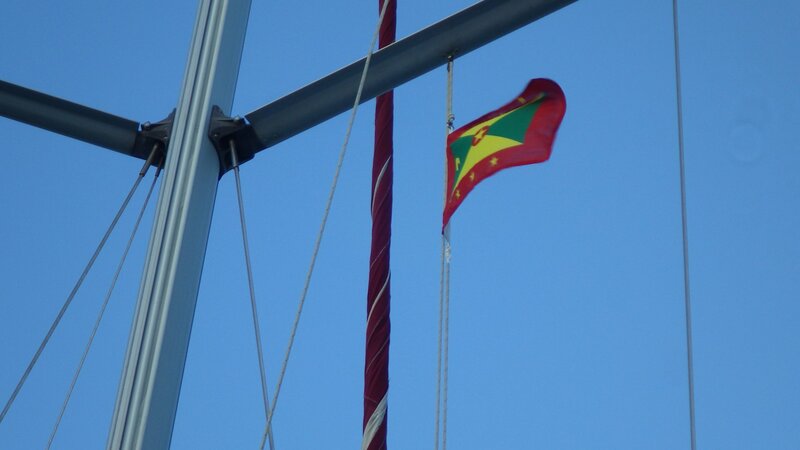 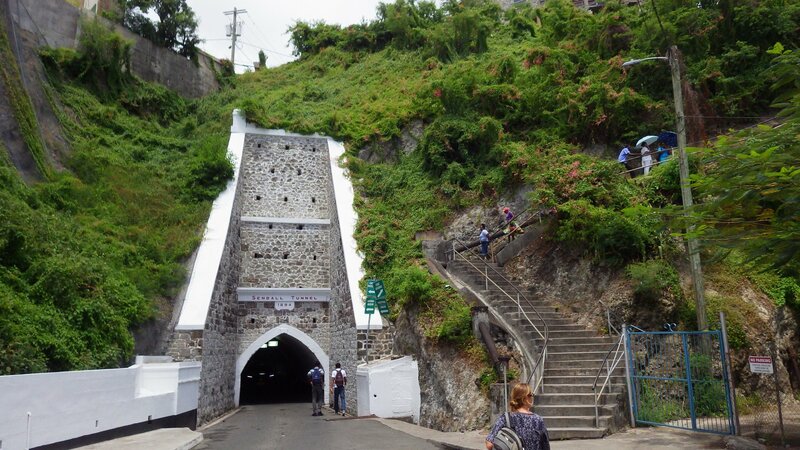 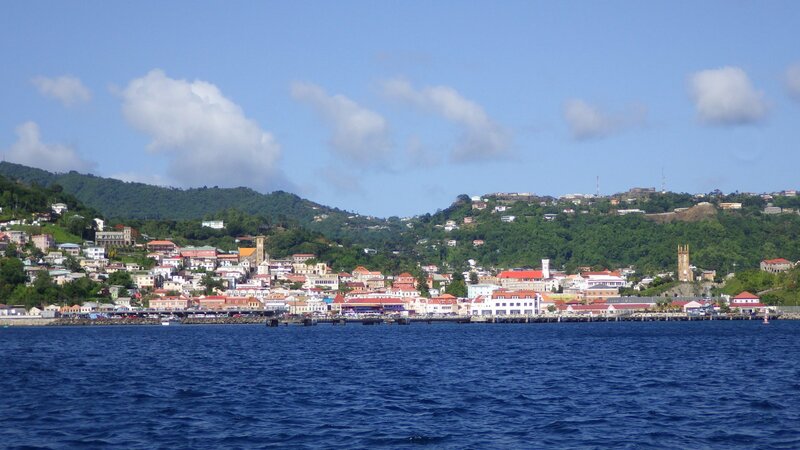 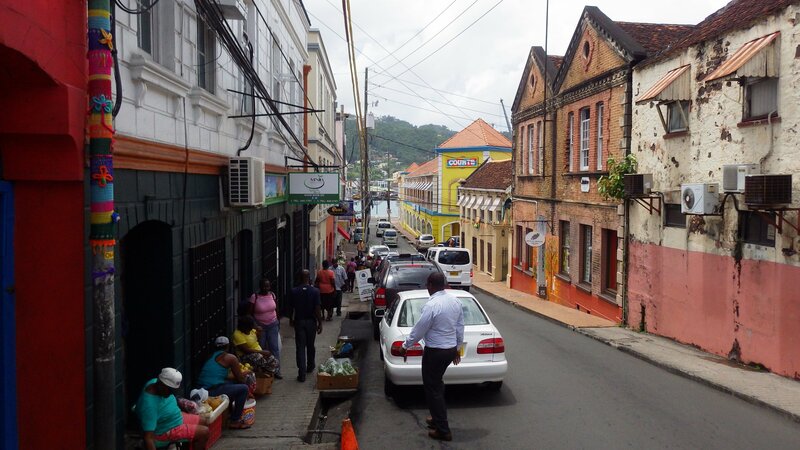 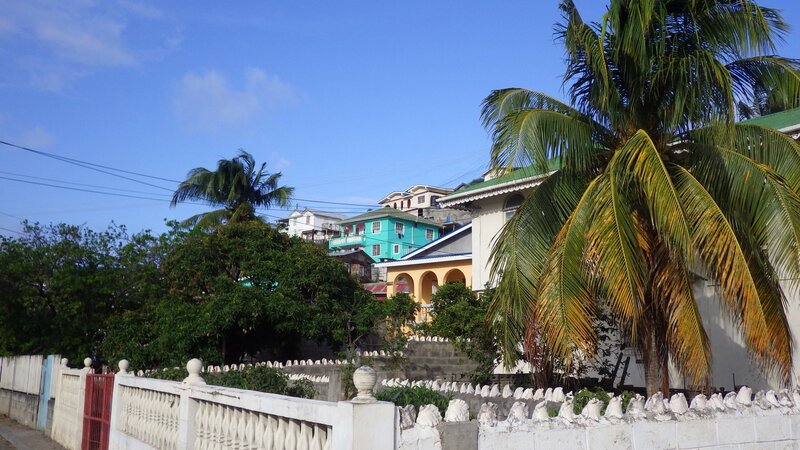 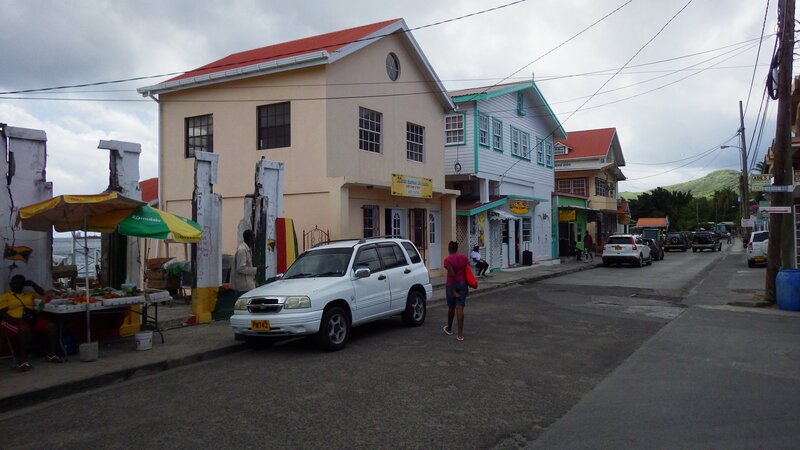 St. Georges is the capital of Grenada. 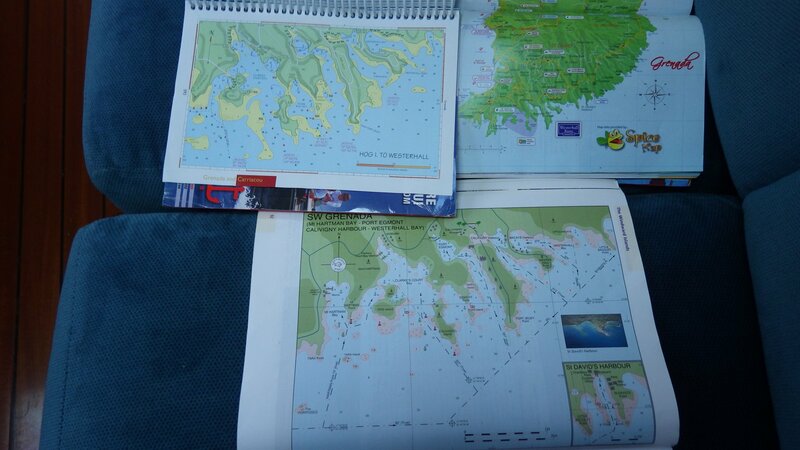 You are no longer allowed to anchor in the inner harbour, so we had to stay at the outside anchorage. 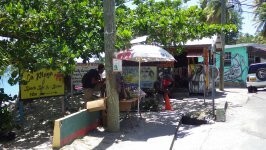 The place is busy, with a local character. 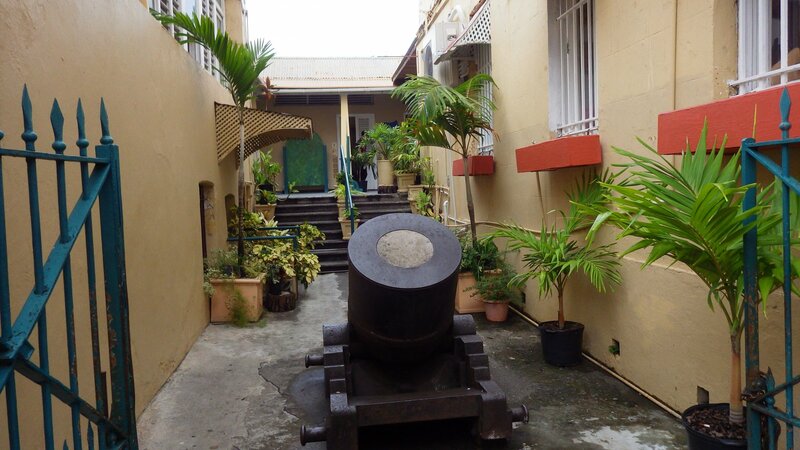 We walked along the old historical streets, got some fresh produce at the market and some boat stuff at the chandlery. 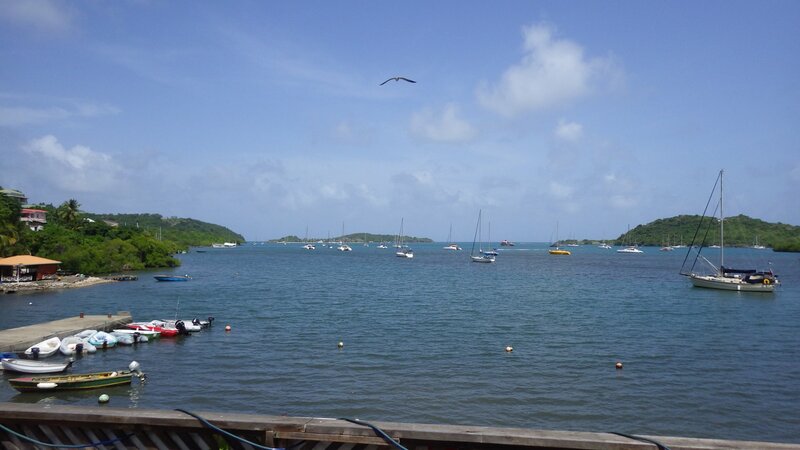 From St. Georges, we sailed around the Pt. 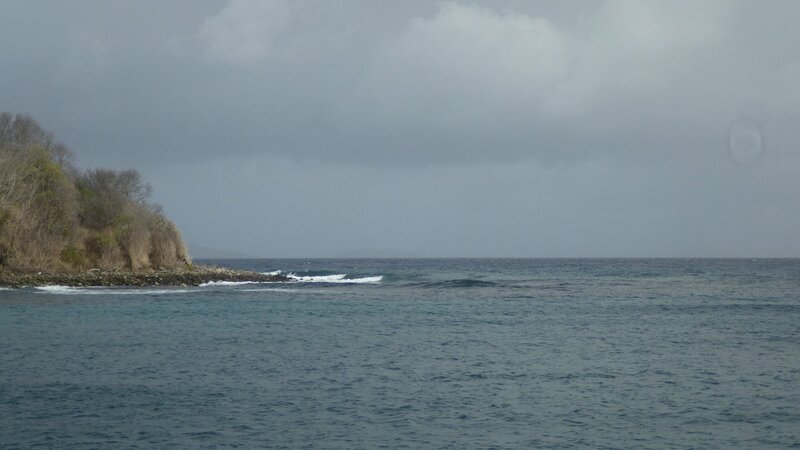 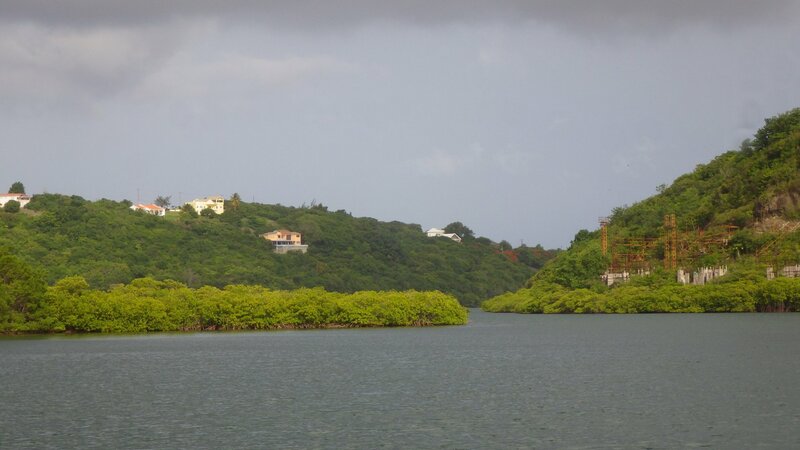 Saline to the south coast of Grenada. 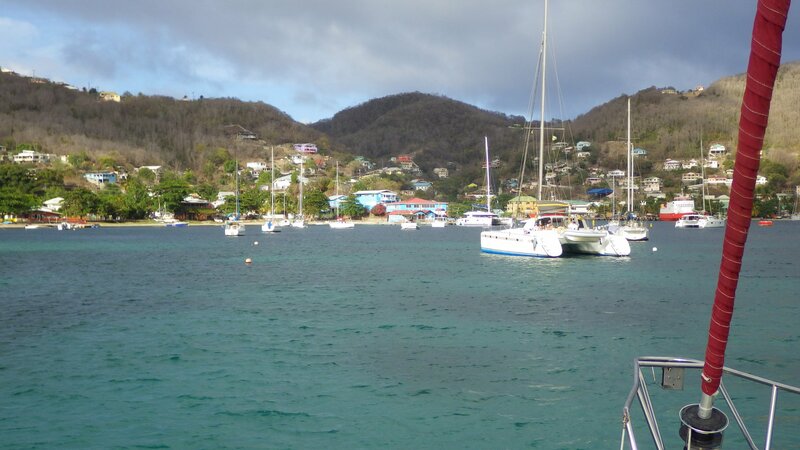 We wanted to stay at True Blue Bay, but on arrival I have found that good anchoring area has been seeded with mooring balls. 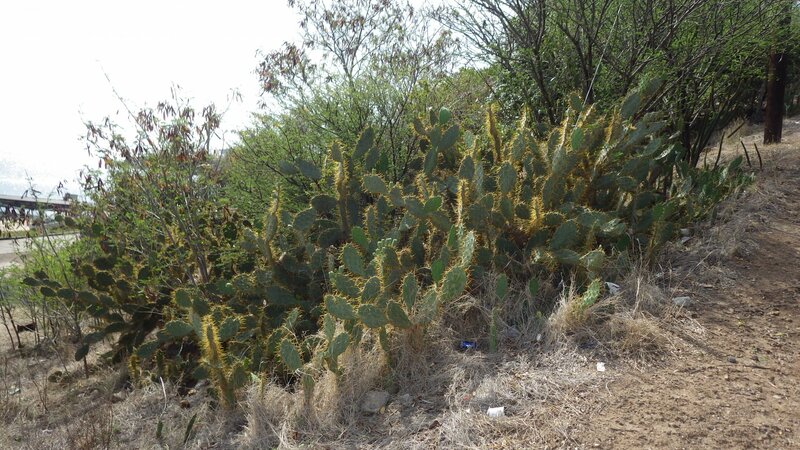 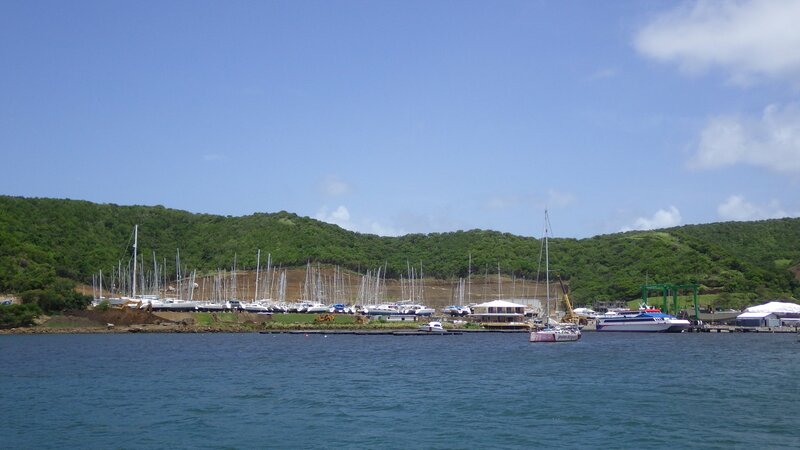 After circling around, we moved to the next bay just around the corner � Prickly Bay. 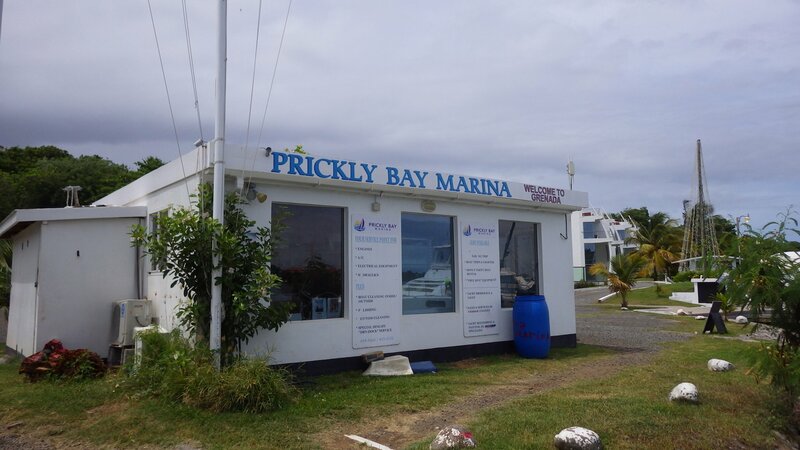 Stayed couple nights at Prickly Bay. 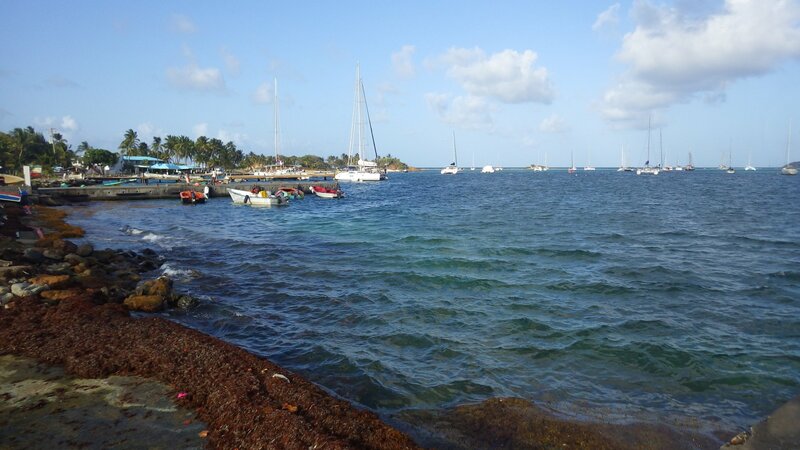 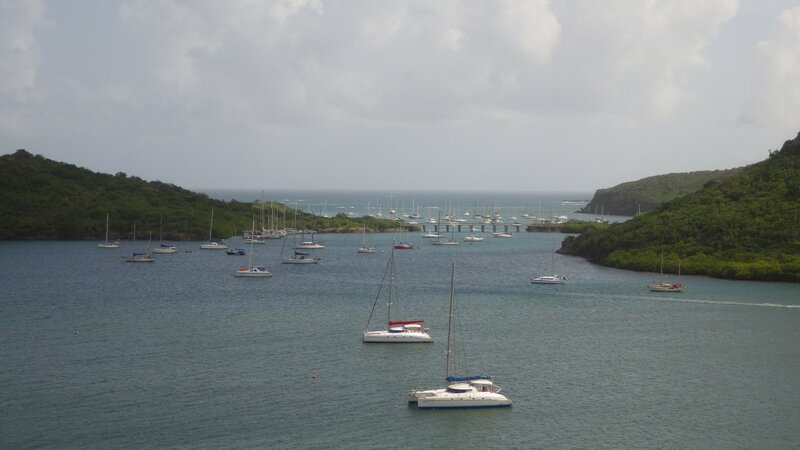 It is a popular bay and many cruisers spend the hurricane season here and the surrounding area. 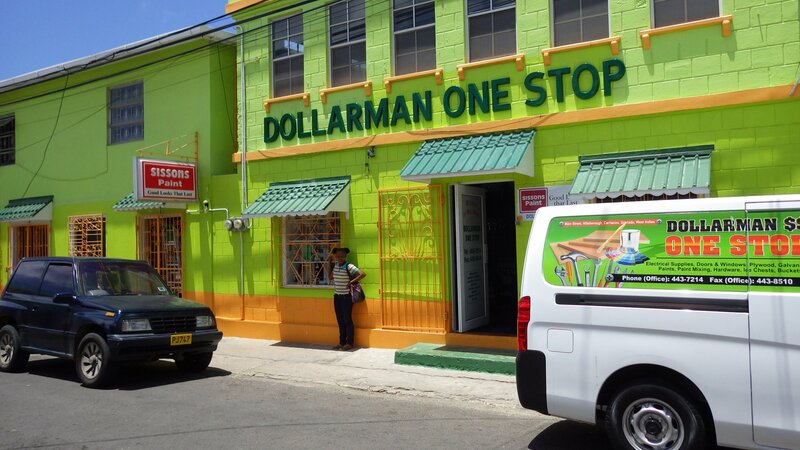 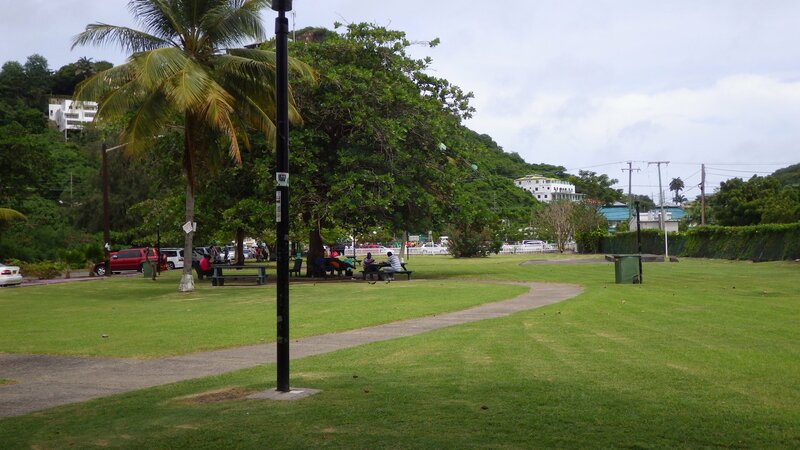 One day took an easy short bus ride to the Grand Anse area, where we visited the local mall, picked up some takeout food and had a nice lunch at the waterfront park. 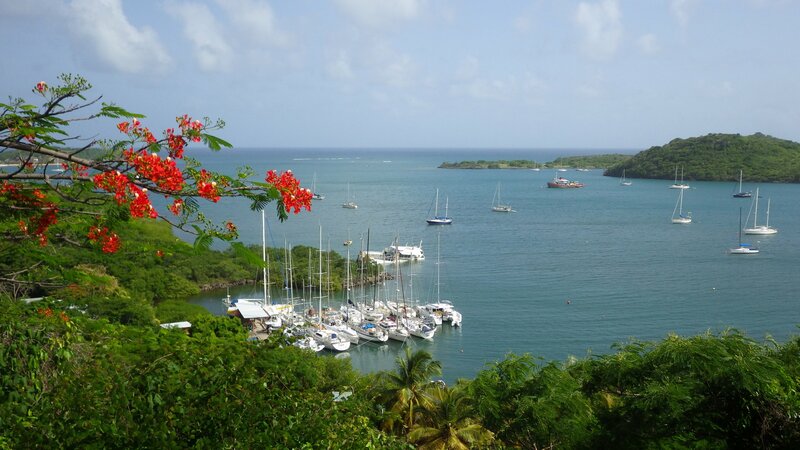 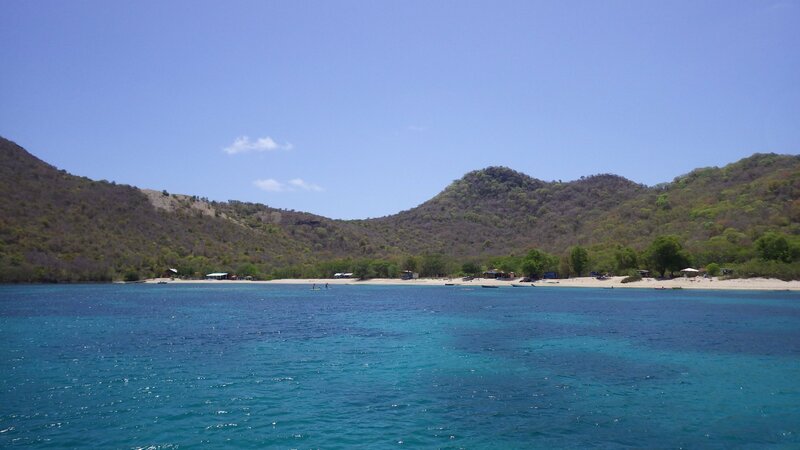 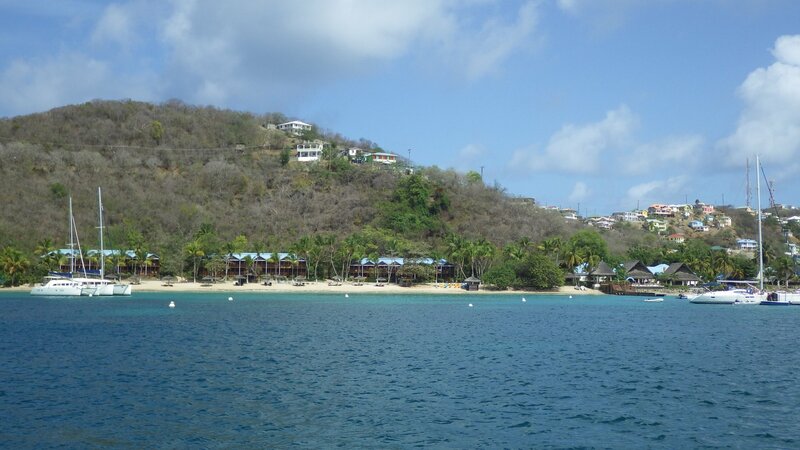 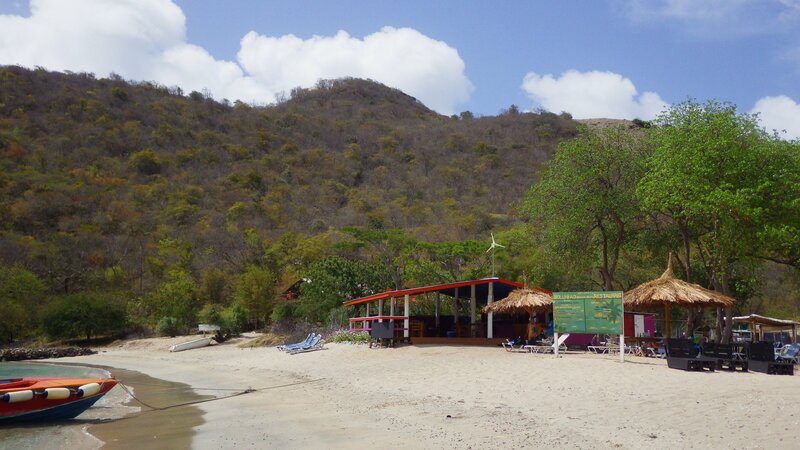 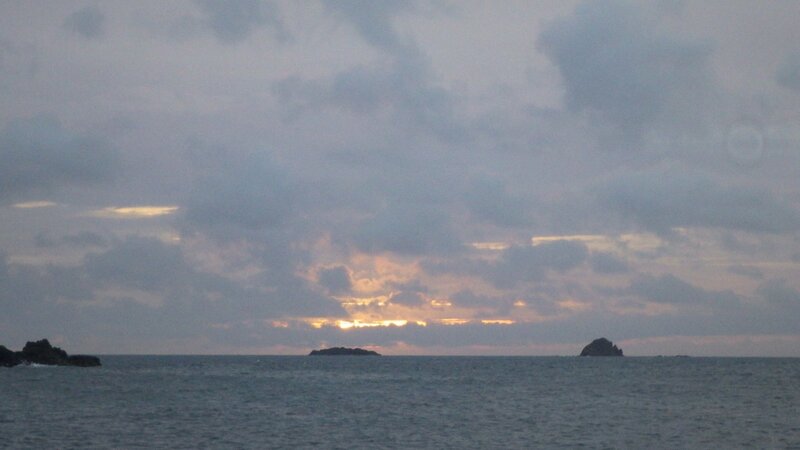 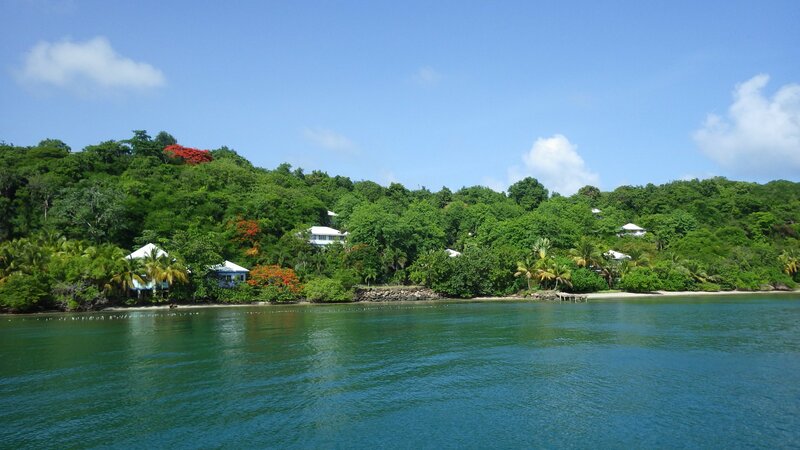 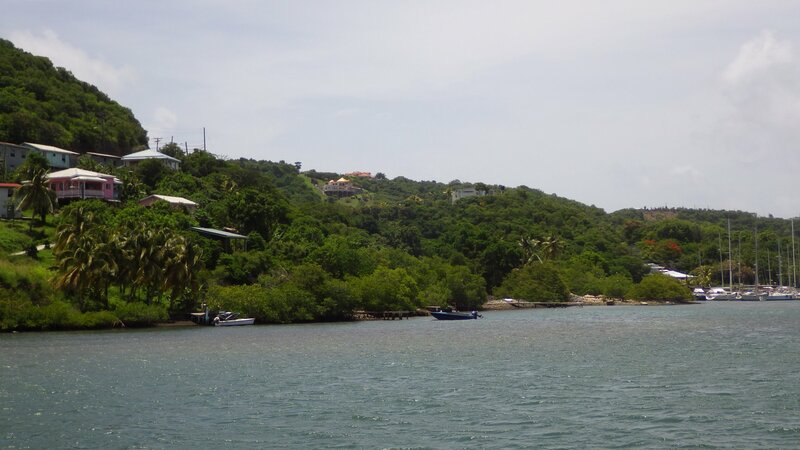 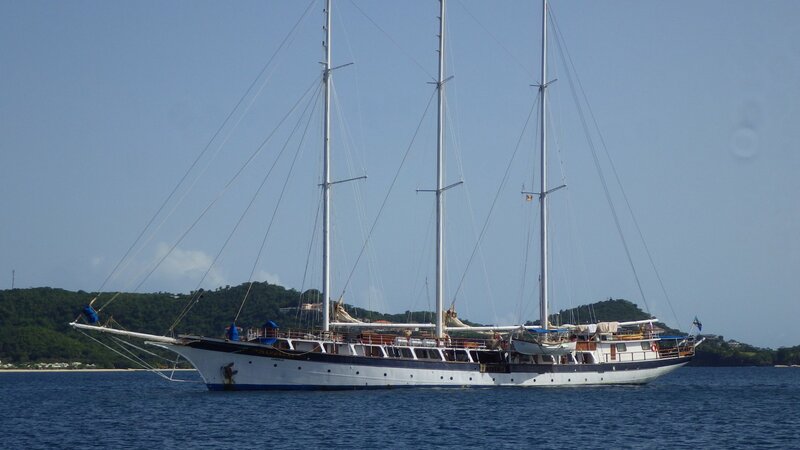 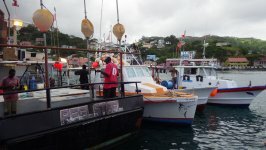 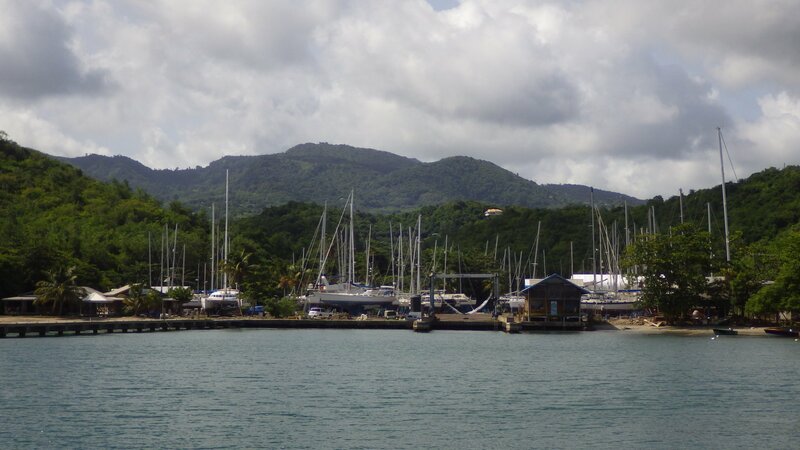 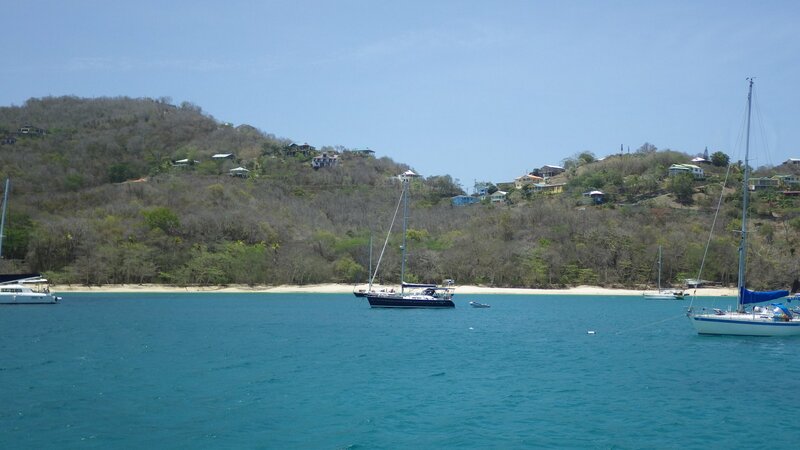 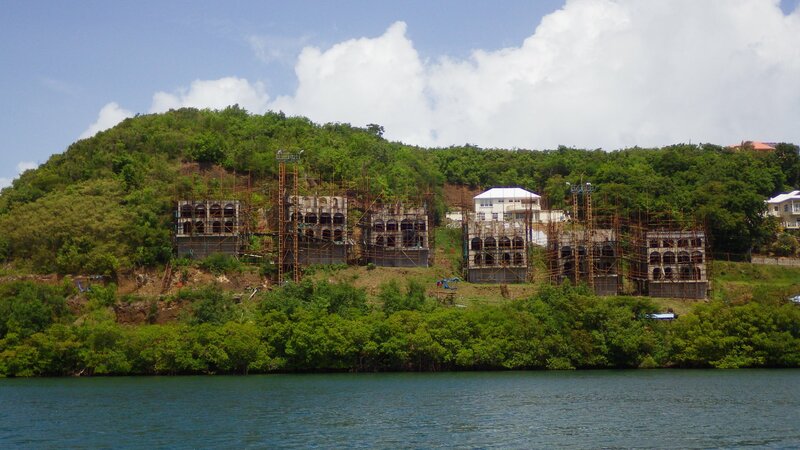 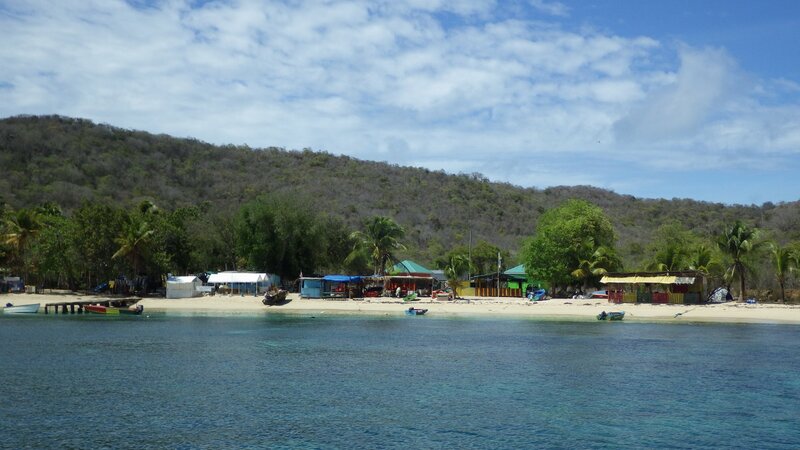 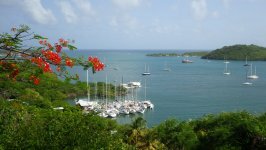 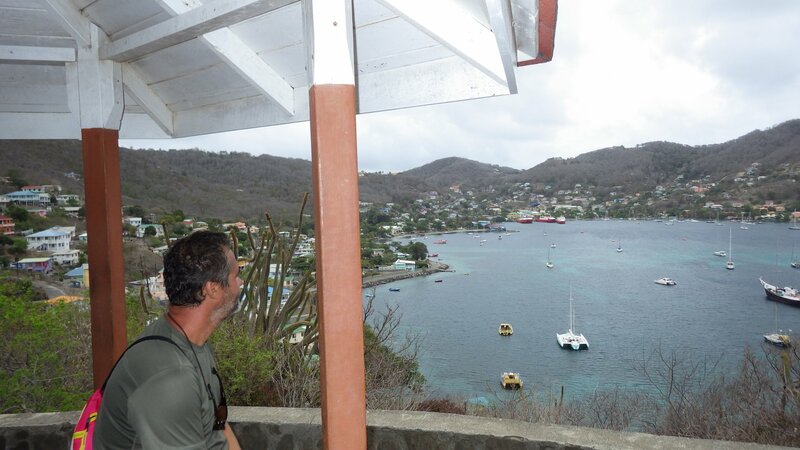 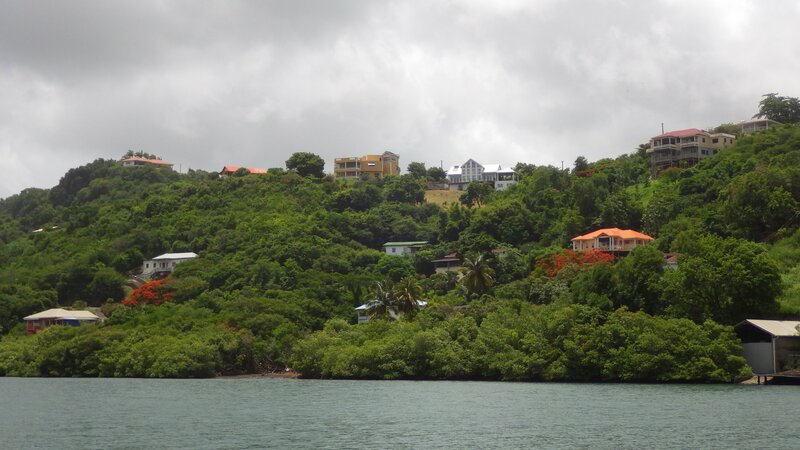 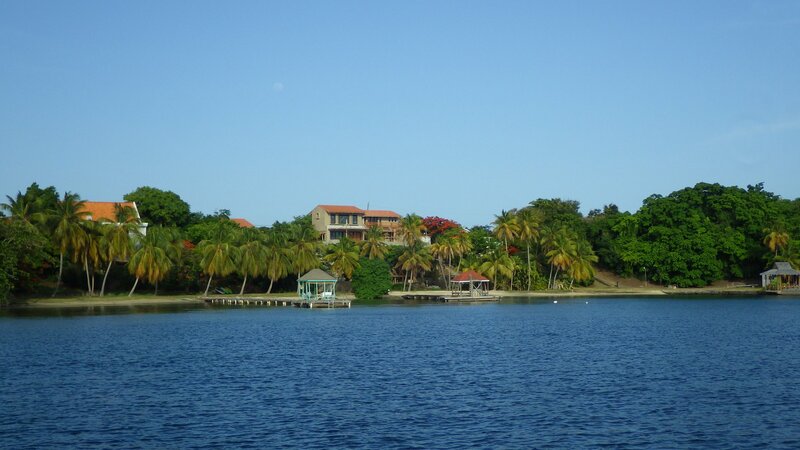 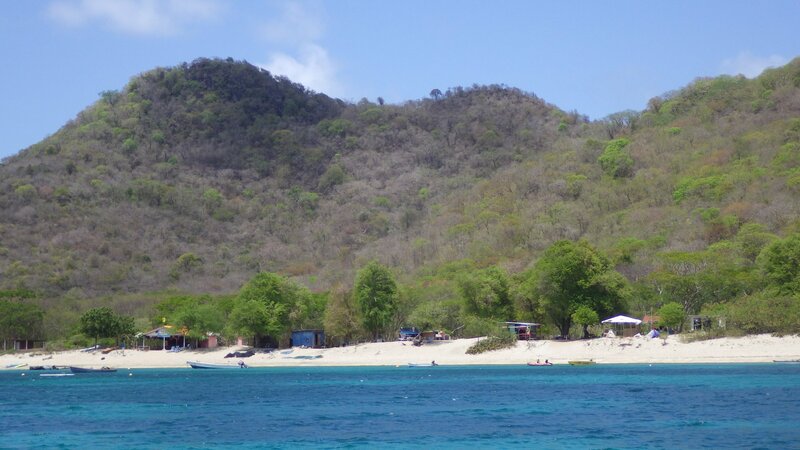 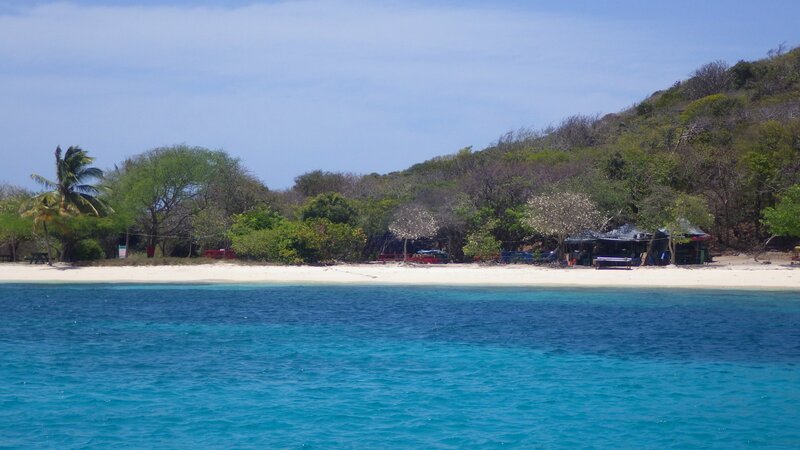 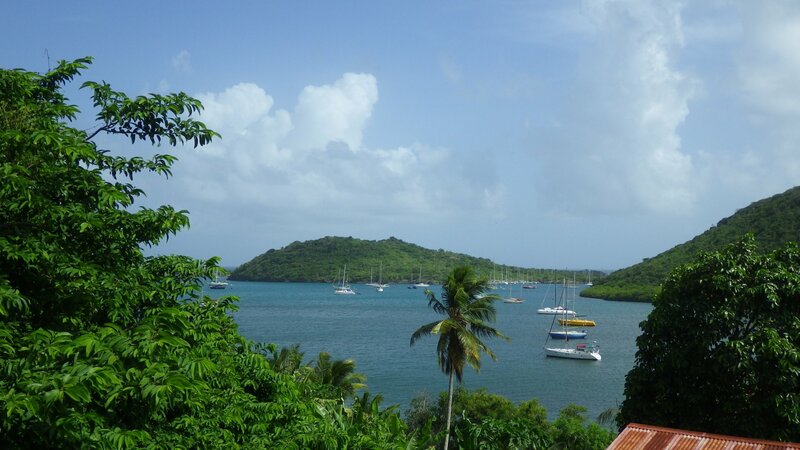 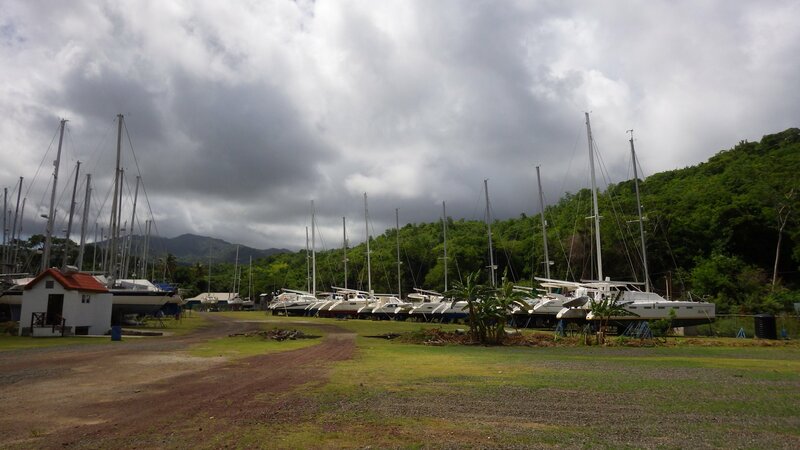 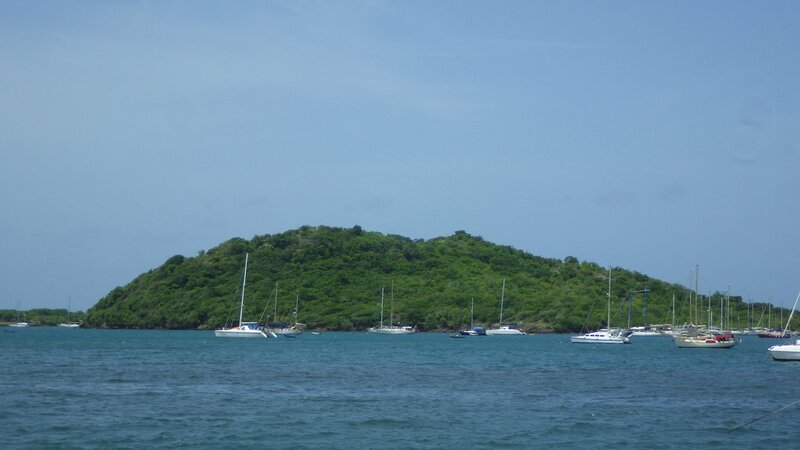 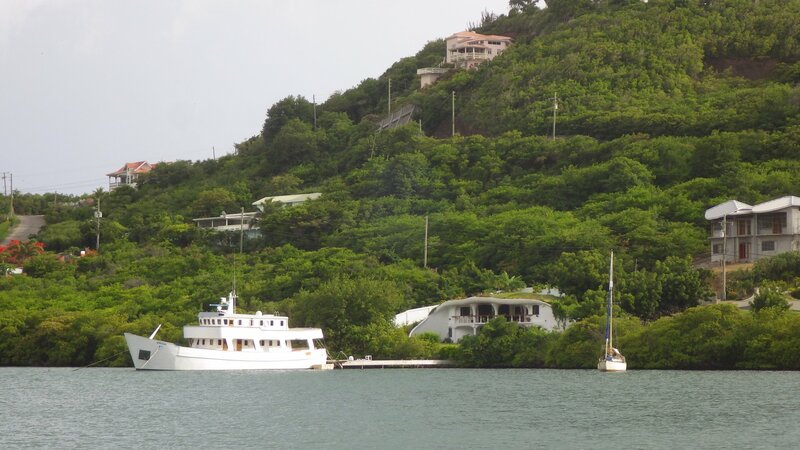 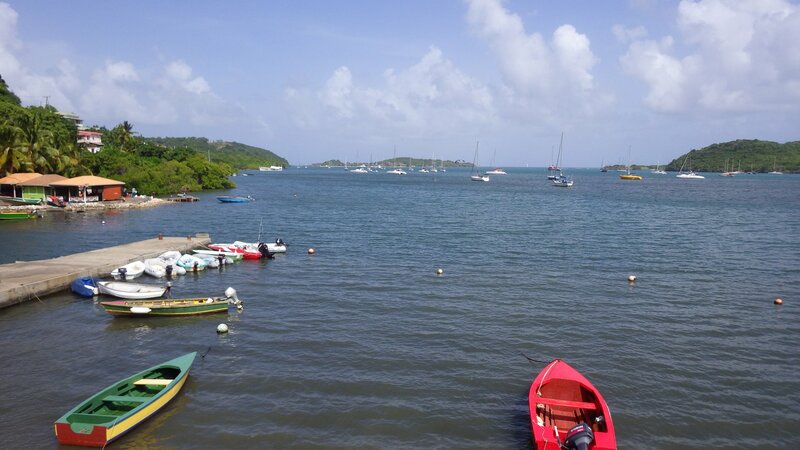 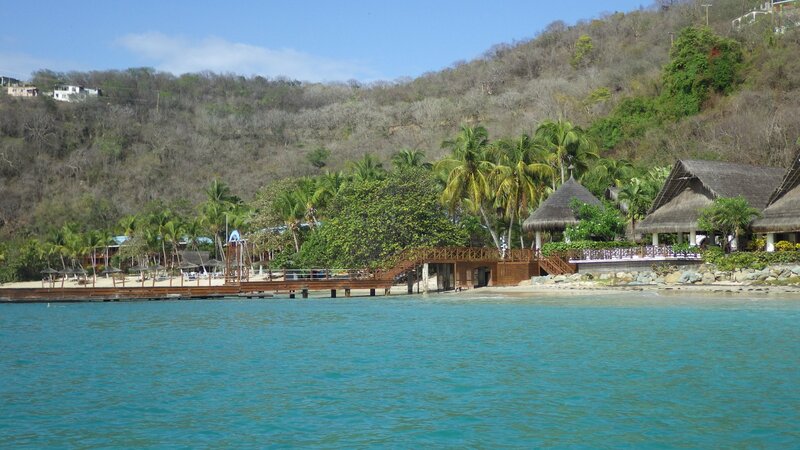 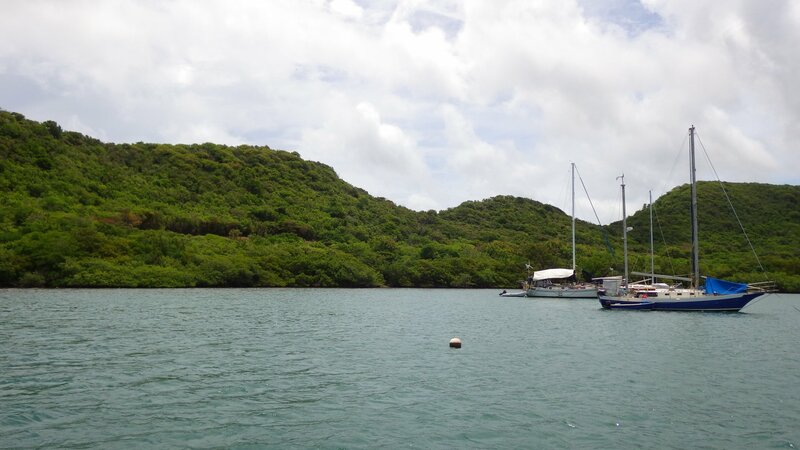 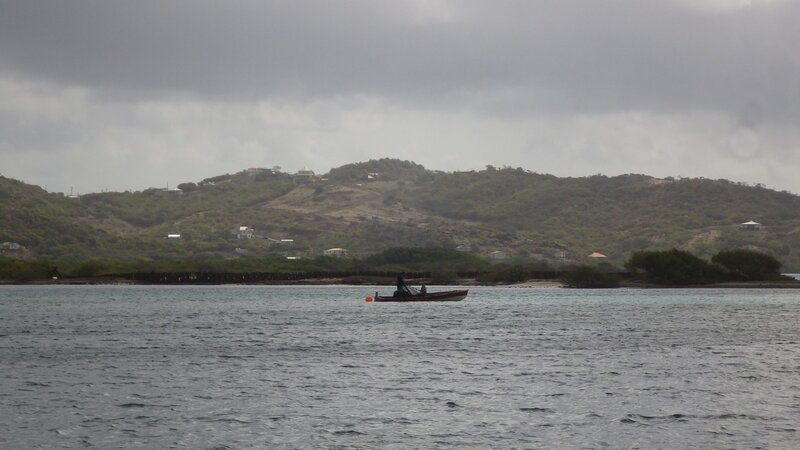 I have read about Hog Island being a center of the Grenada's cruisers activity. 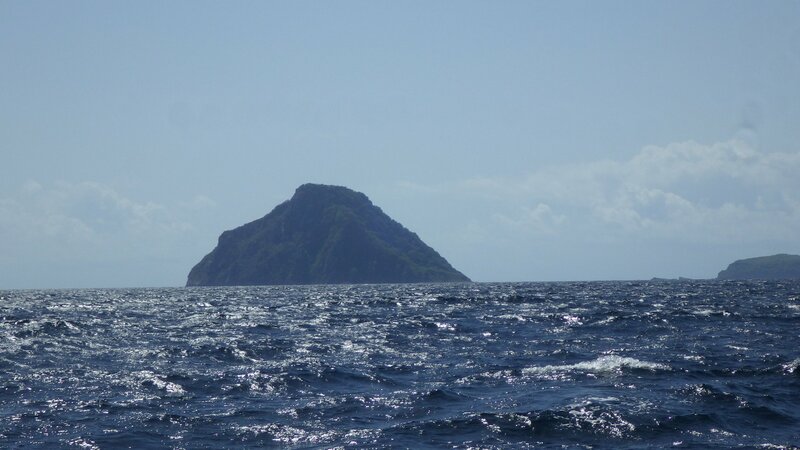 We came here to celebrate Fathers Day, hoping for a god fun at the island. 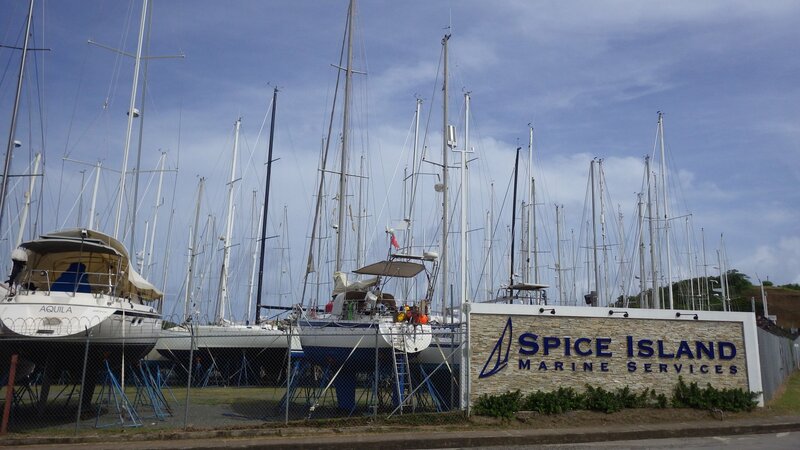 Unfortunately, upon arrival I did not find it to be an attractive place. 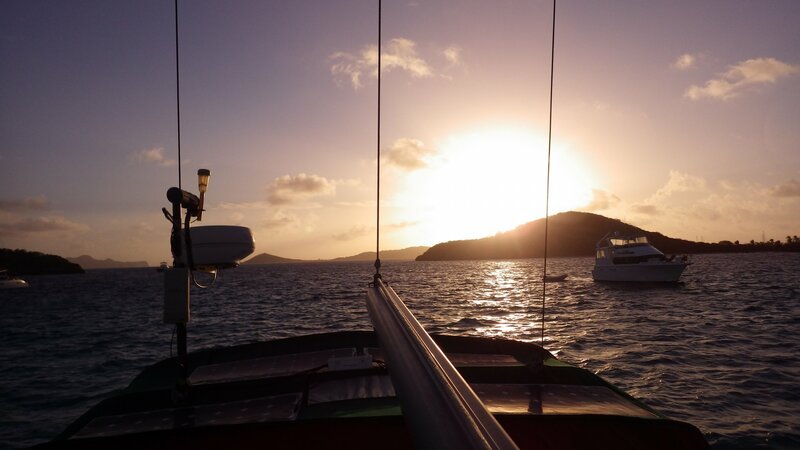 There was no life in the evening so we went back to the yacht to cook our Fathers Day dinner. 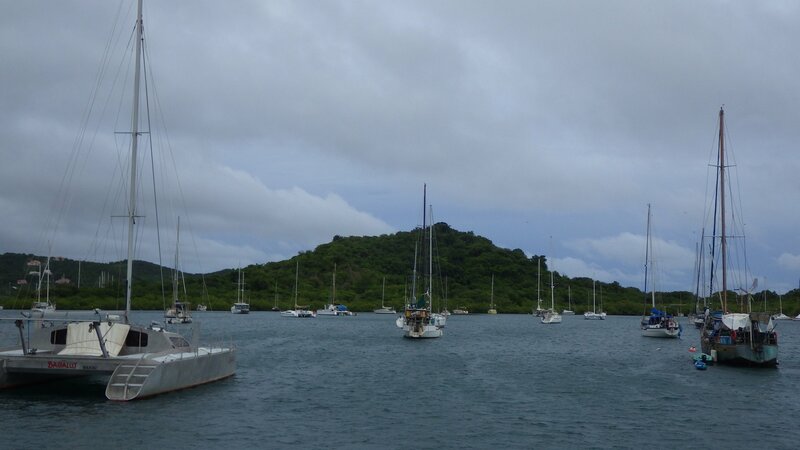 The anchorage is full with permanent fixture boats and we haven't seen any of the activities on this small island. 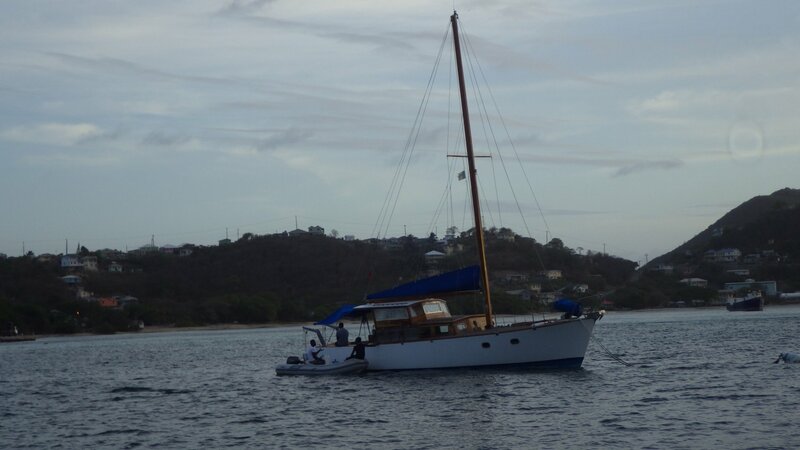 On the plus side, the anchorage here (if can find a spot) is very calm and it was a pleasant stop after few rolly bays we've visited just before. 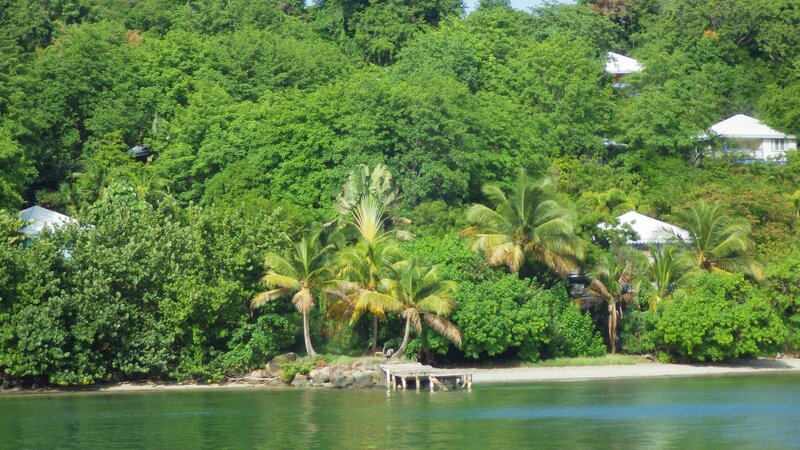 Stayed few days in Clarkes Court Bay. 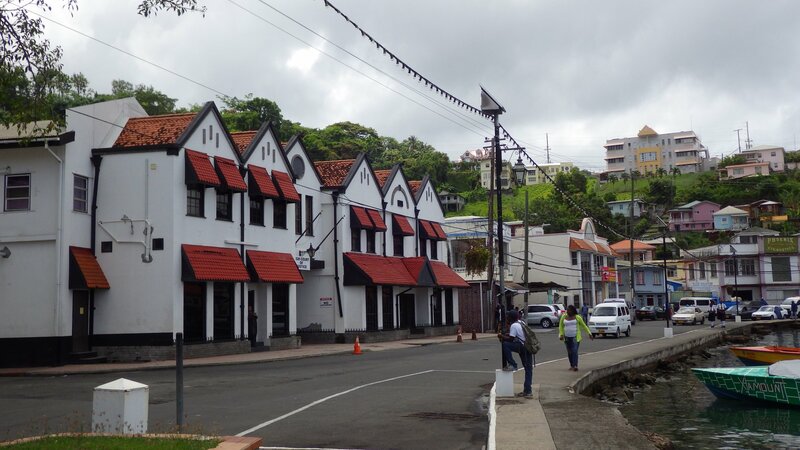 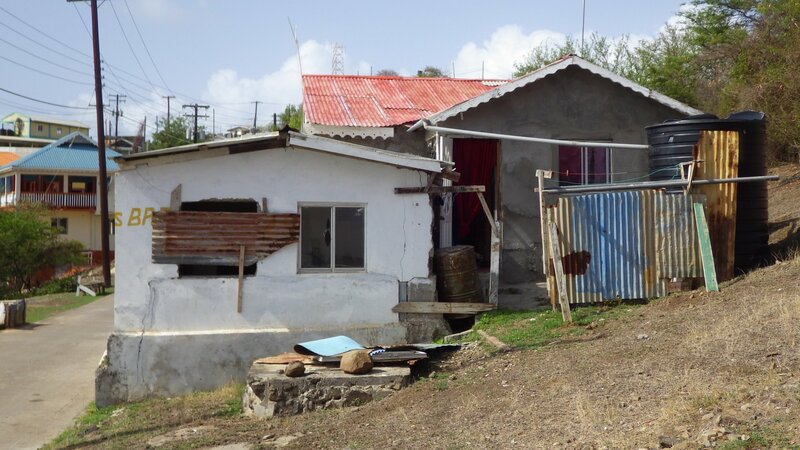 Walked around the small village of Woburn where we visited restaurant, bought some supplies and I gave my old manual windlass to the consignment shop. 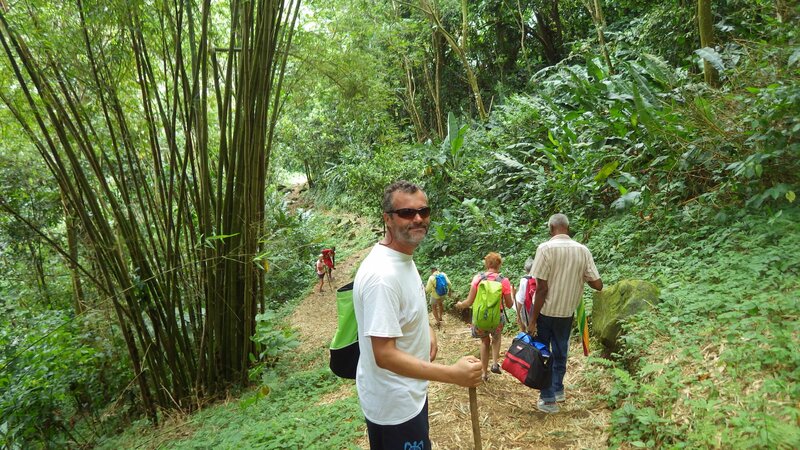 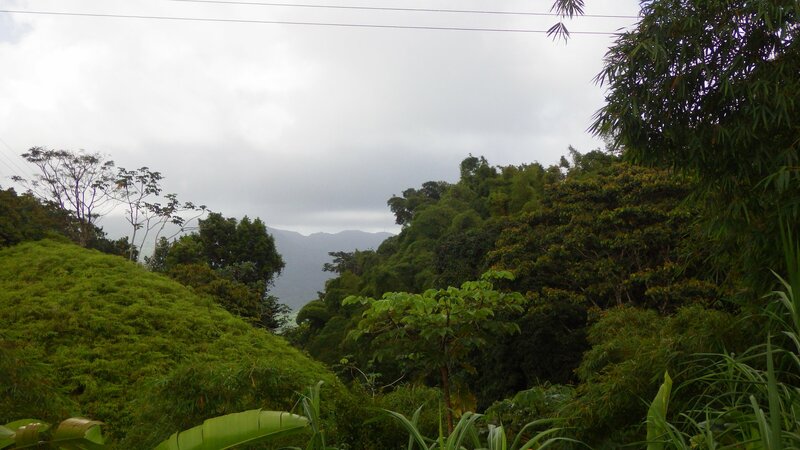 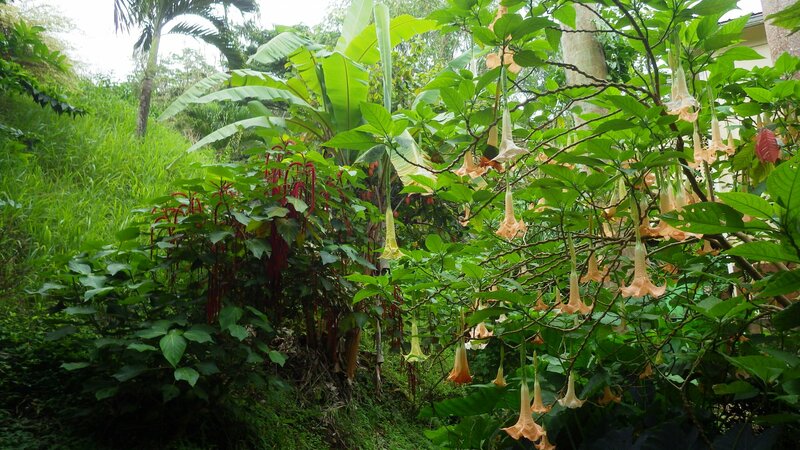 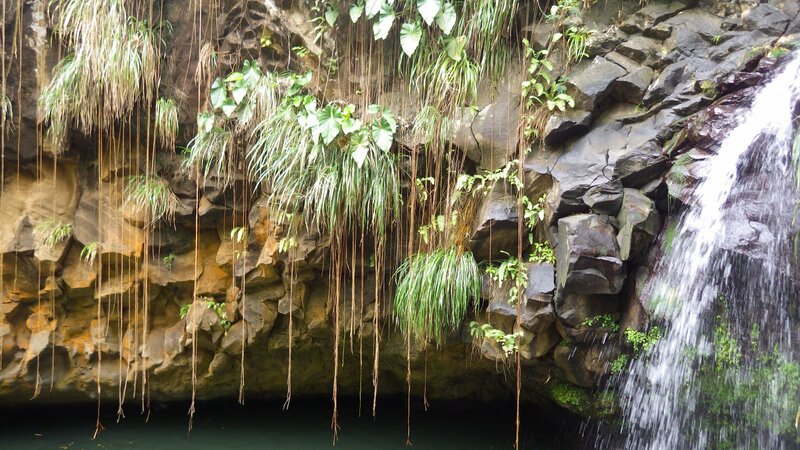 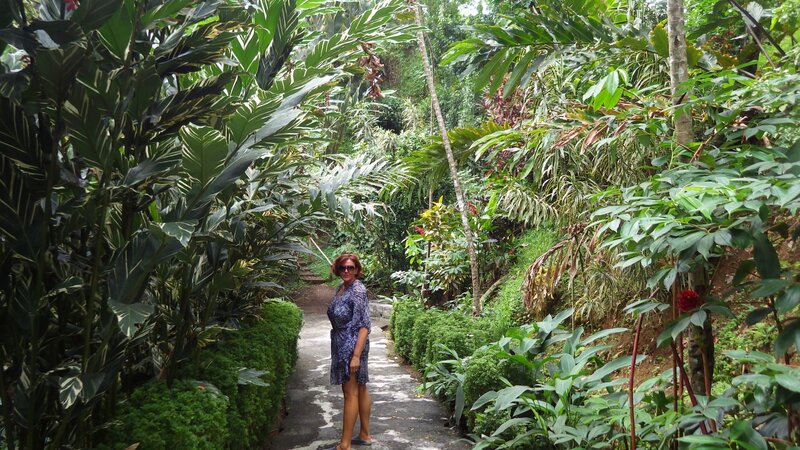 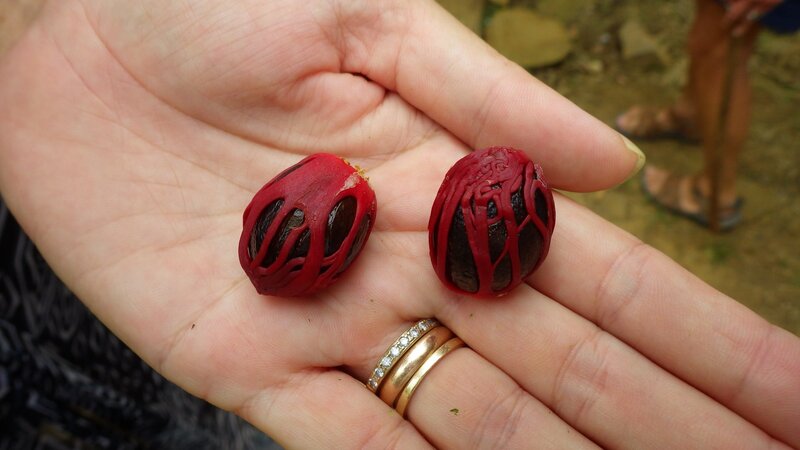 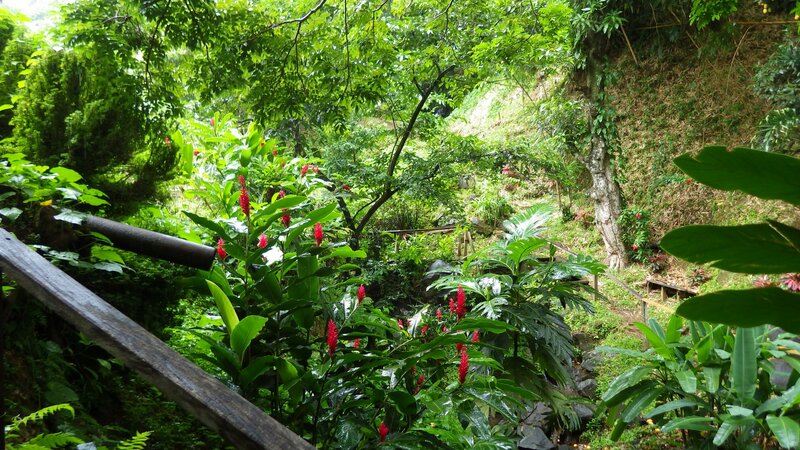 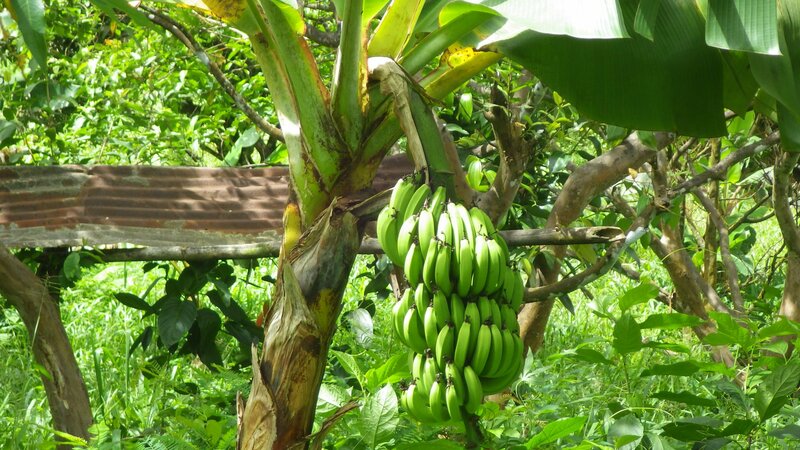 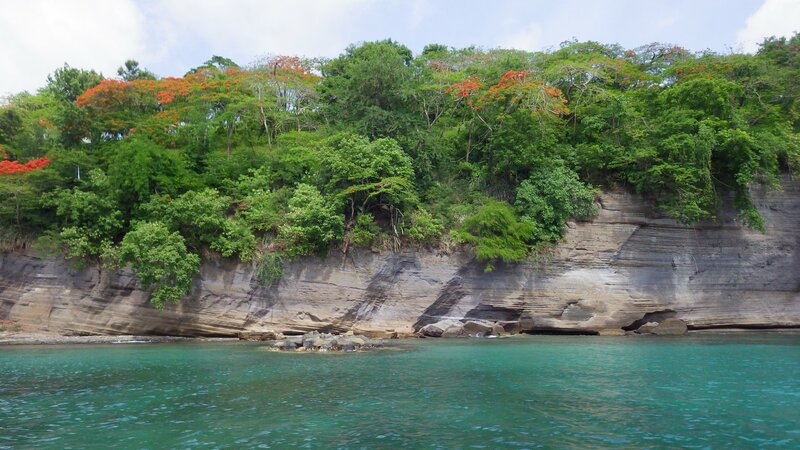 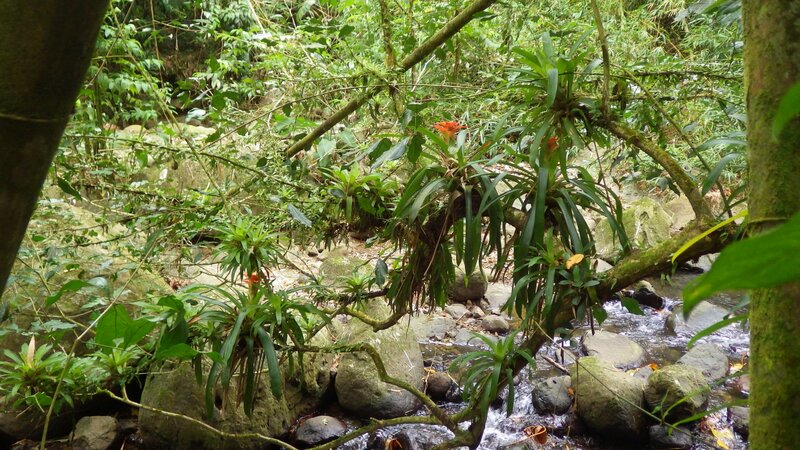 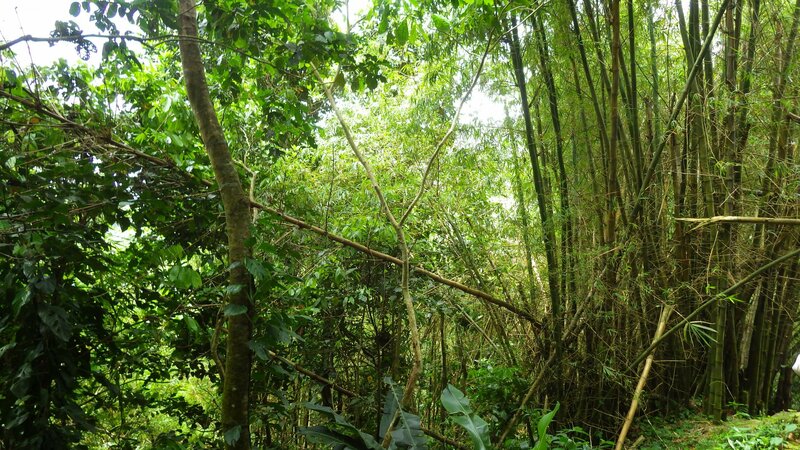 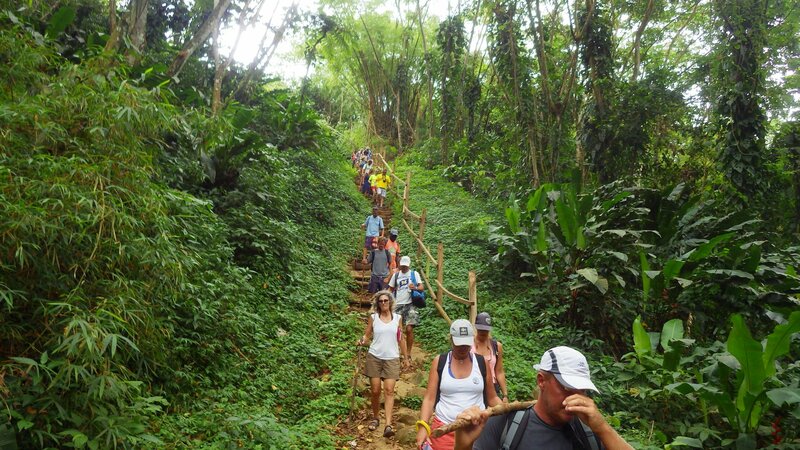 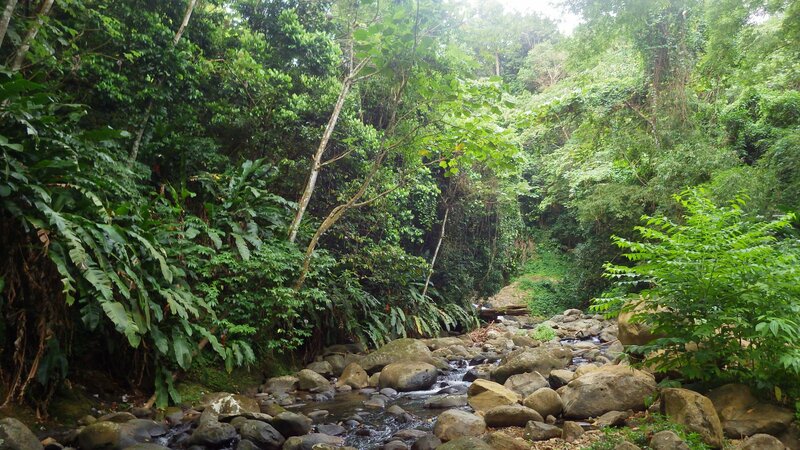 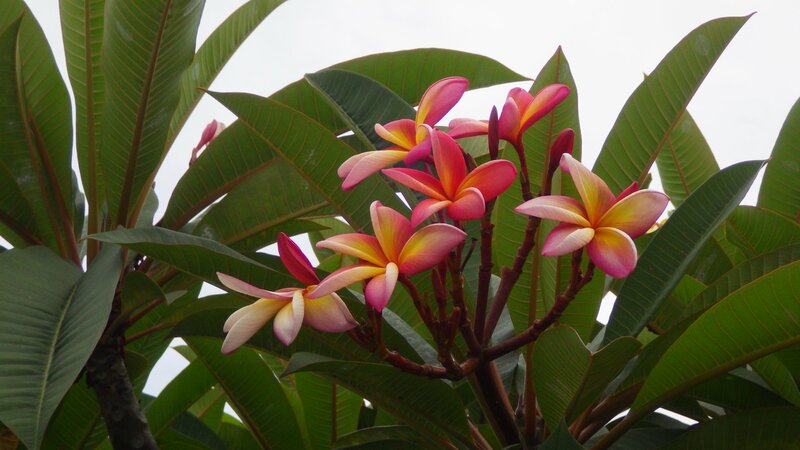 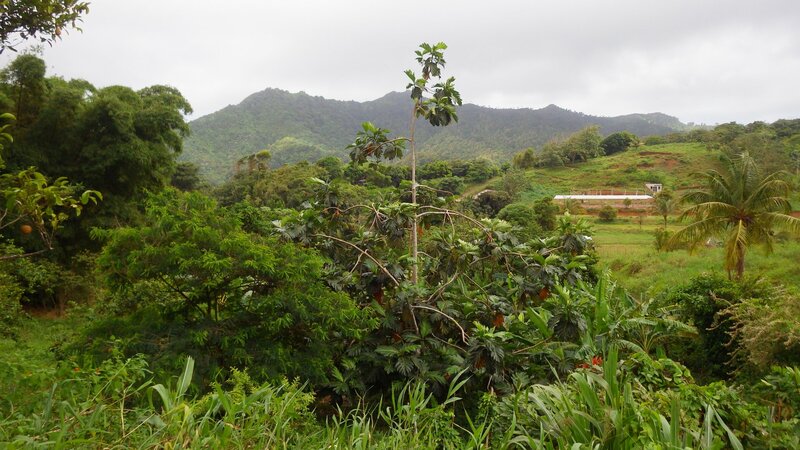 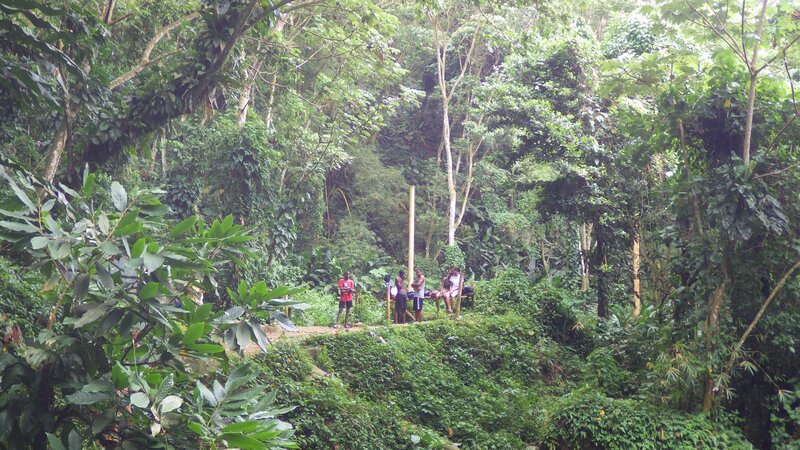 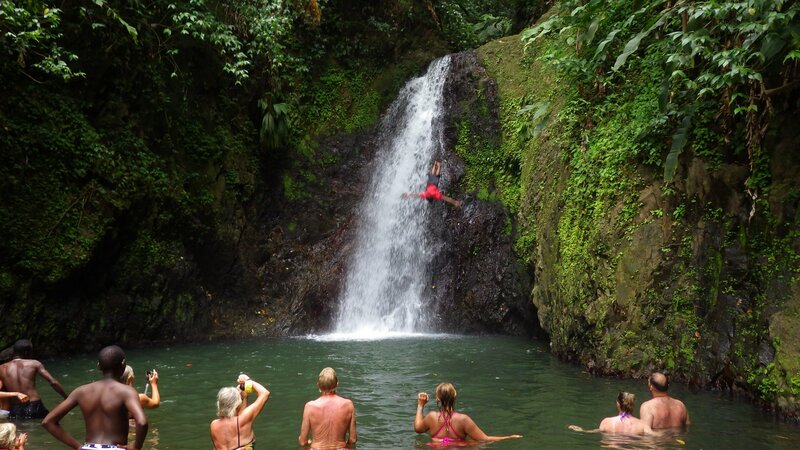 Some of the Grenada's beauties are lush mountains, tropical forests and waterfalls. 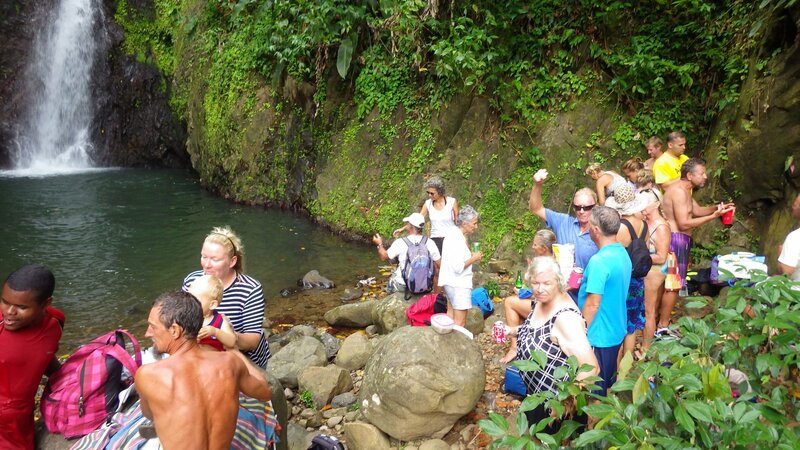 One day we took a trip to the waterfalls, organized by cruisers. 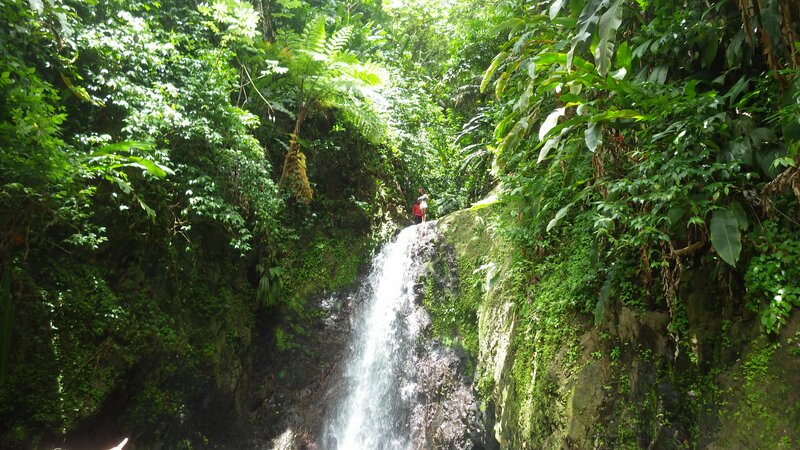 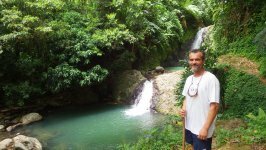 We visited two waterfalls � Seven Sisters Falls and Annandale Falls. 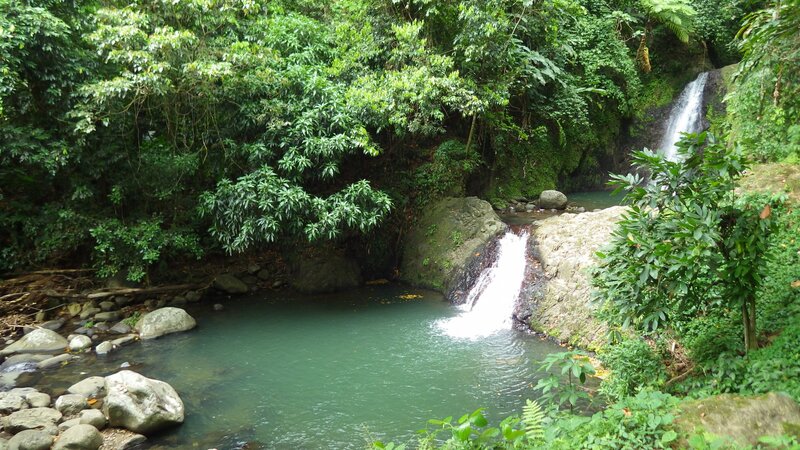 Had a lively one-hour hike in the tropical forest and a refreshing swim in soft waters of the falls. 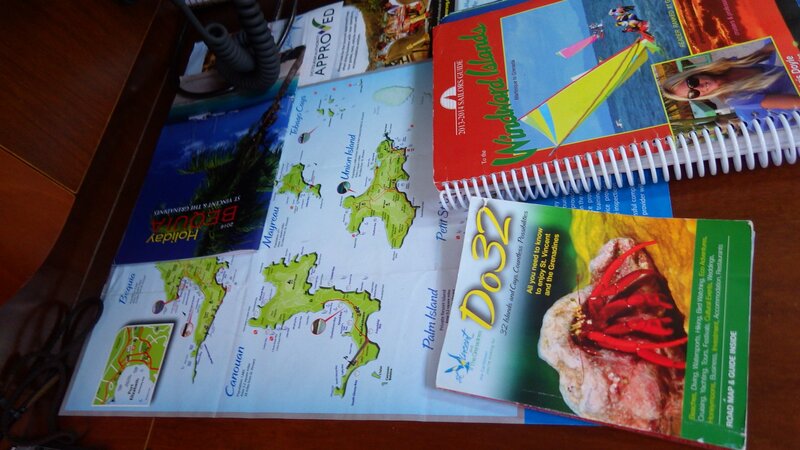 Our travels for this season were coming to the end. 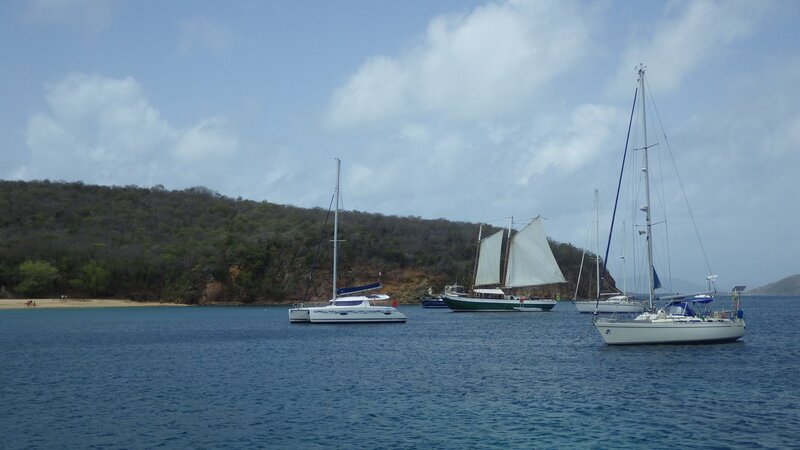 On our way to haul-out, we stopped in a calm bay not often visited by boats. 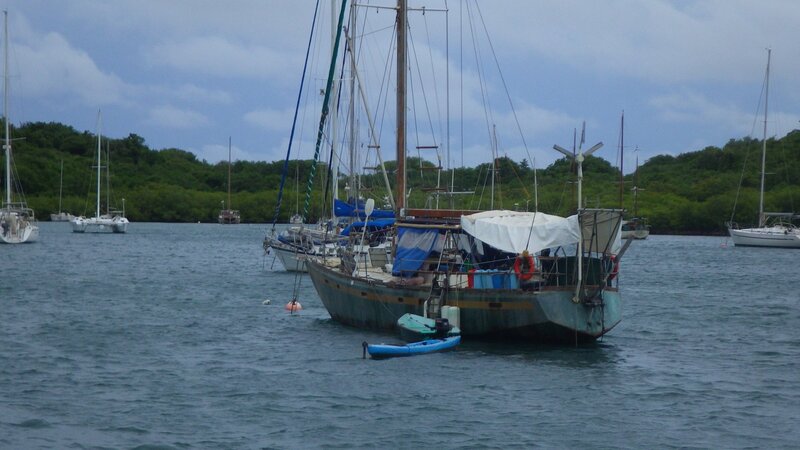 Stayed few days here, enjoying solitude and preparing the boat. After staying one night at the anchor nearby, we haul-out our yacht on hard for the season. 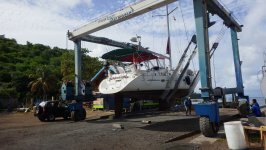 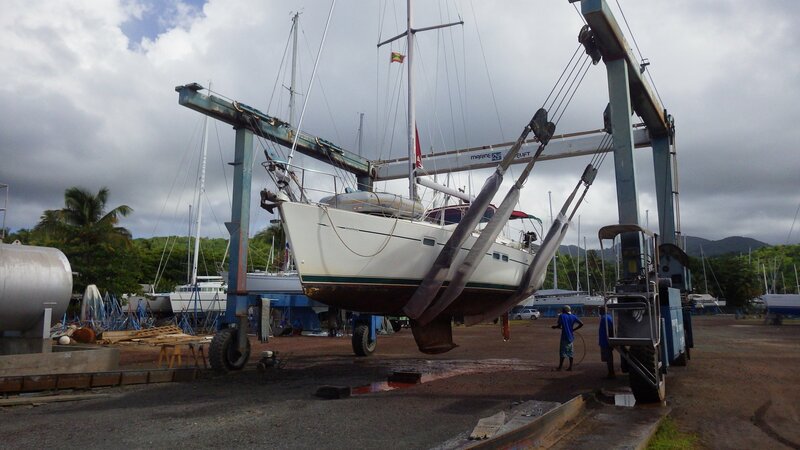 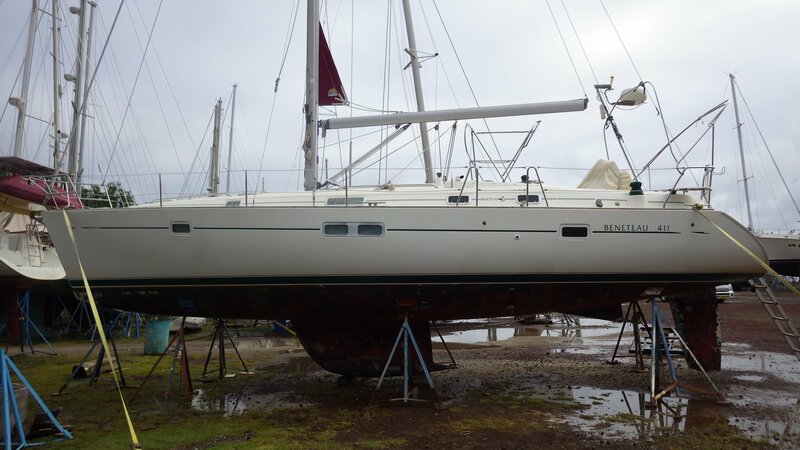 We will schedule some work to be done on the yacht by the yard � the bottom job is well overdue - and then fly back home until late fall.